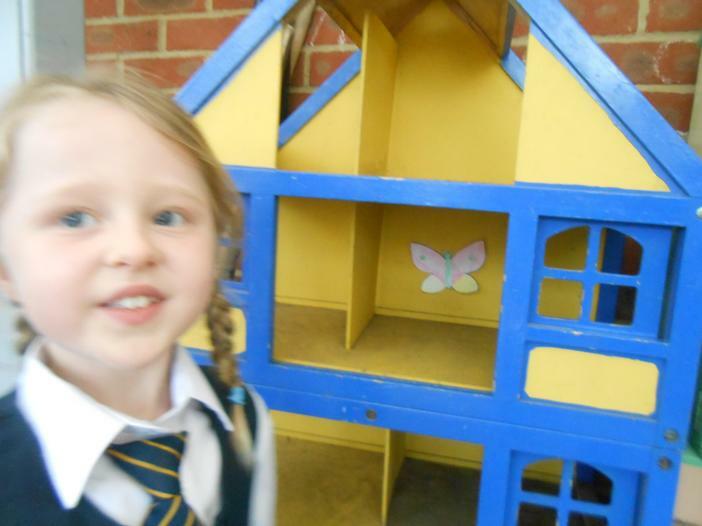 Welcome to 1BH's home page. 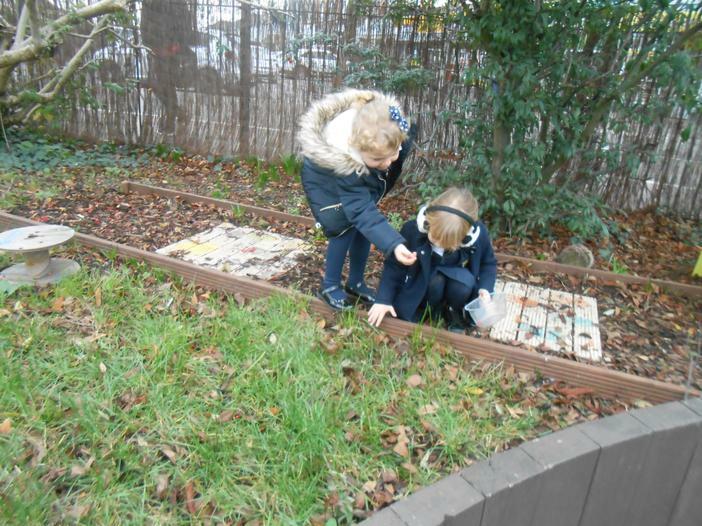 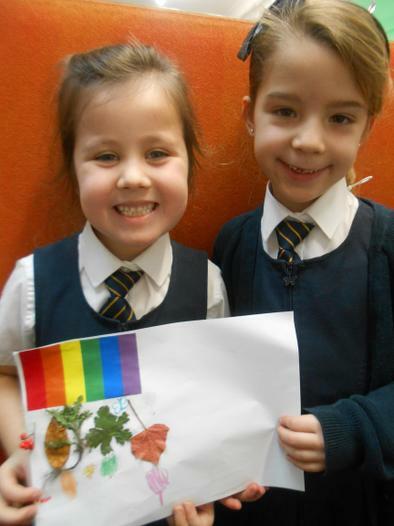 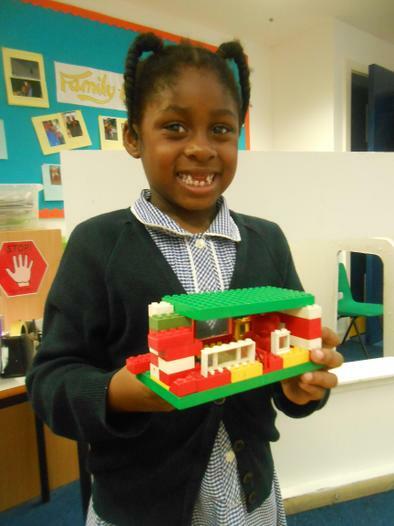 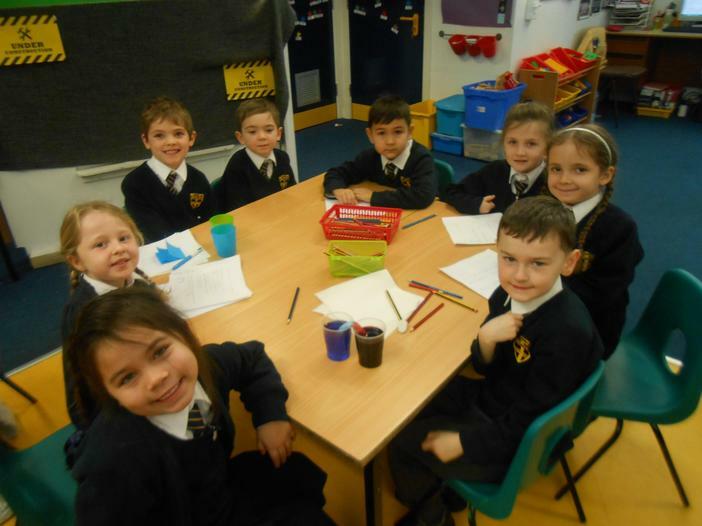 We hope you enjoy looking at what we have been learning in school. 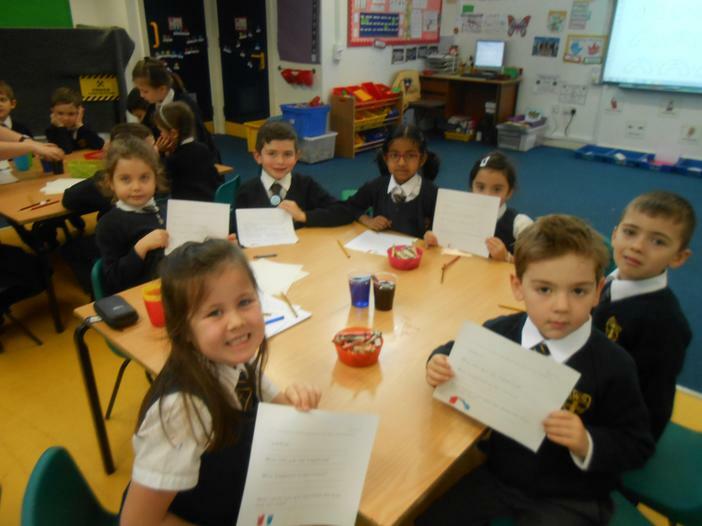 Mrs Belsham and Mrs Hills are our class teachers, Mrs Lask is our class teaching assistant and Miss Austin will also work in our class. 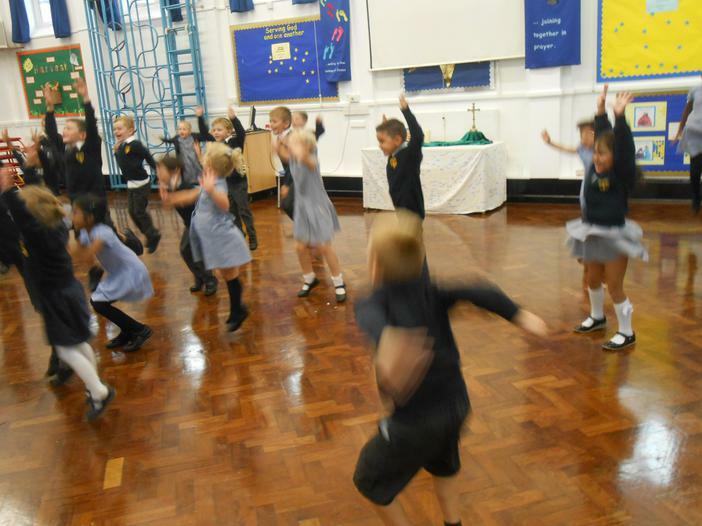 PE is on a Tuesday (inside) and Friday (outside. 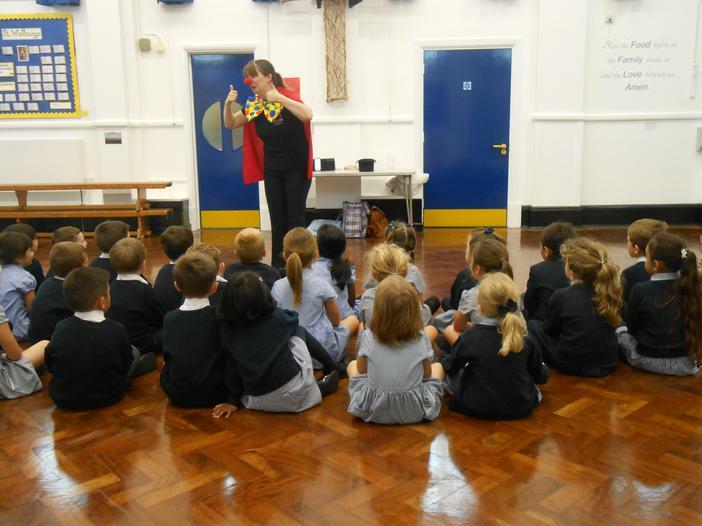 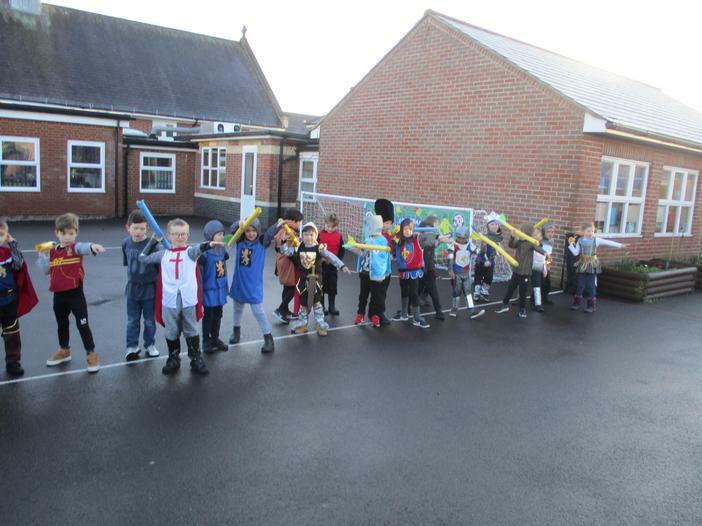 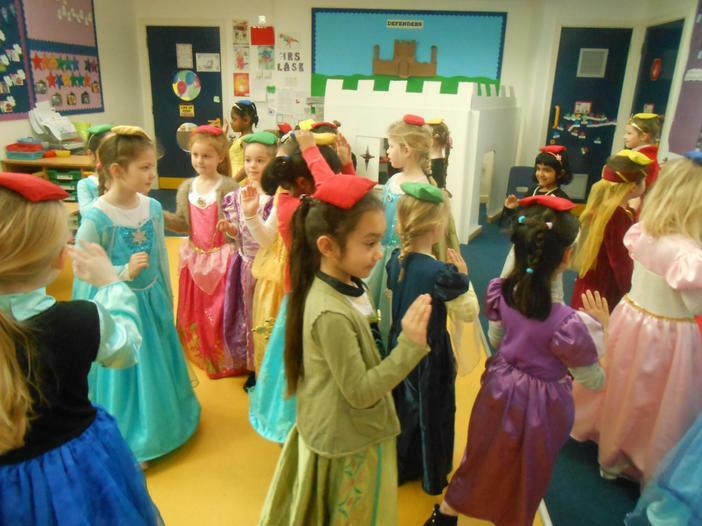 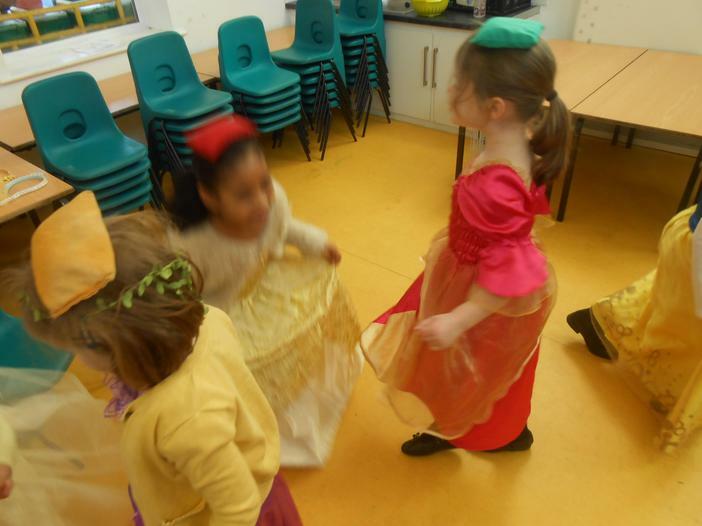 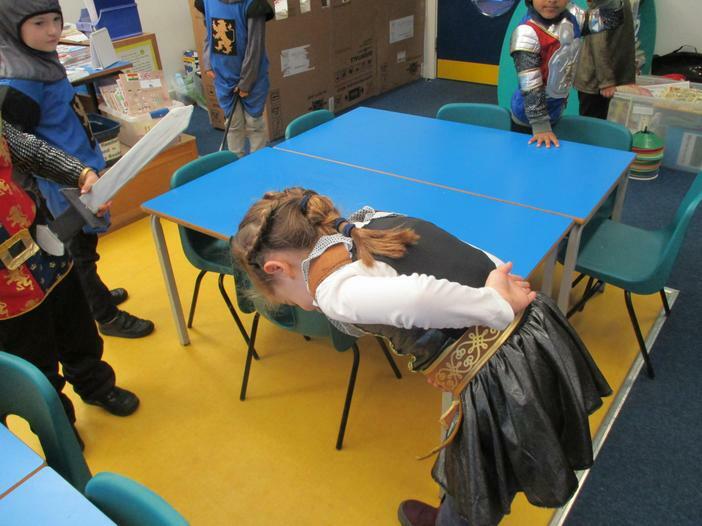 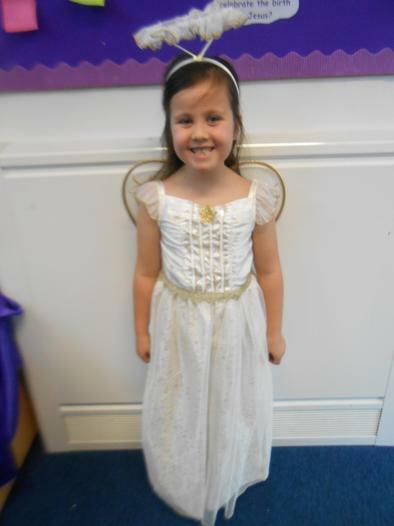 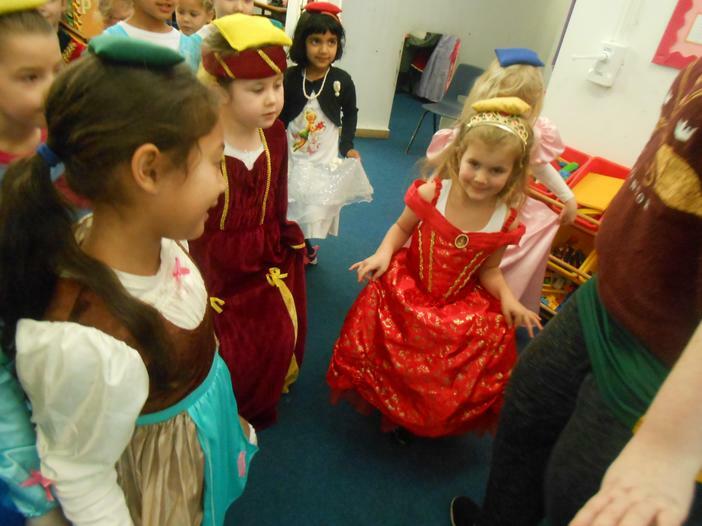 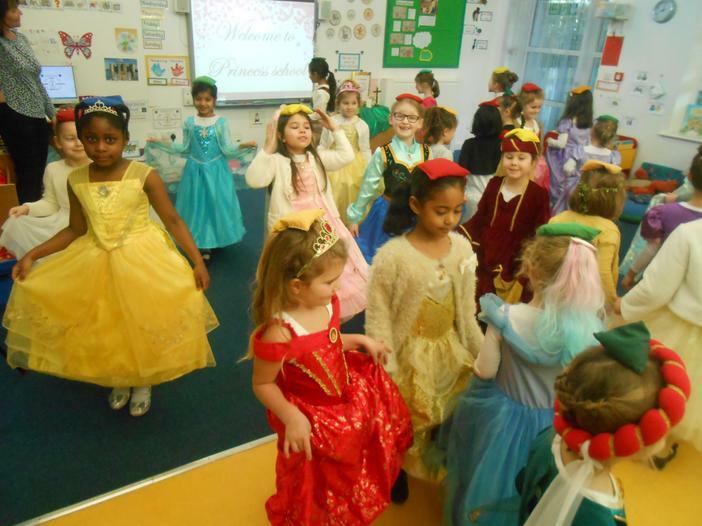 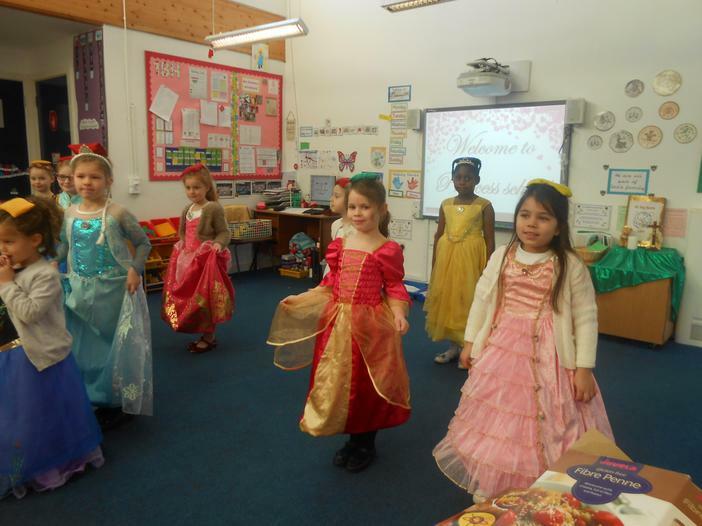 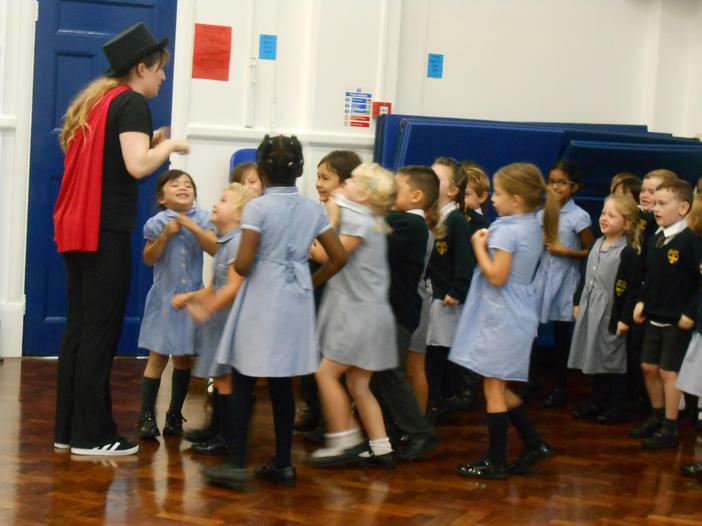 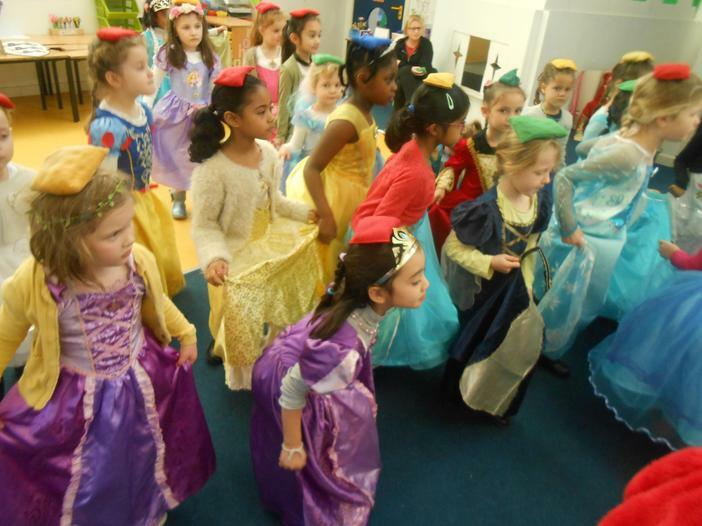 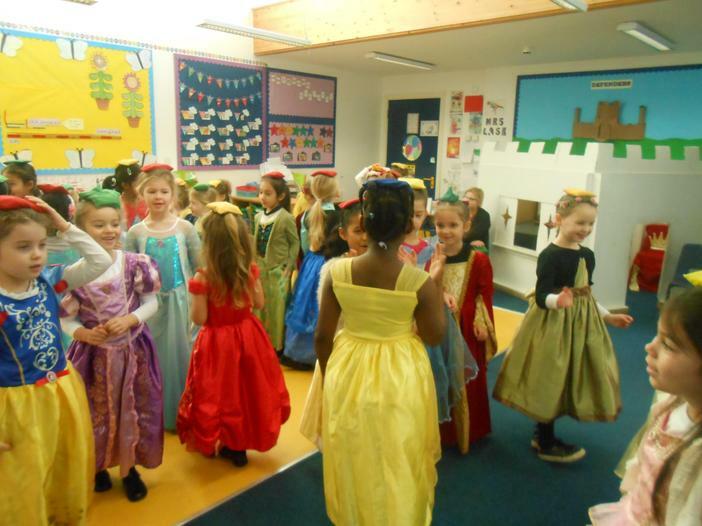 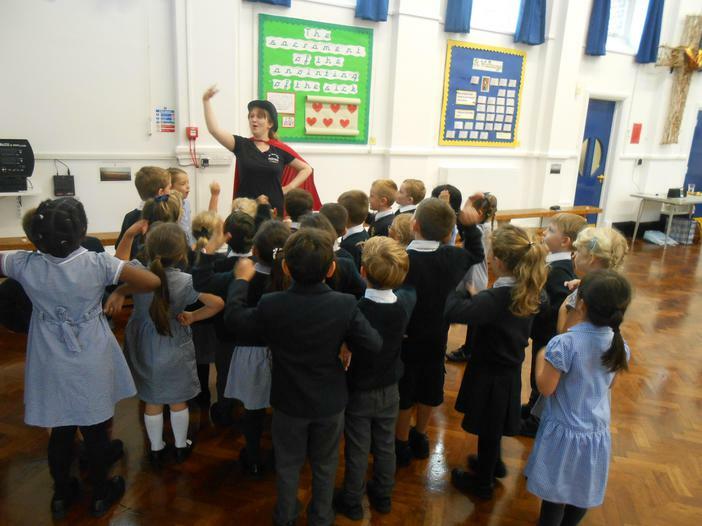 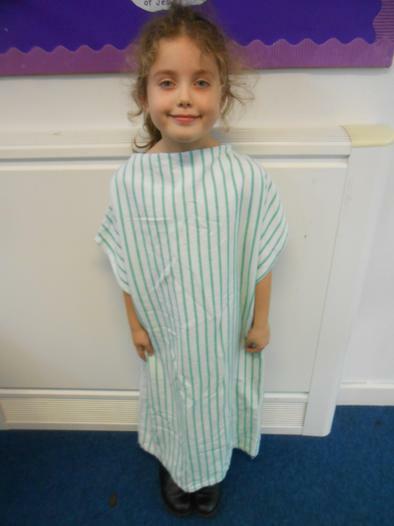 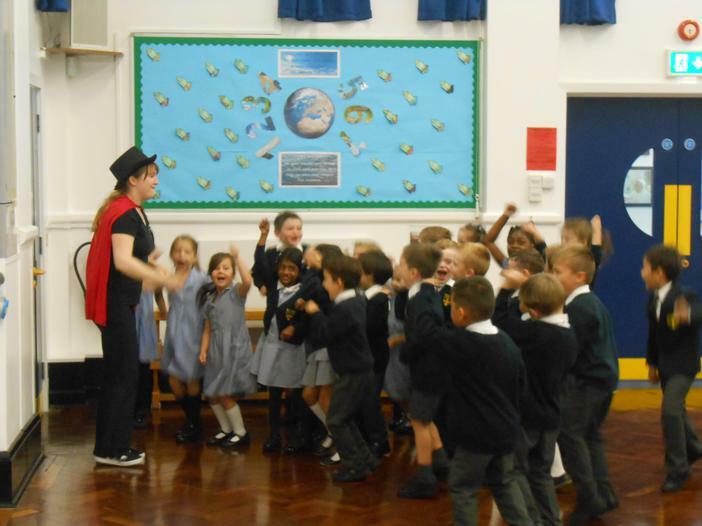 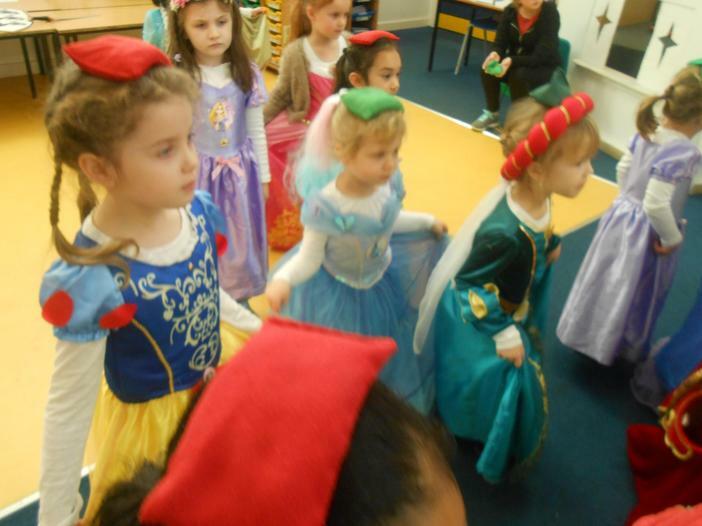 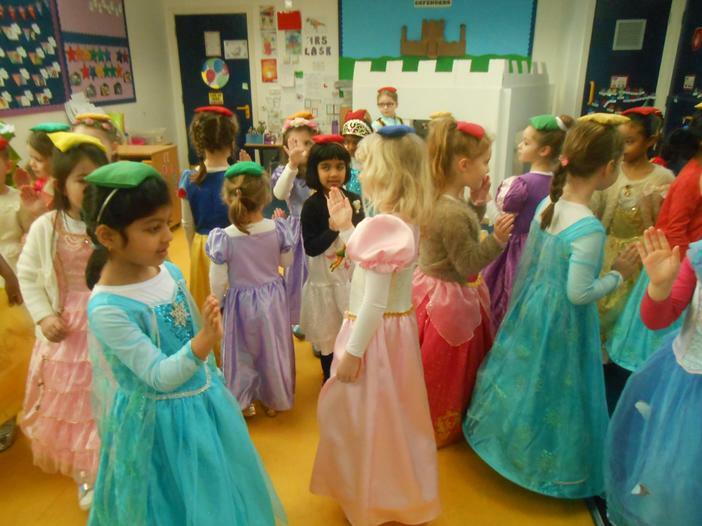 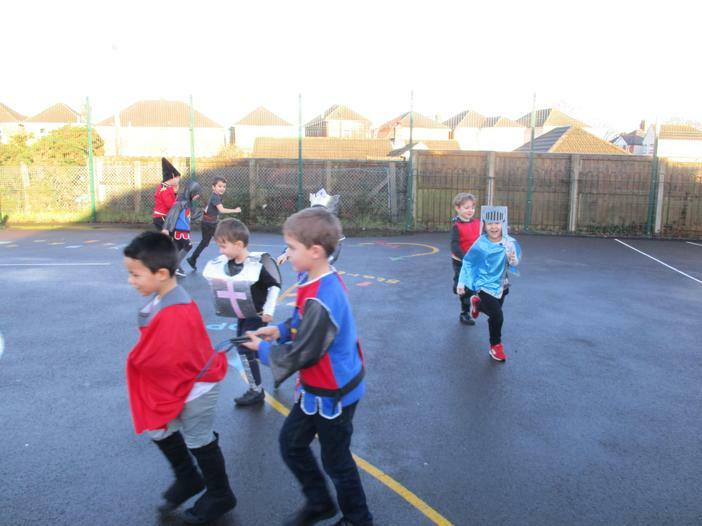 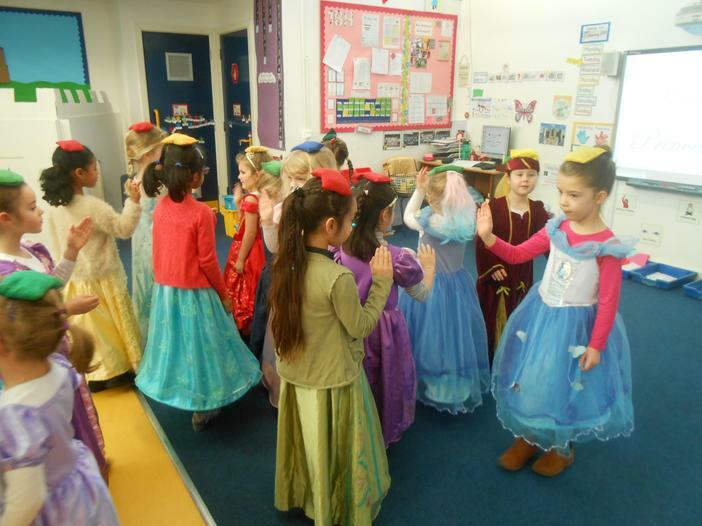 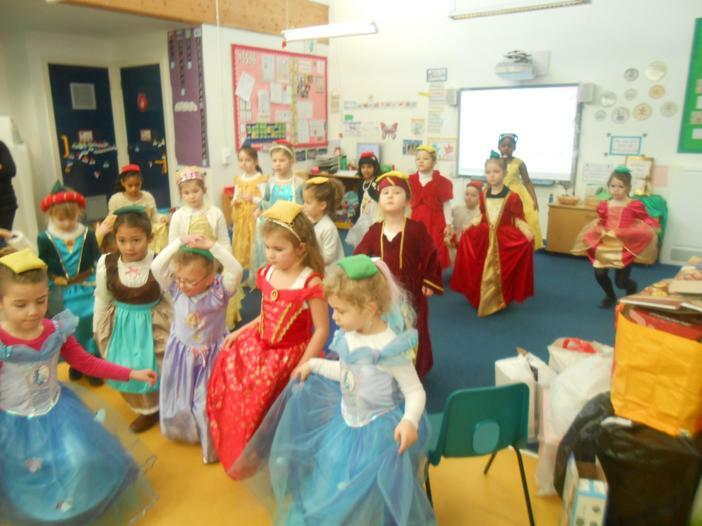 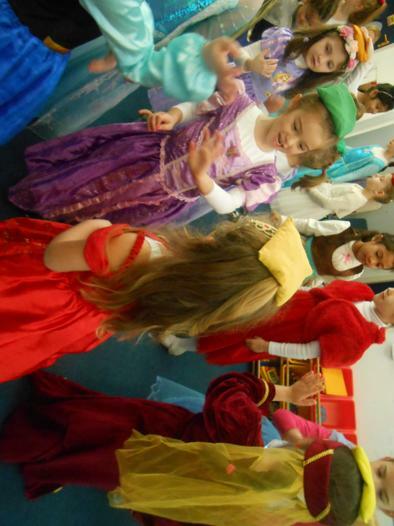 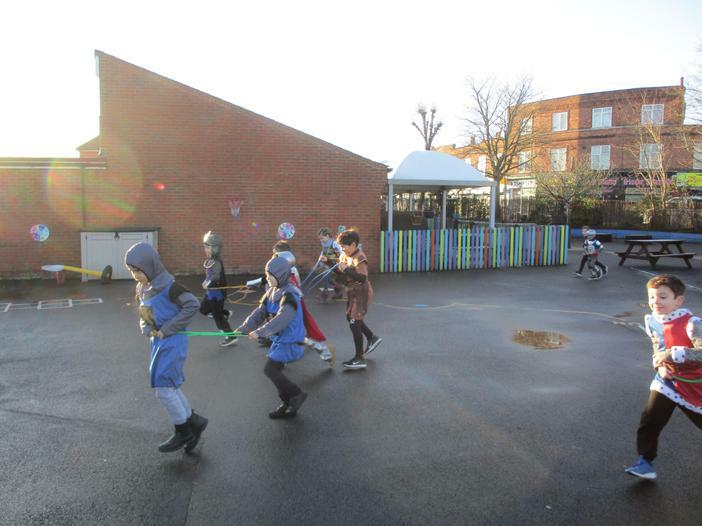 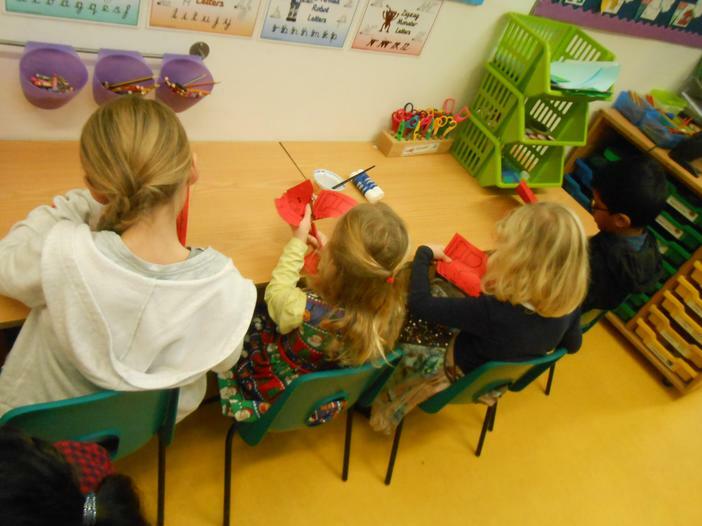 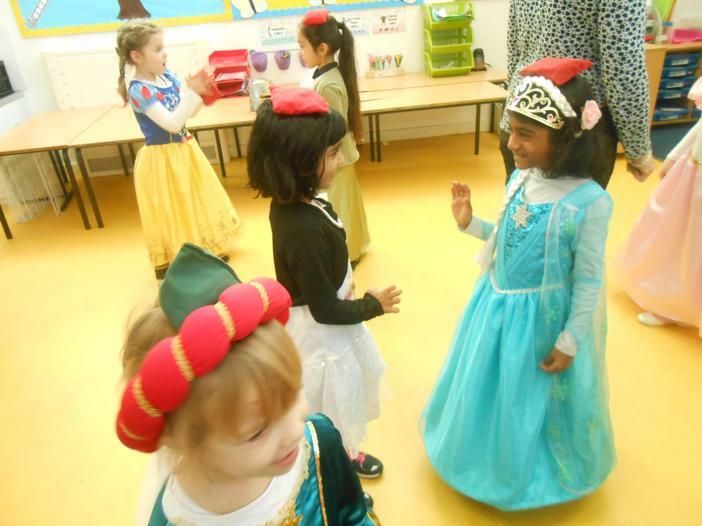 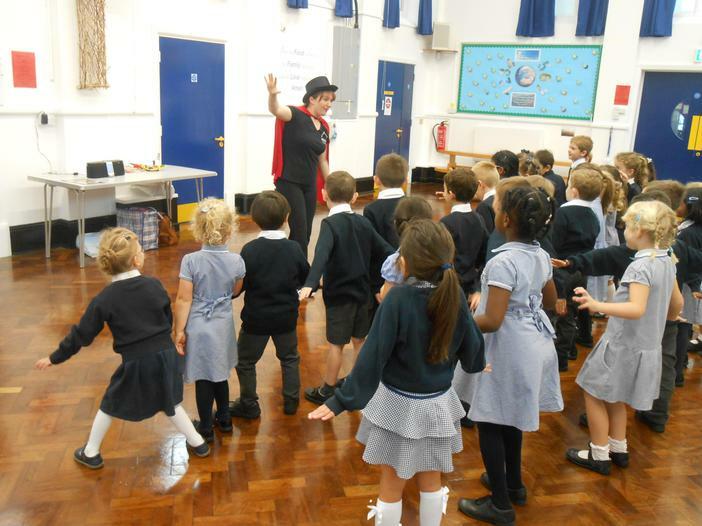 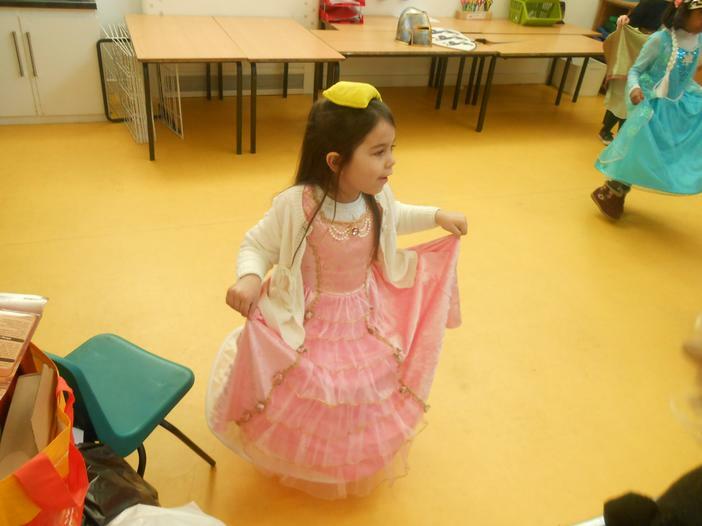 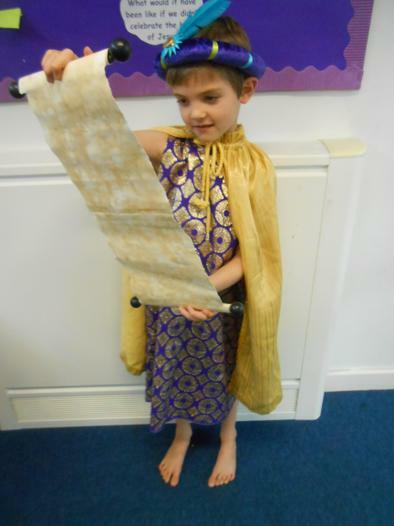 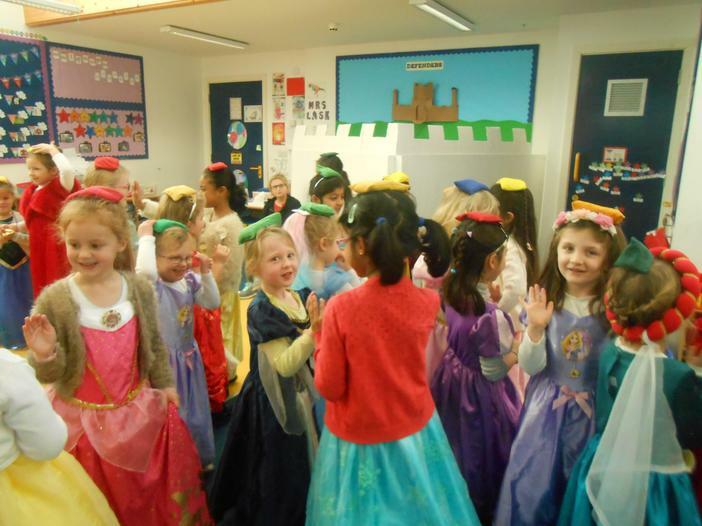 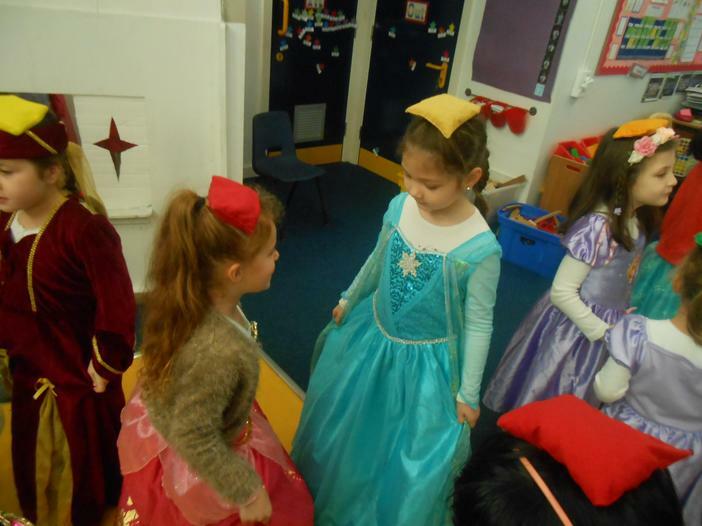 The children had a fantastic time learning to be Princesses and Knights. 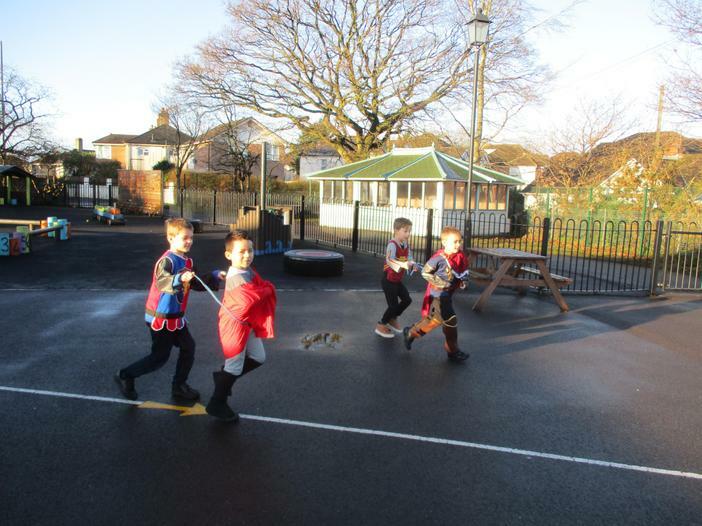 The trainee Knights enjoyed following and giving orders, learning to shoot bow and arrows, riding horses, calling each other Sir/Lady, bowing to greet each other. 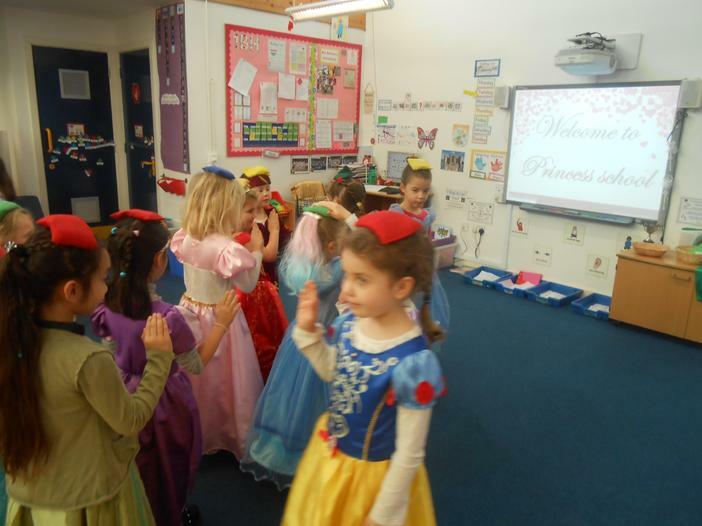 The trainee Princesses enjoyed sitting up straight, walking properly, curtsying, waving gracefully, greeting and talking like a princess, and dancing. 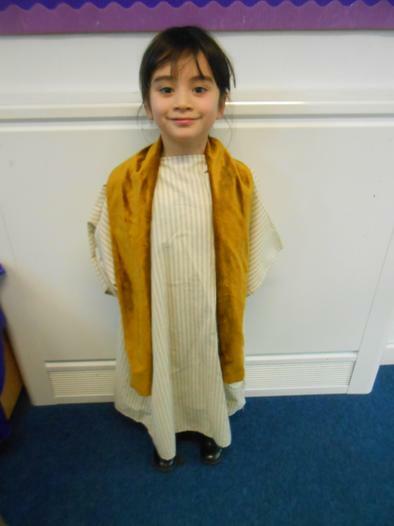 The children compared life of a child 1000 years ago to that of a child now, we thought about how these are shown in story books and in fiction books and noticing the differences. 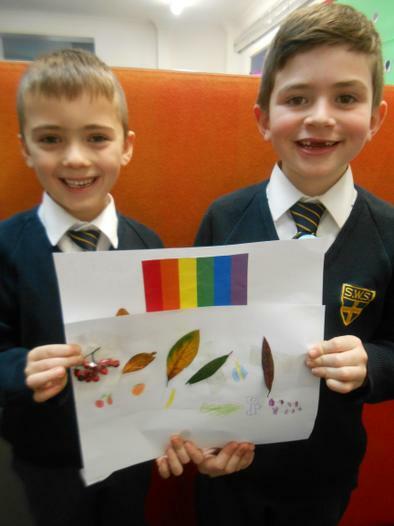 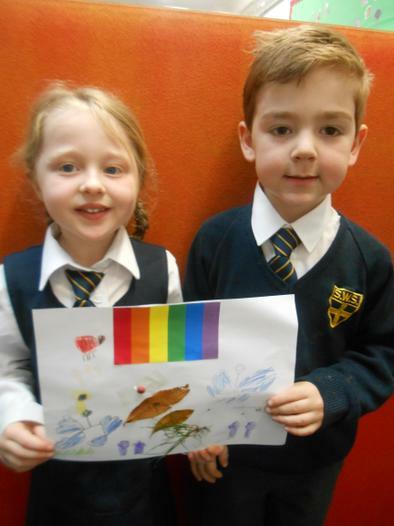 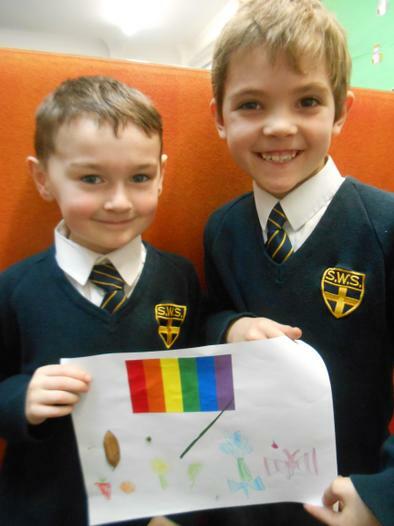 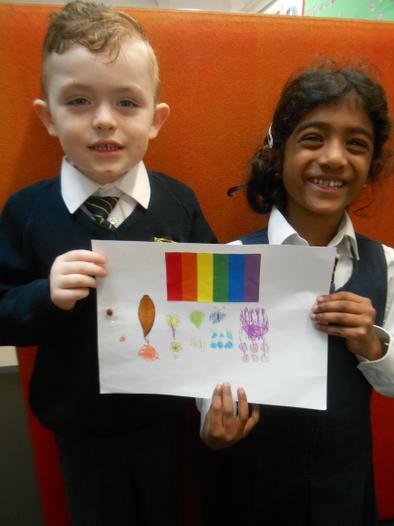 The children have had a fantastic week exploring colour through cross-curricular activities, they have really taken it all in their stride. 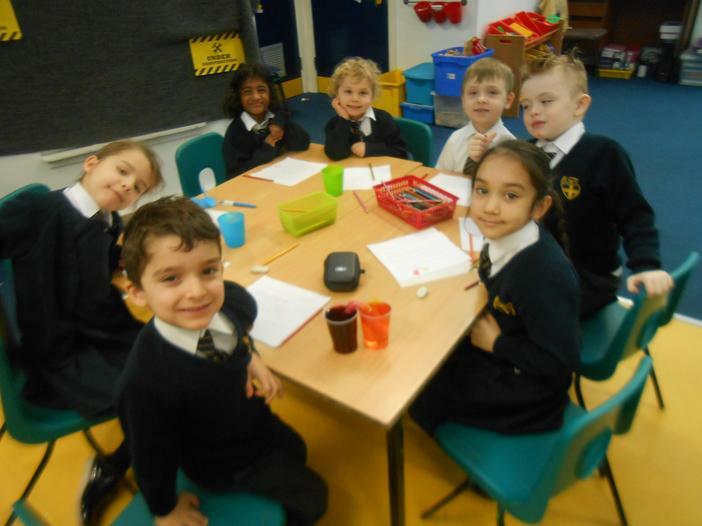 We have performed different experiments and learnt lots of Scientific terminology. 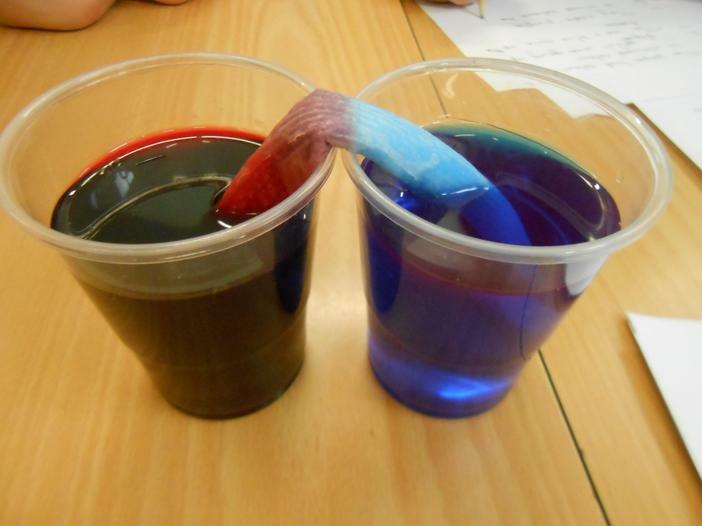 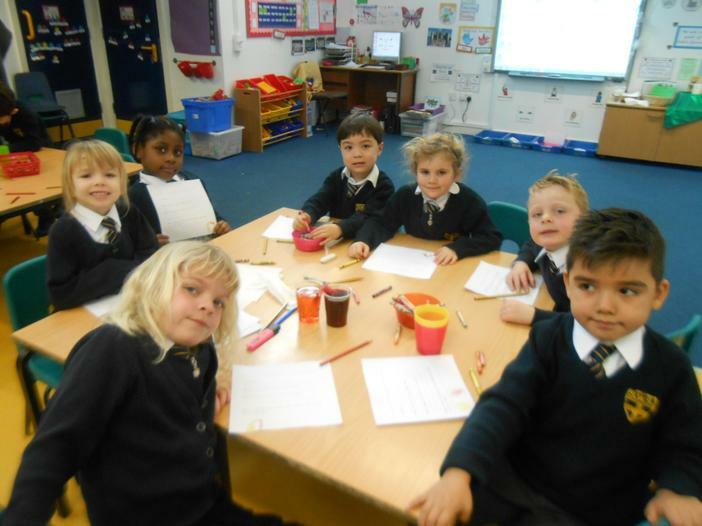 The children really enjoyed creating their first ever Science experiment - they mixed food colouring with water and put a paper towel between the two cups to see what would happen to the colours. 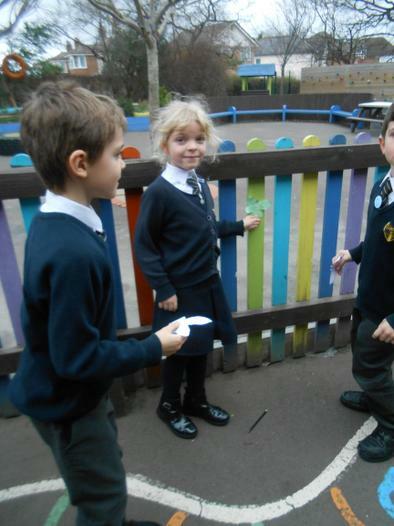 This was one of the first times they have predicted, observed and explained an experiment and they were great! 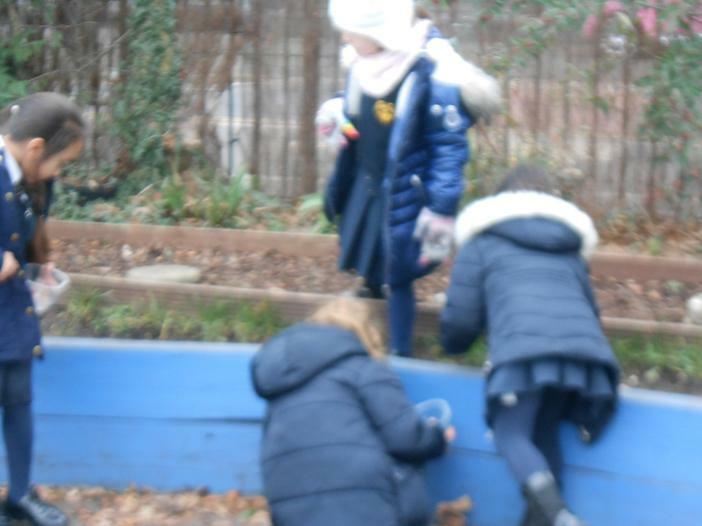 They loved just taking time to observe...QUIETLY! 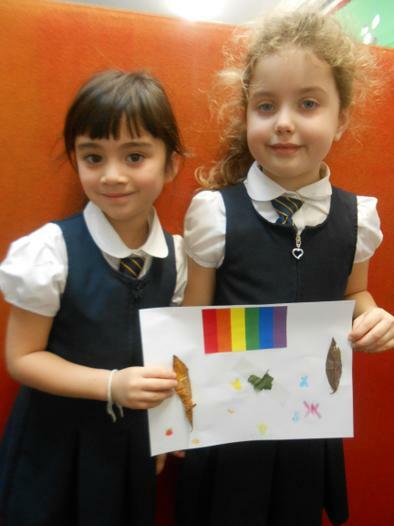 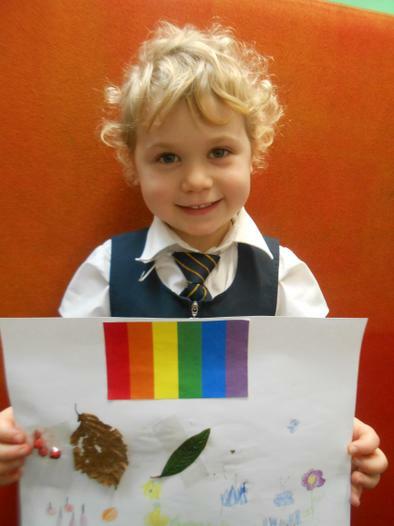 Another favourite of the week was learning about camouflage and why creatures use this for their colourings. 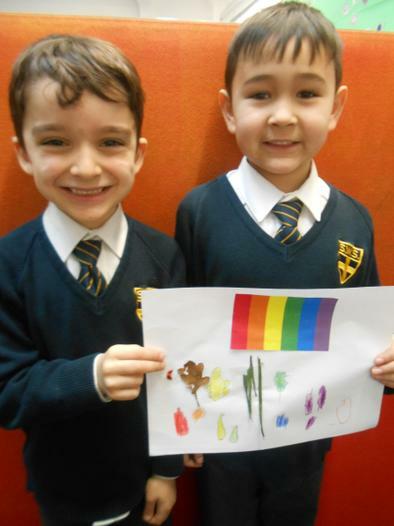 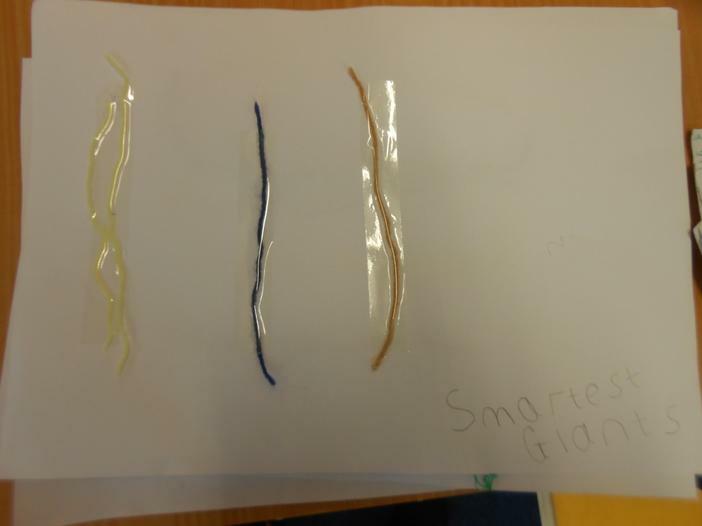 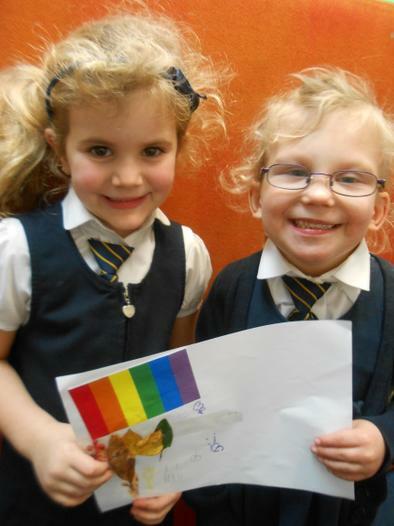 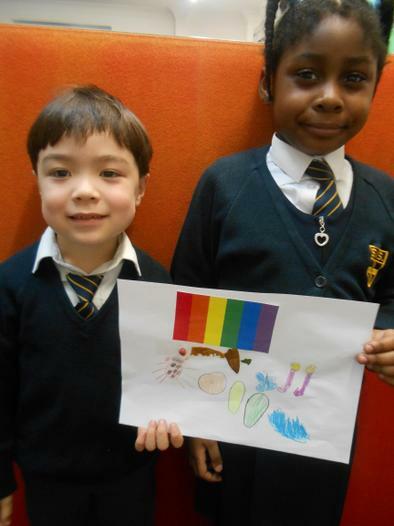 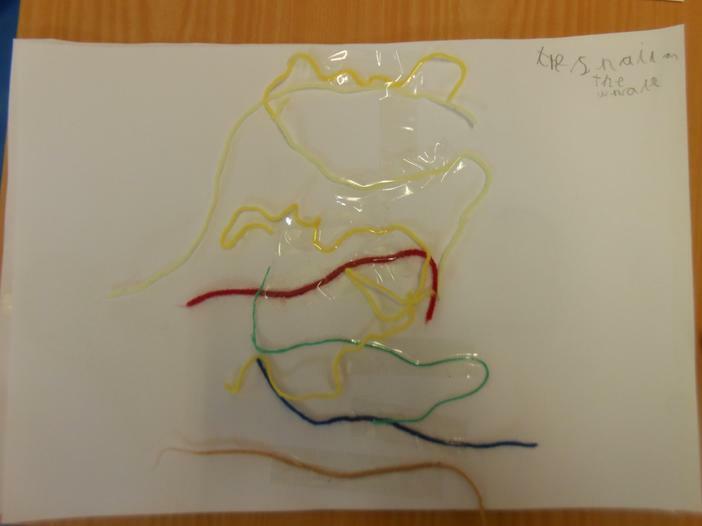 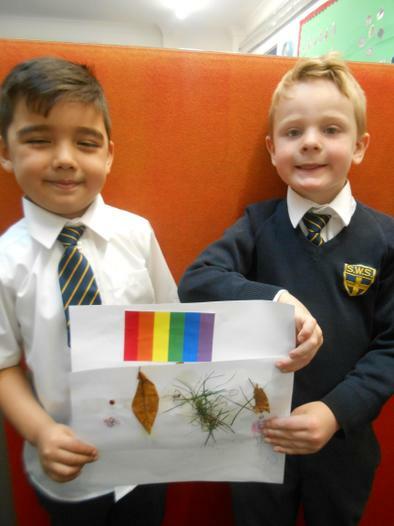 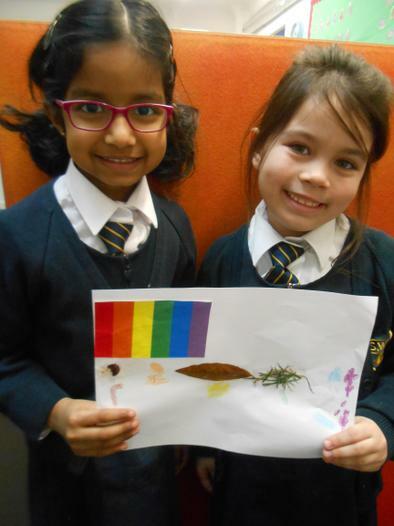 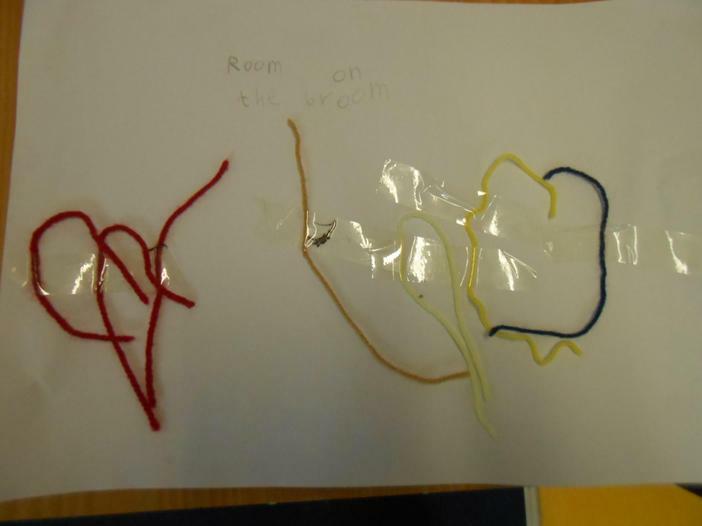 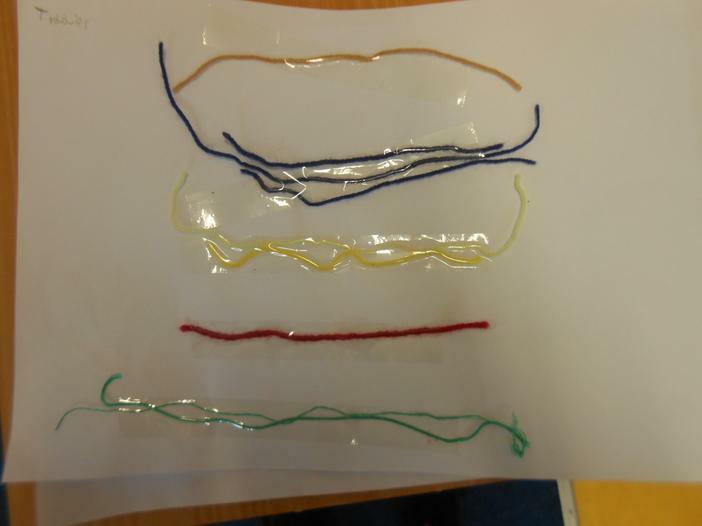 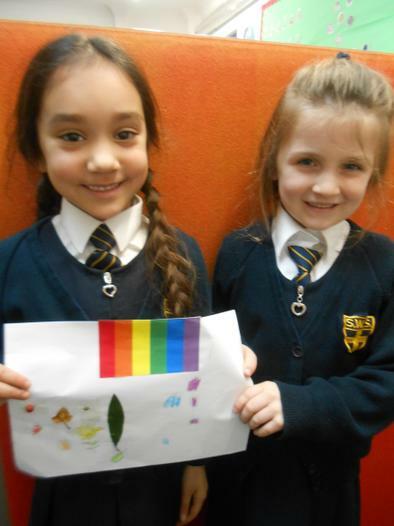 They collected data on caterpillar colours (using different coloured wool) and recorded this in a tally - they also answered questions about the data. 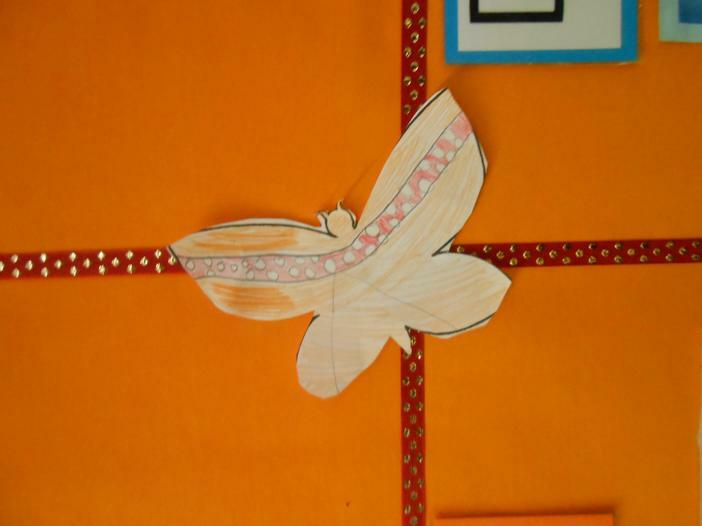 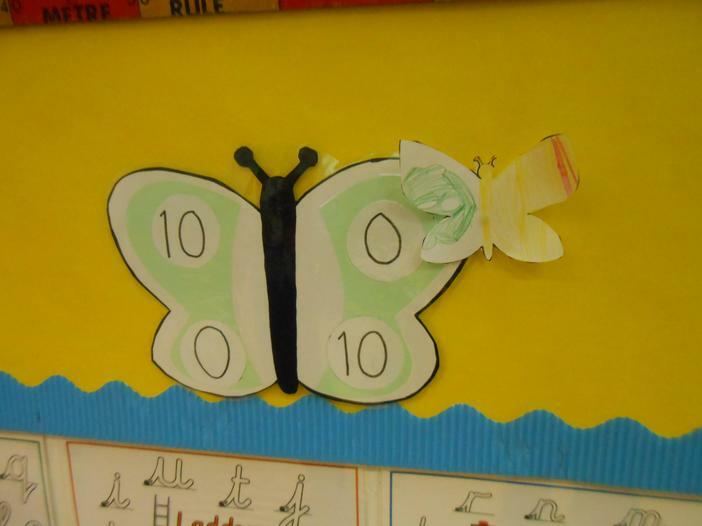 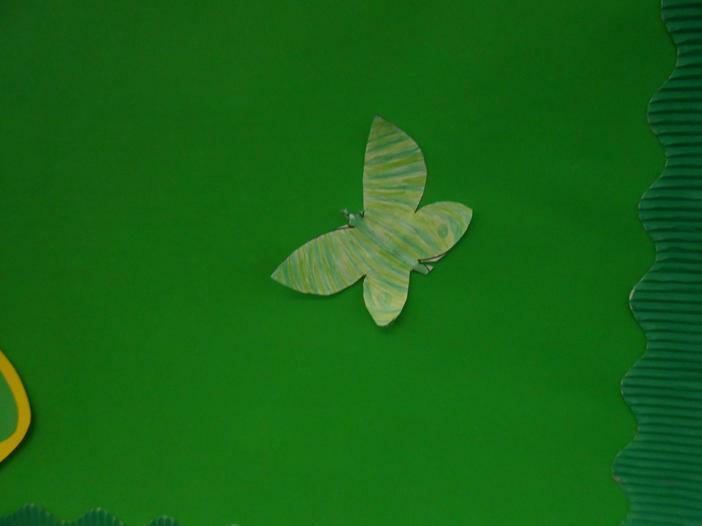 Thinking about cmaouflage, the children designed and created their own buterflies - one to be camouflaged inside the classroom and one to be camouflaged outside the classroom. 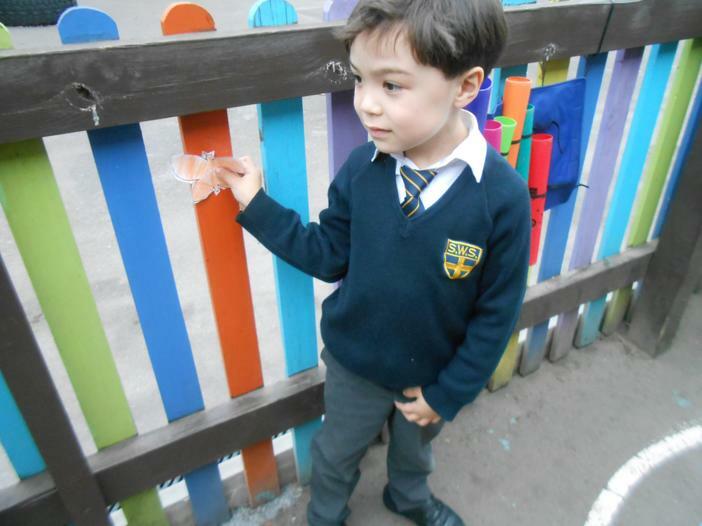 They really understood the design criteria and thought about the colours they needed to use. 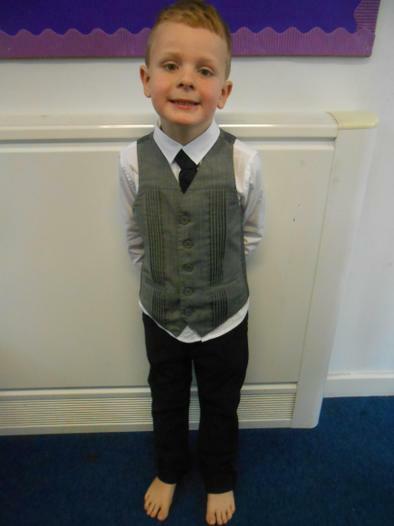 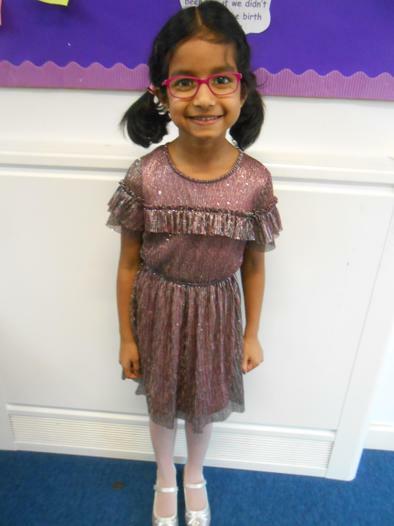 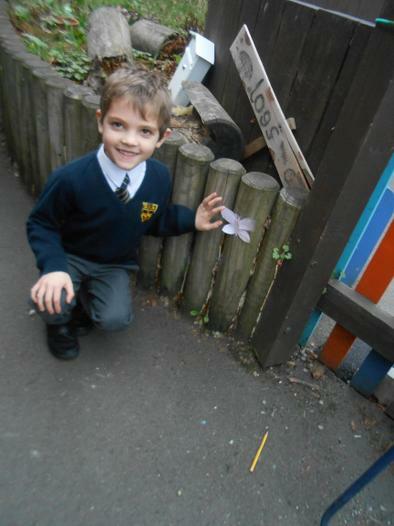 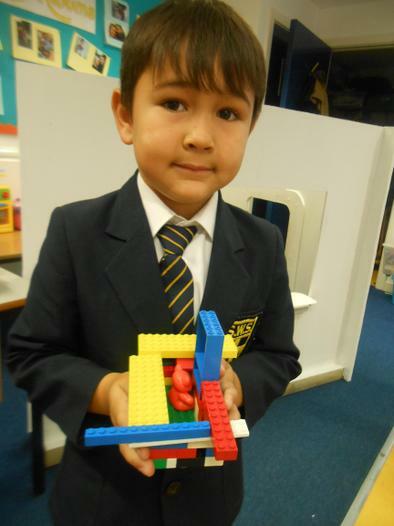 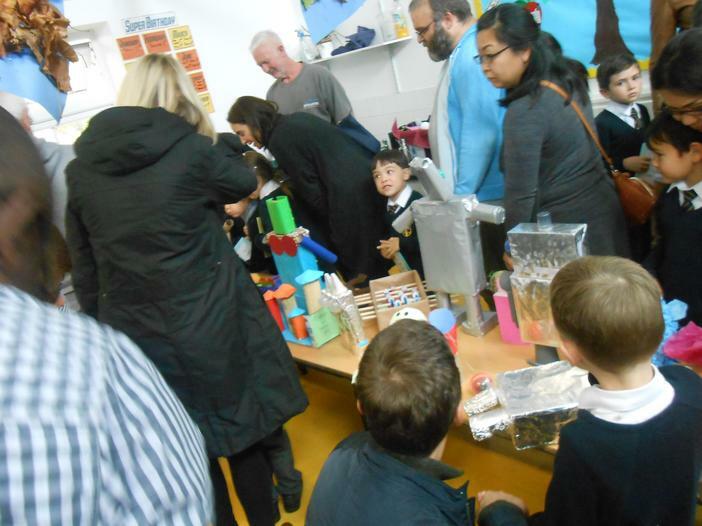 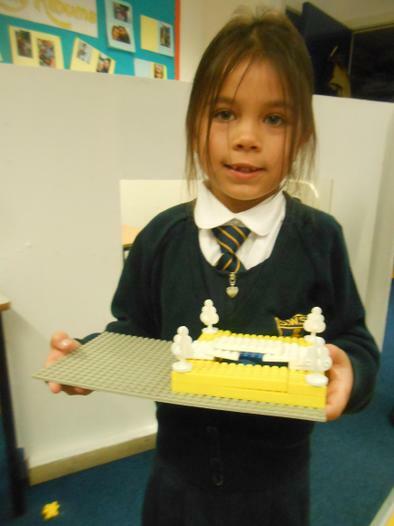 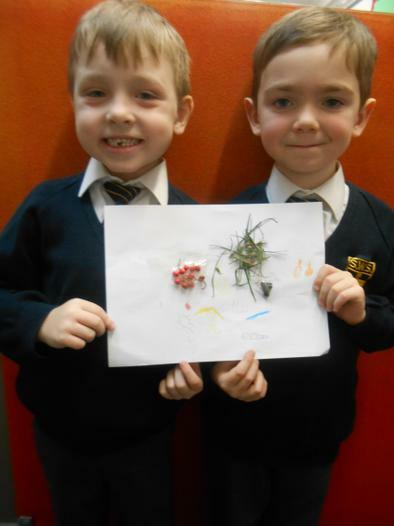 Science week has been amazing...The children are Super Scientists! 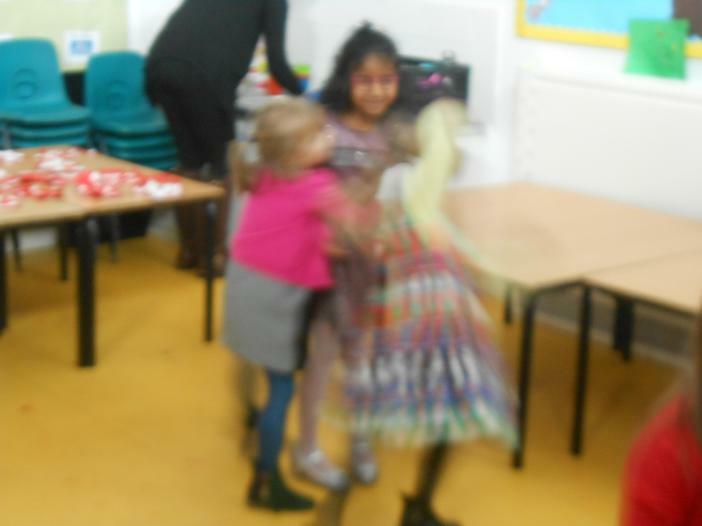 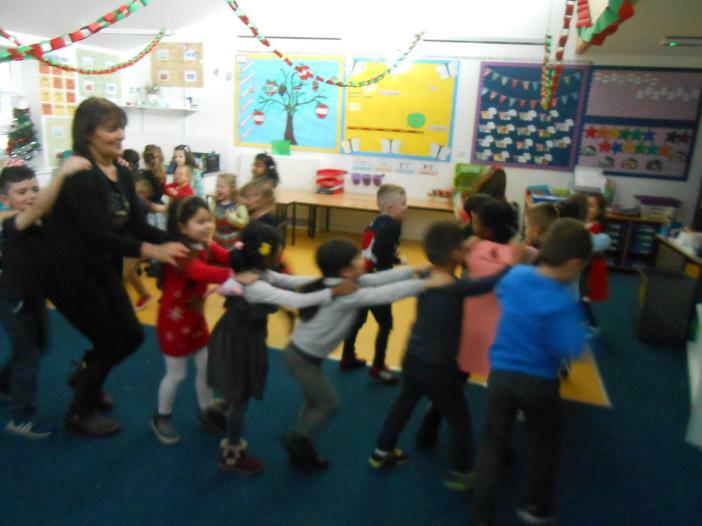 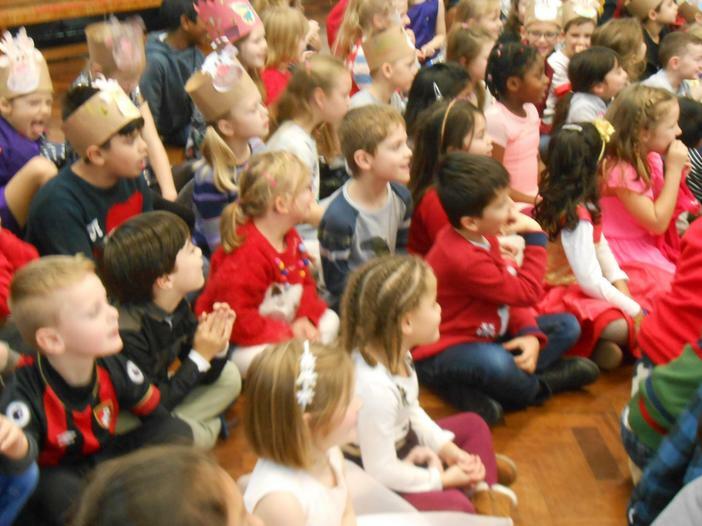 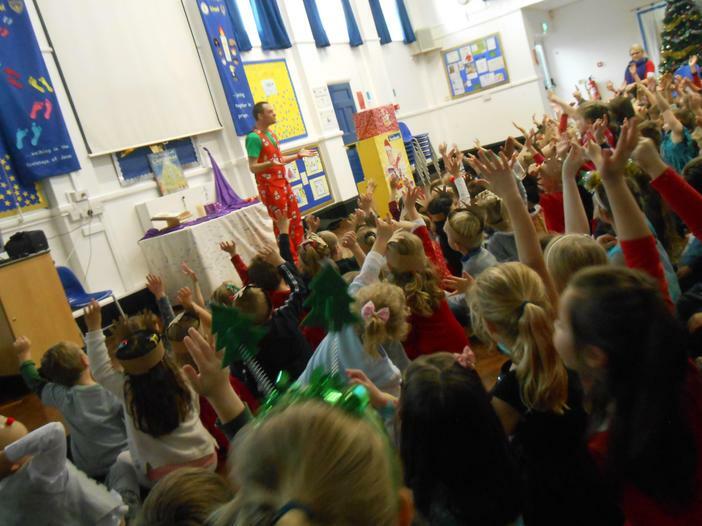 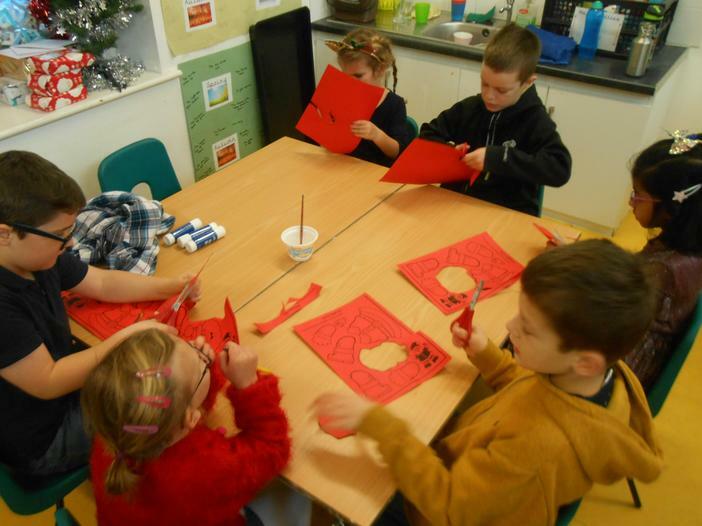 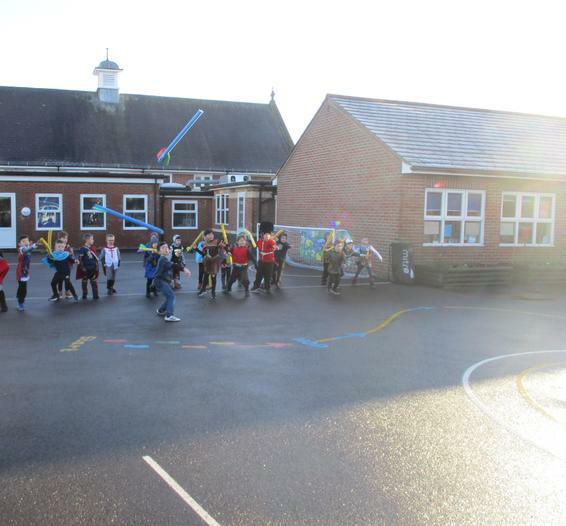 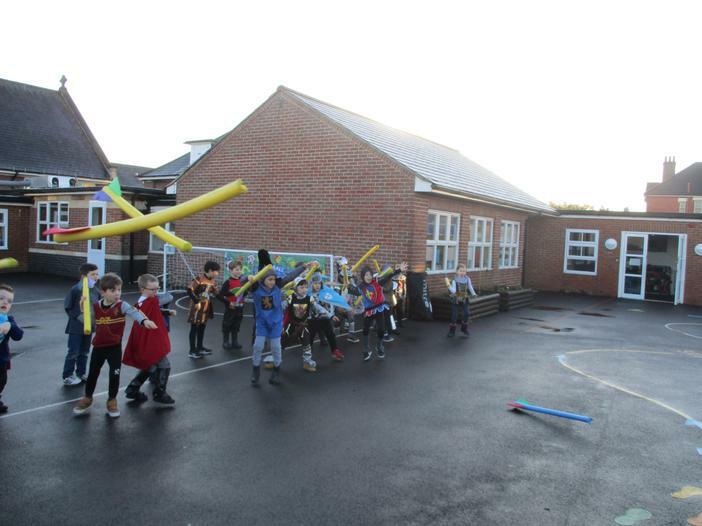 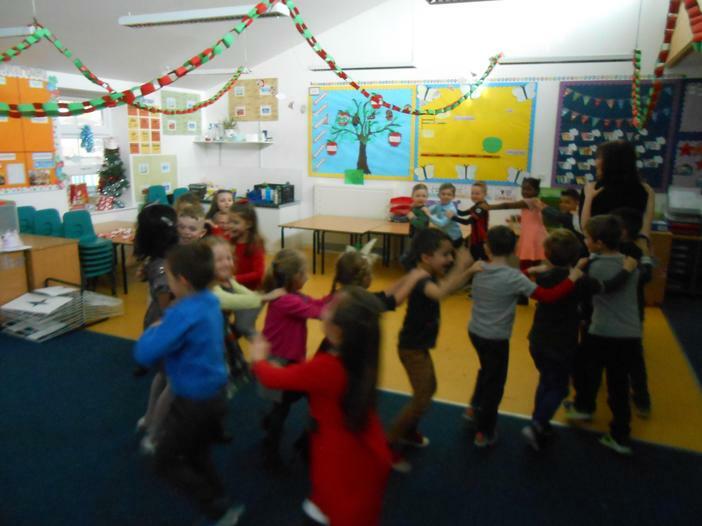 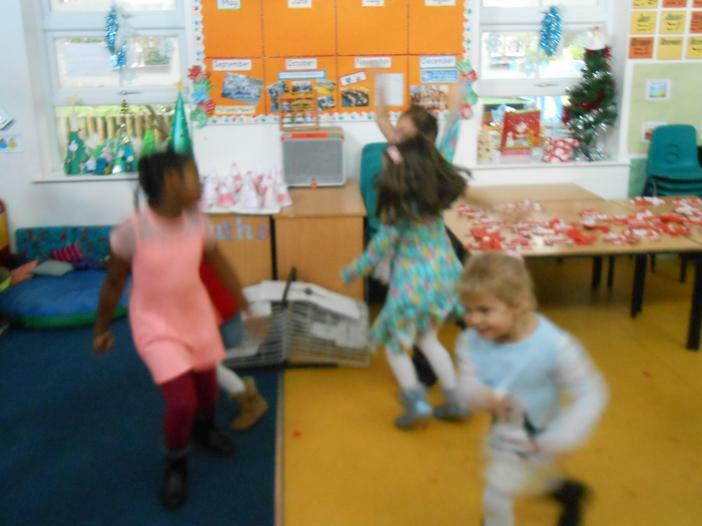 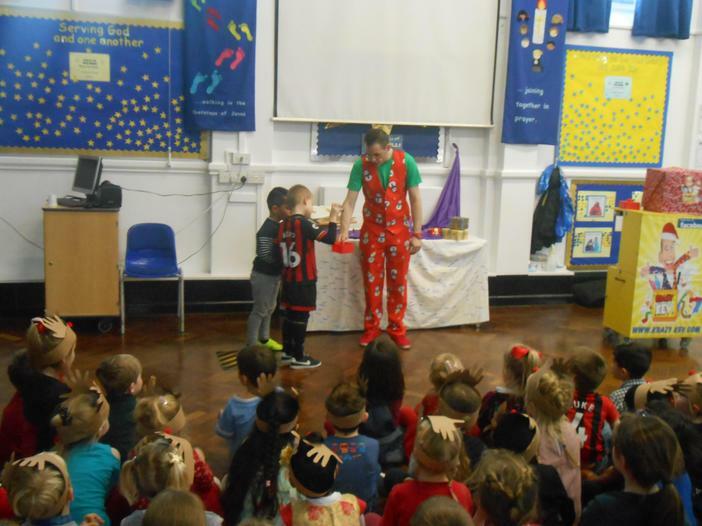 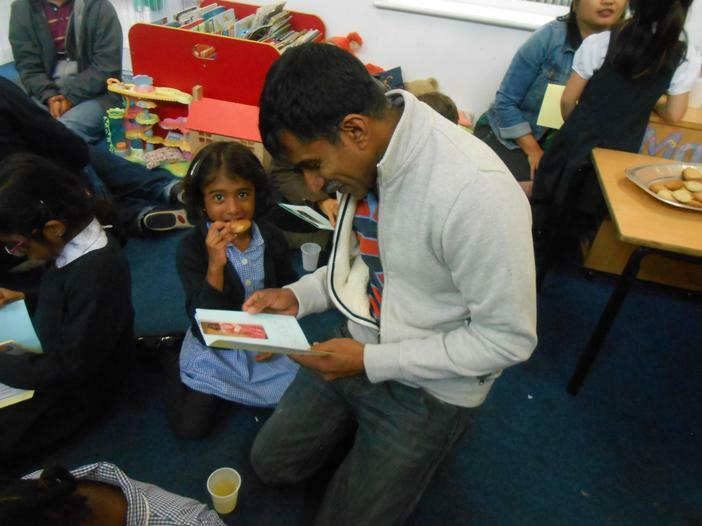 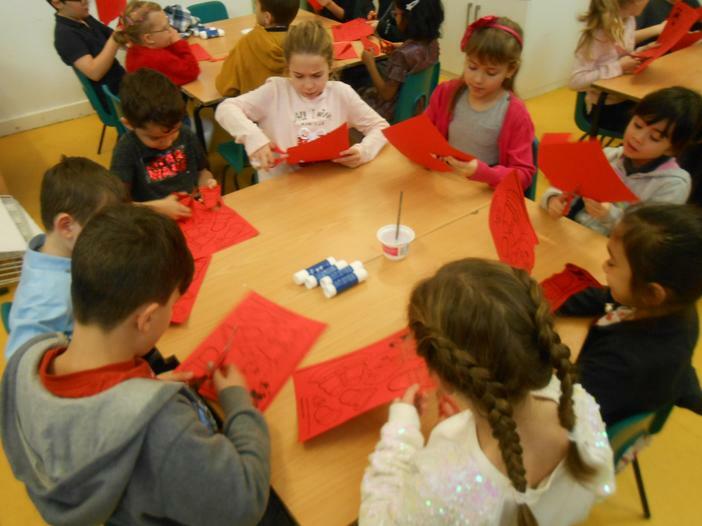 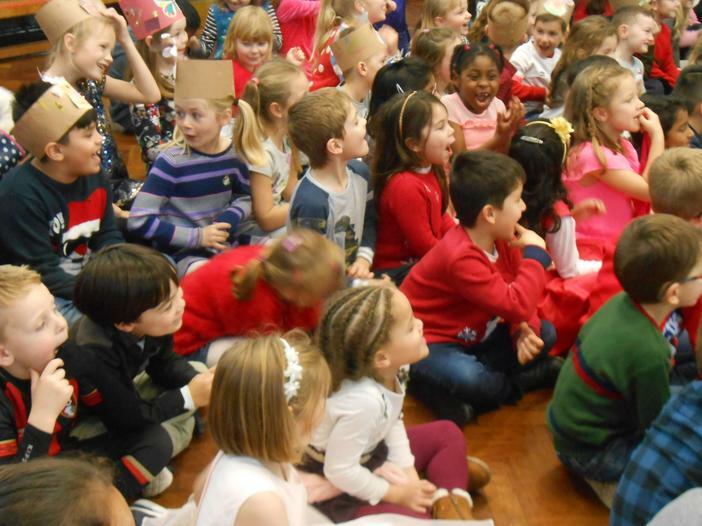 The children have absolutely loved their Christmas party day. 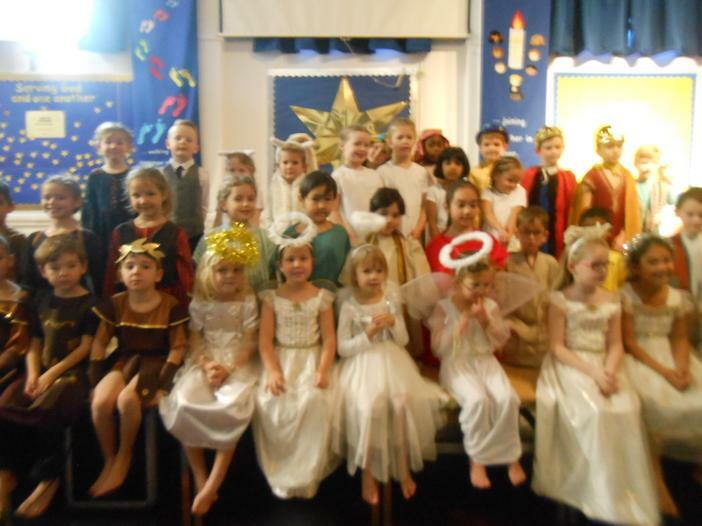 They came in first thing all beautifully dressed and filled with Christmas spirit. 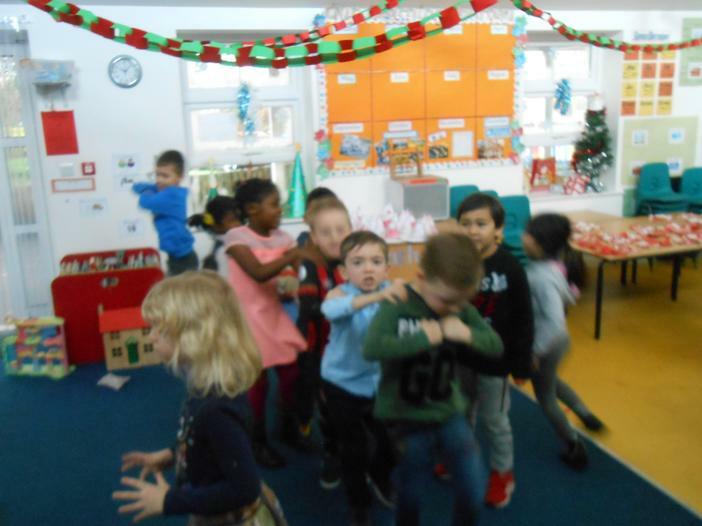 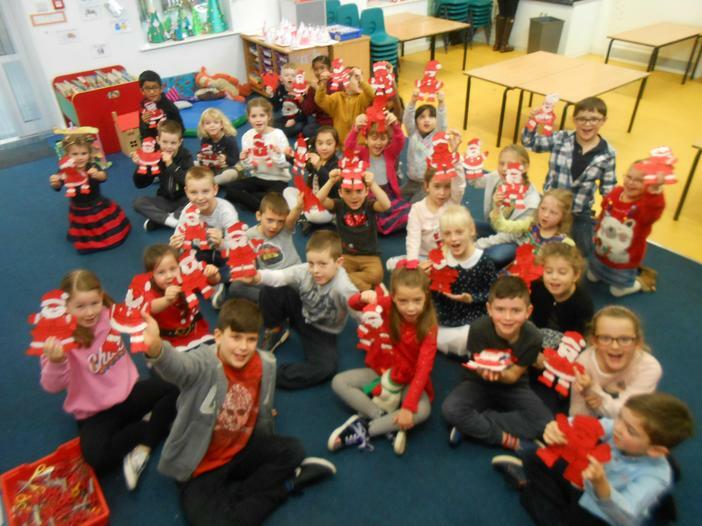 We started our party day with our prayer buddies and made a moving Santa - it was so lovely to hear the Christmas chat and singing among them all. 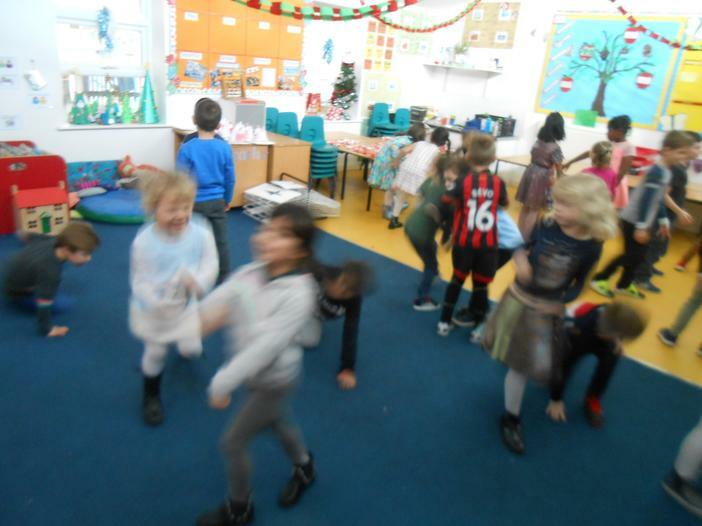 Then we joined together with 1JH for dancing and party games. 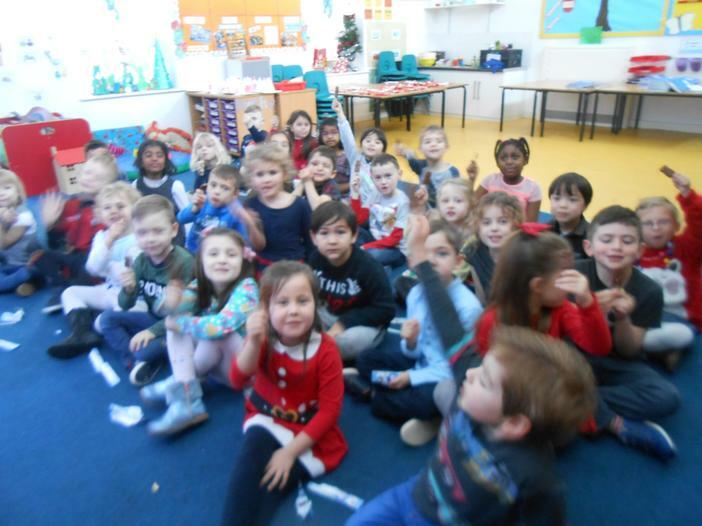 At 11:30 we all went into the hall and had Christmas lunch, we even had Christmas crackers! 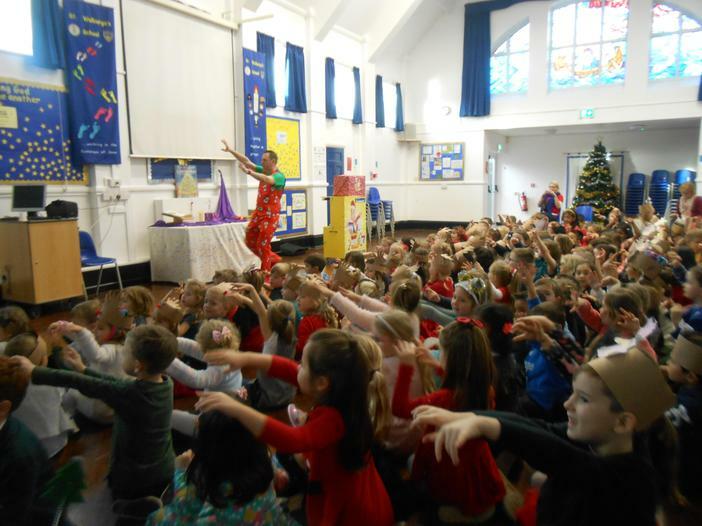 After lunch we had a little relax and watched the Cbeebies pantomime 'The Snow Queen', the children loved joining in, whilst we were watching this we had a special visitor...FATHER CHRISTMAS! 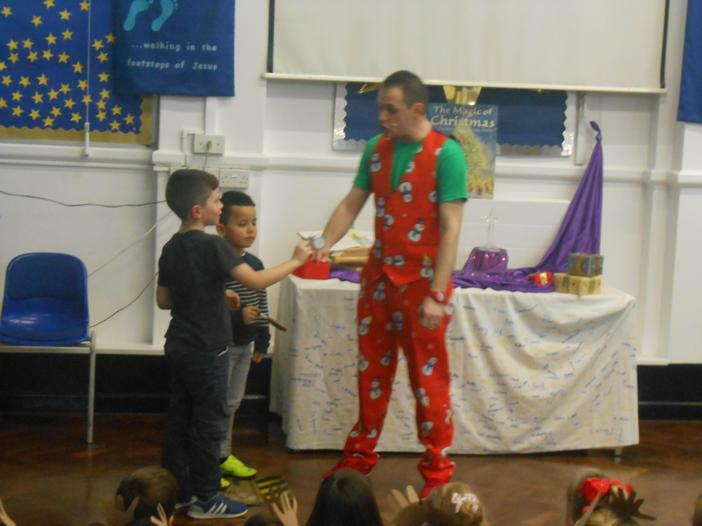 He gave each of us a chocolate lollipop which we enjoyed eating. 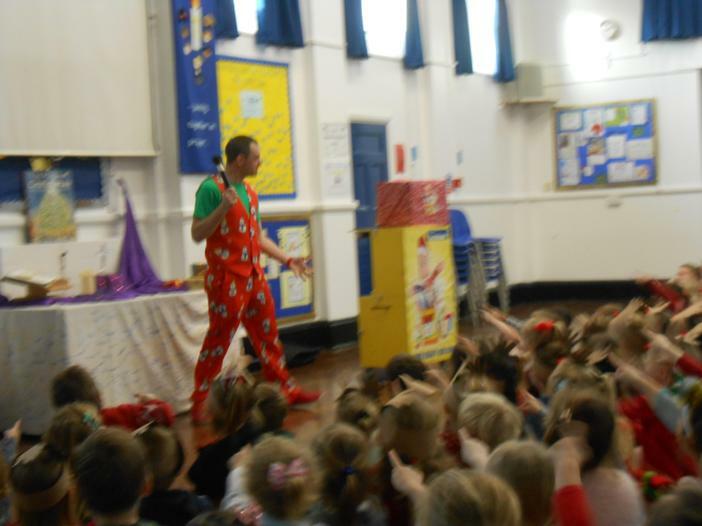 Finally to finish off our day we watch Krazy Kev and his Krazy magic! 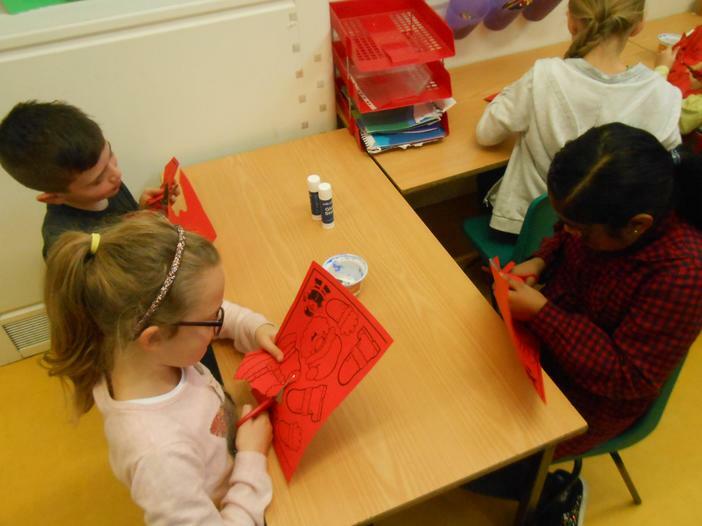 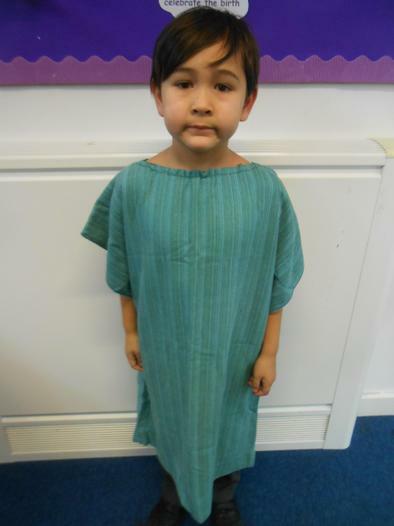 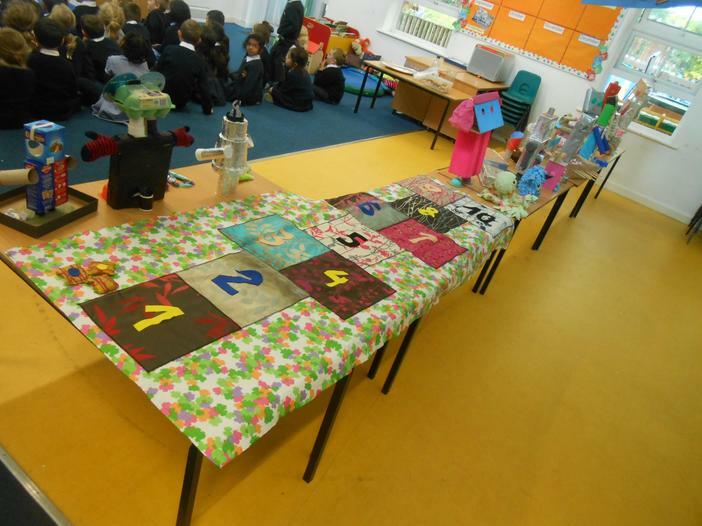 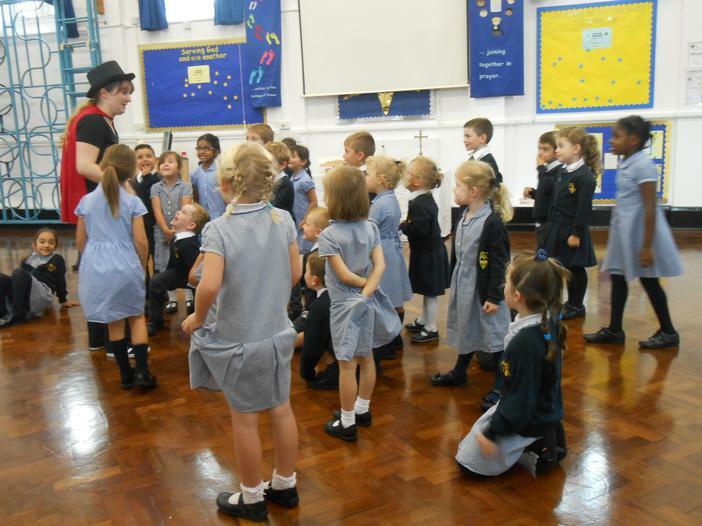 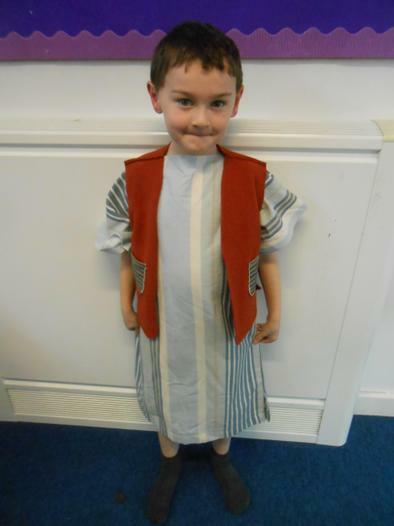 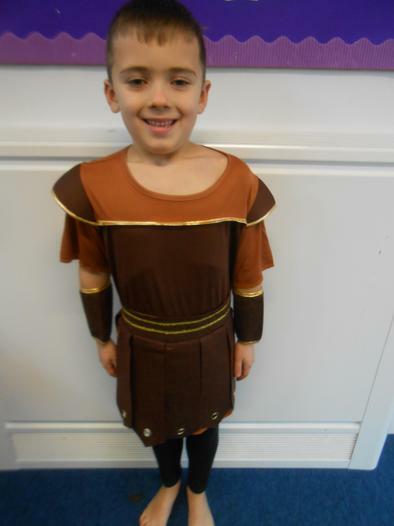 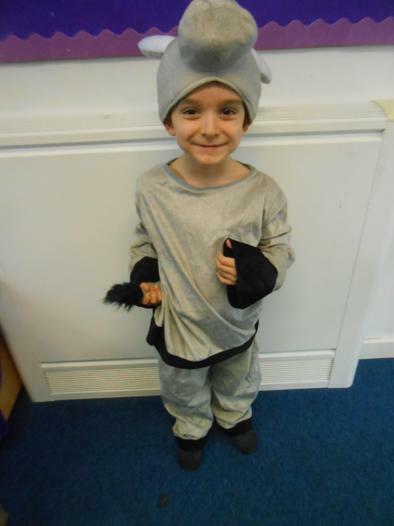 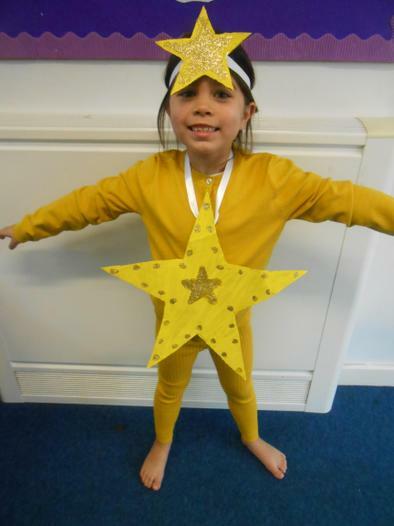 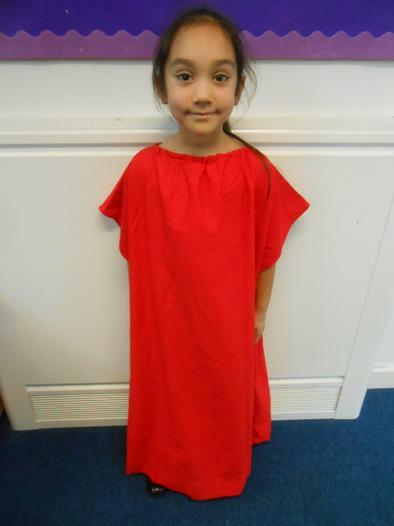 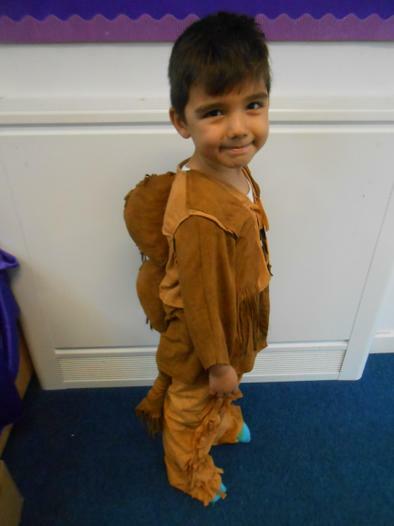 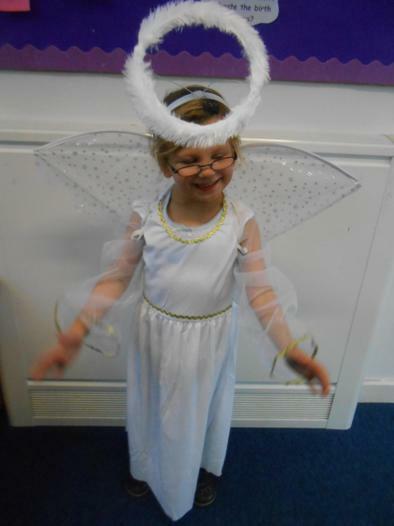 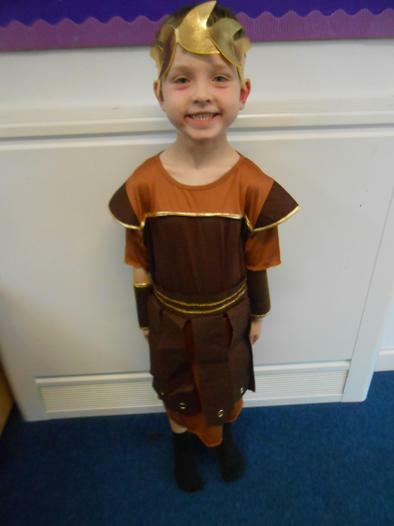 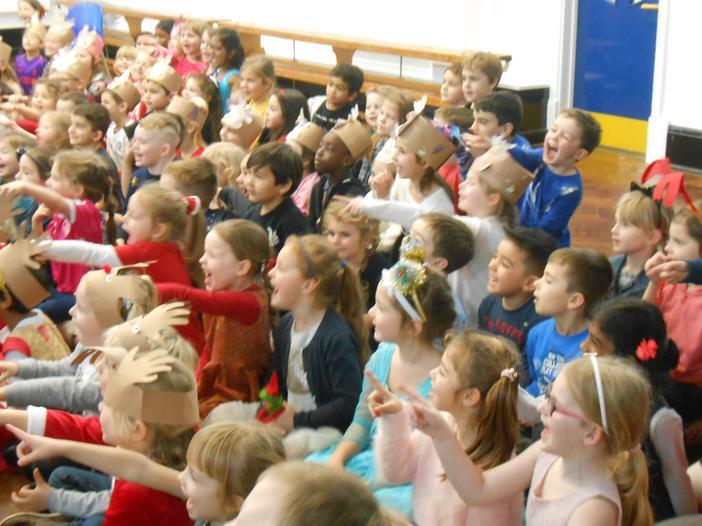 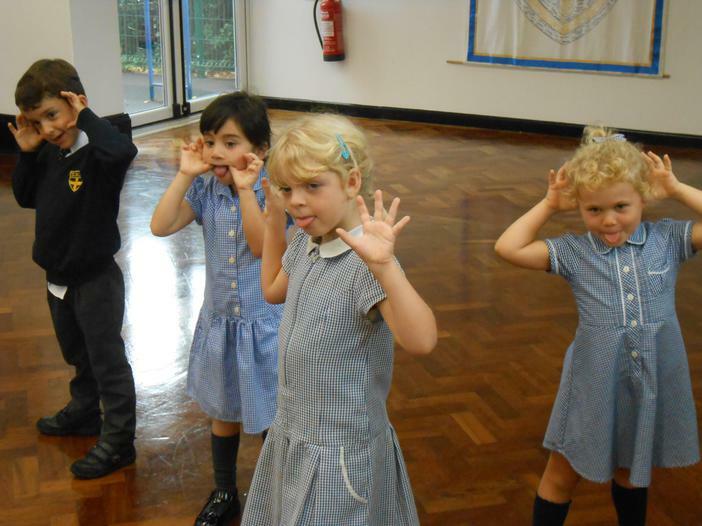 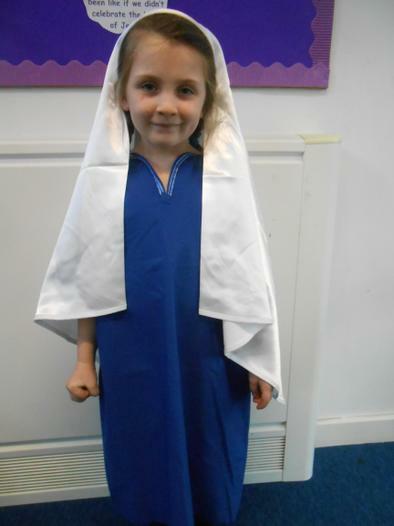 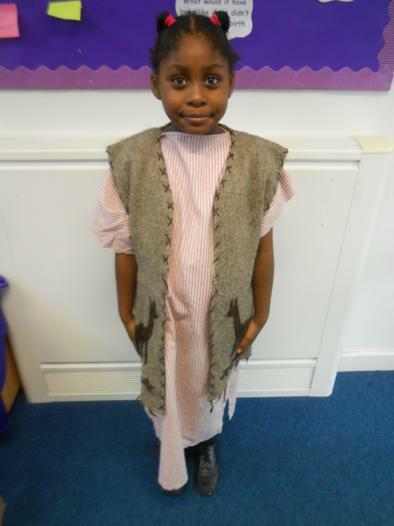 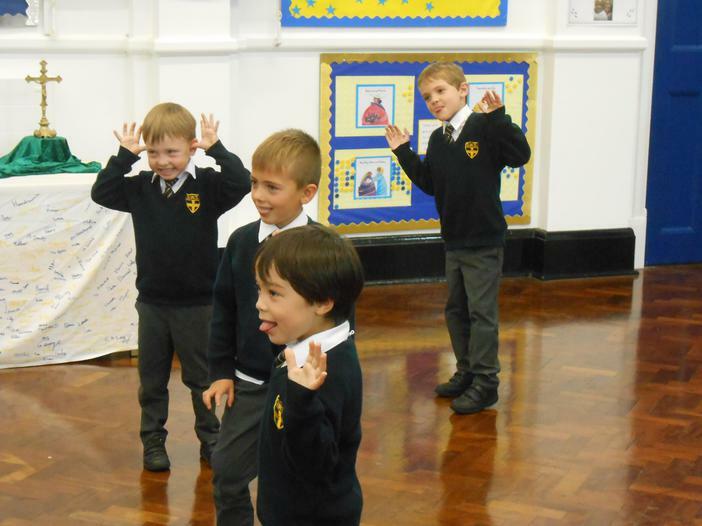 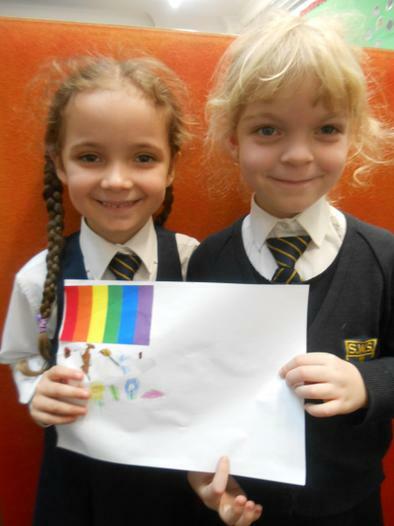 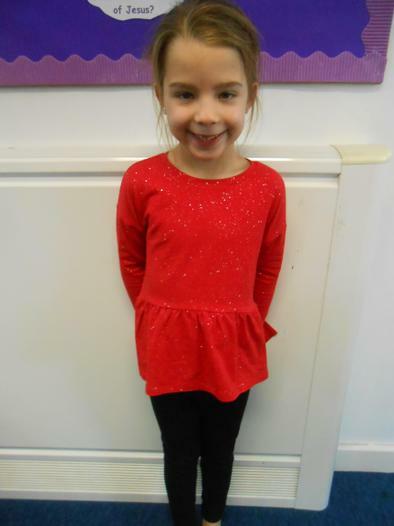 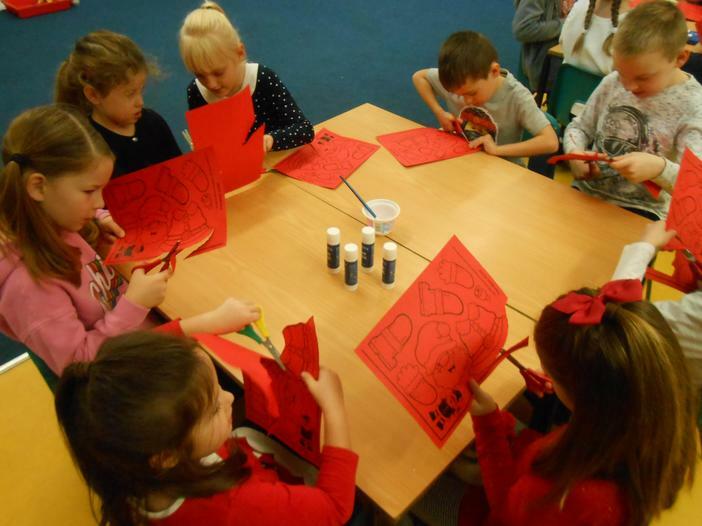 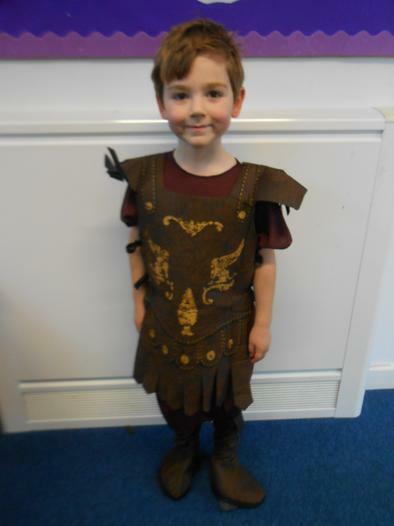 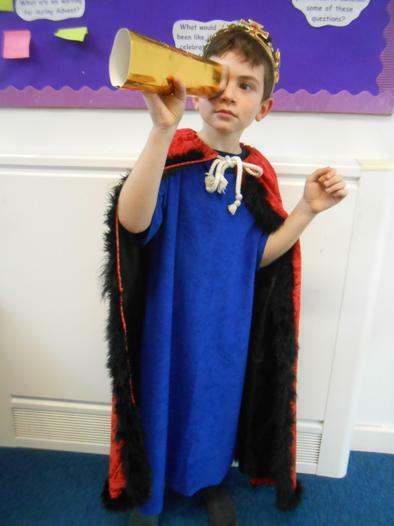 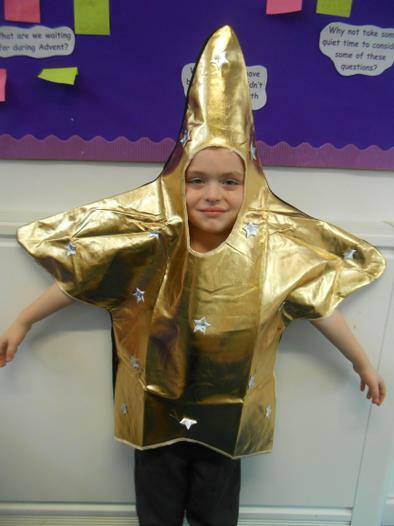 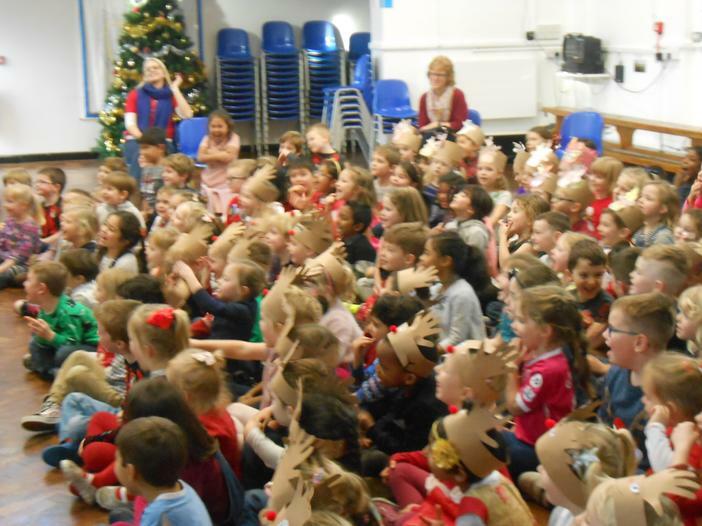 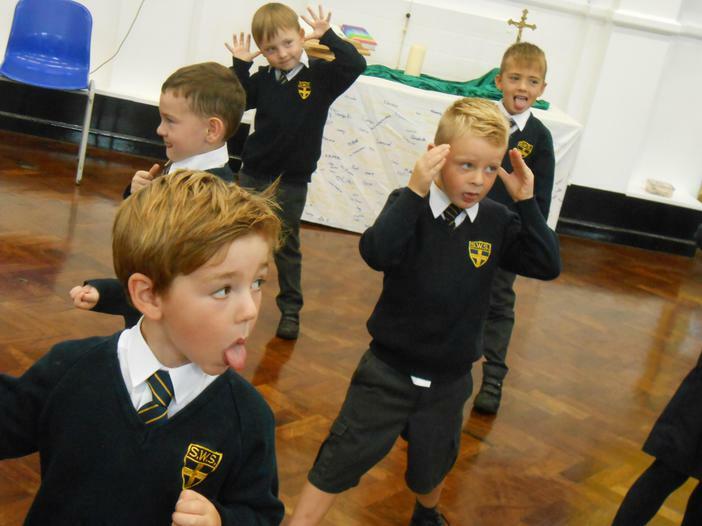 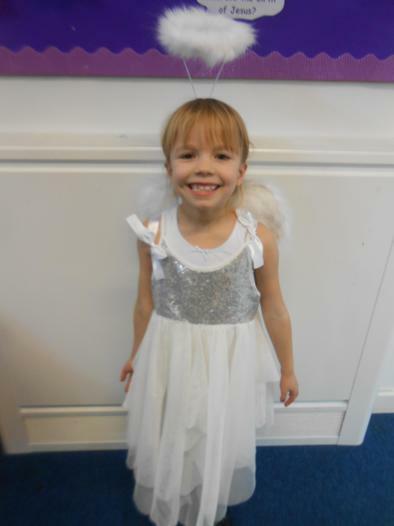 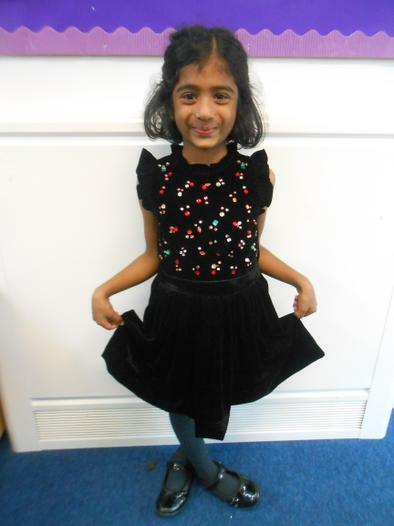 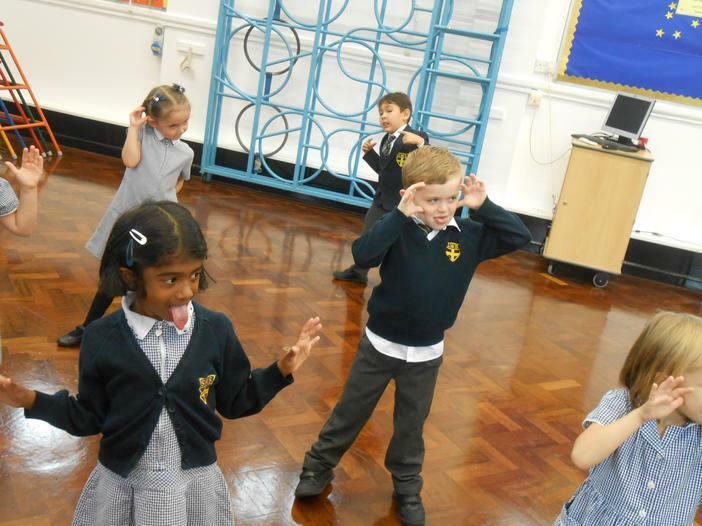 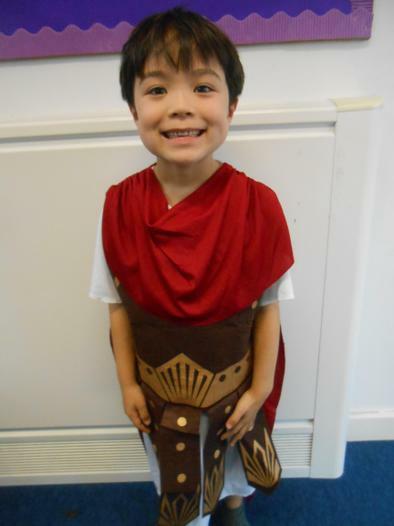 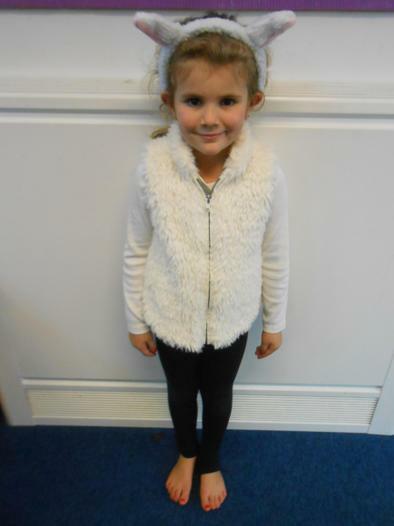 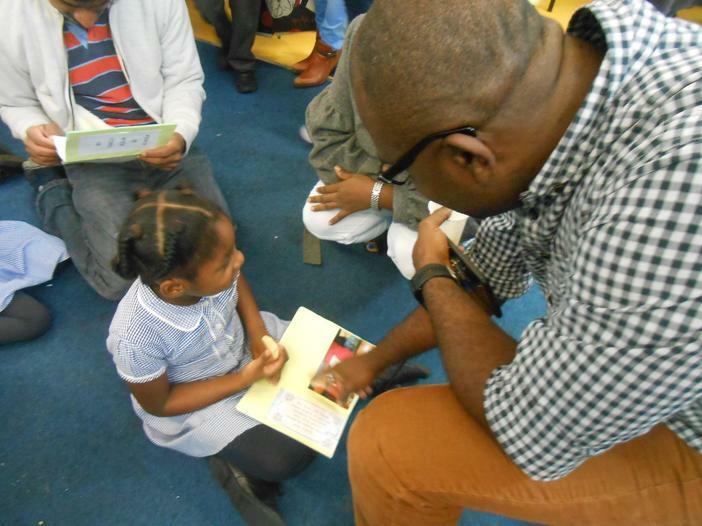 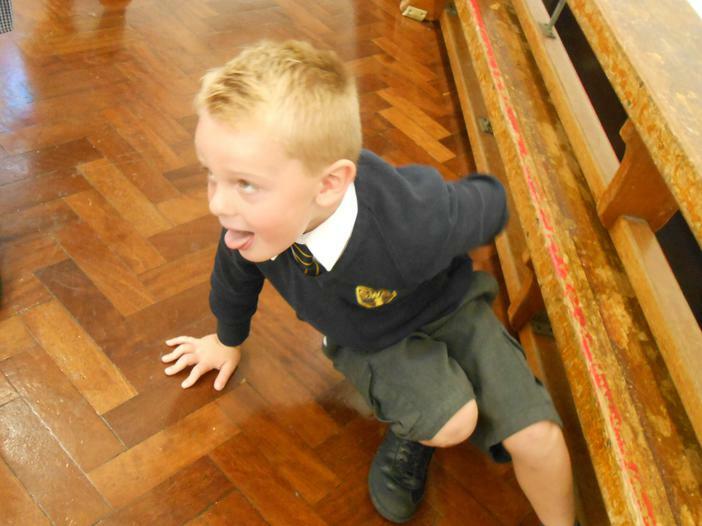 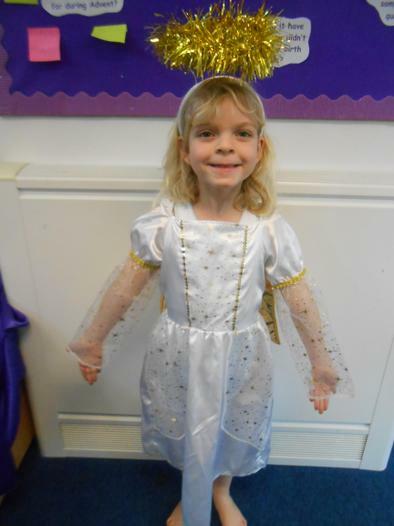 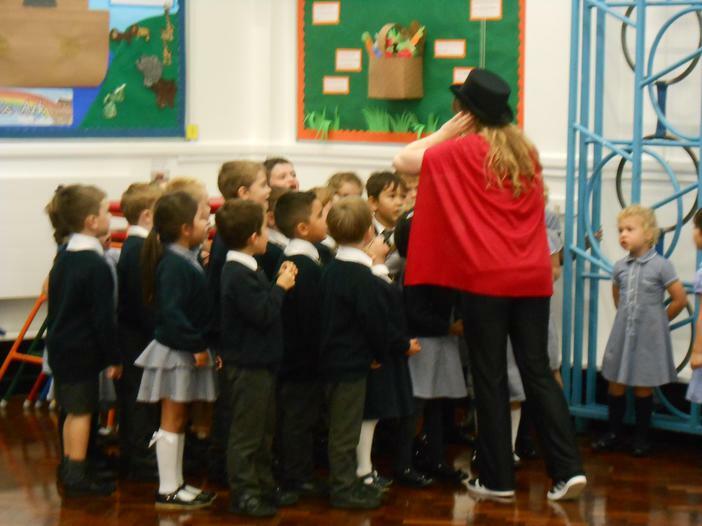 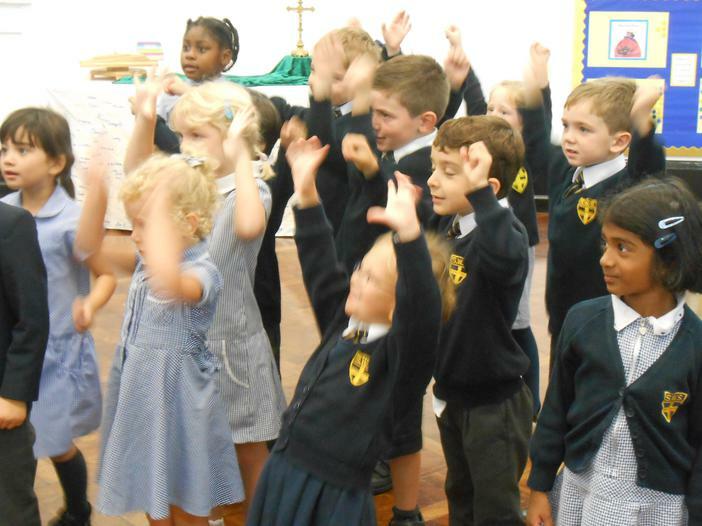 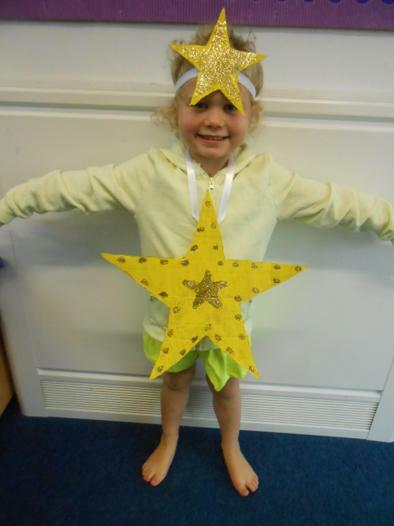 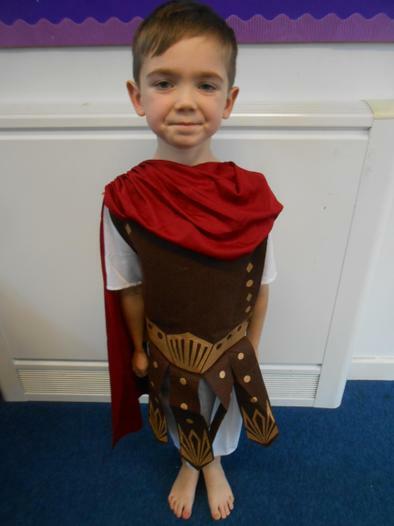 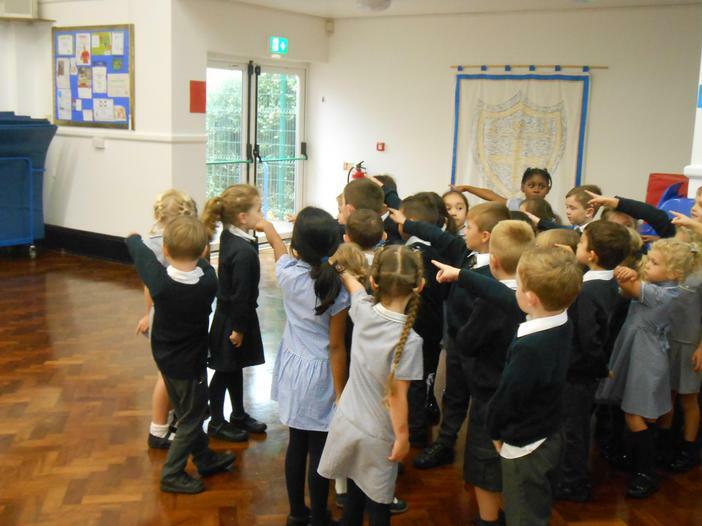 The children worked super hard at preparing their Christmas play this year. 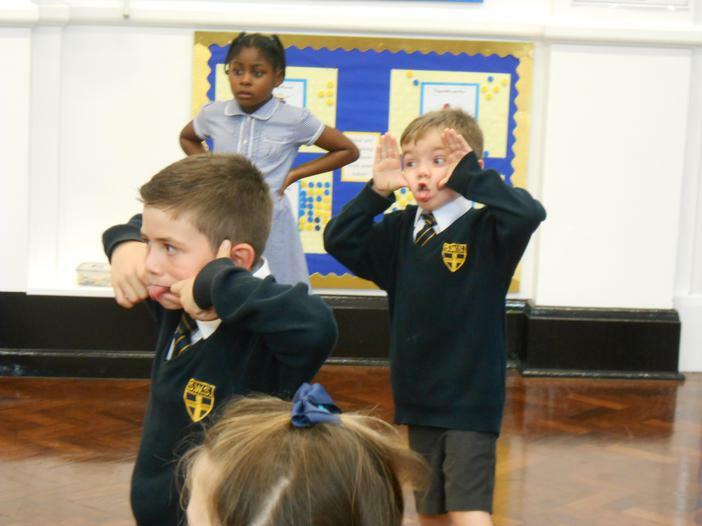 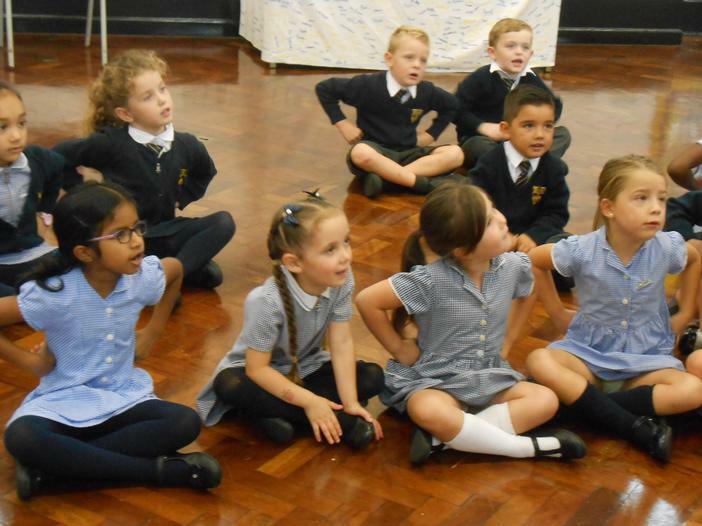 They learnt the 6 songs within 3 weeks and they started learning lines in November...all the hard work paid off as the performance was absolutely outstanding, they certainly did themselves and us proud! 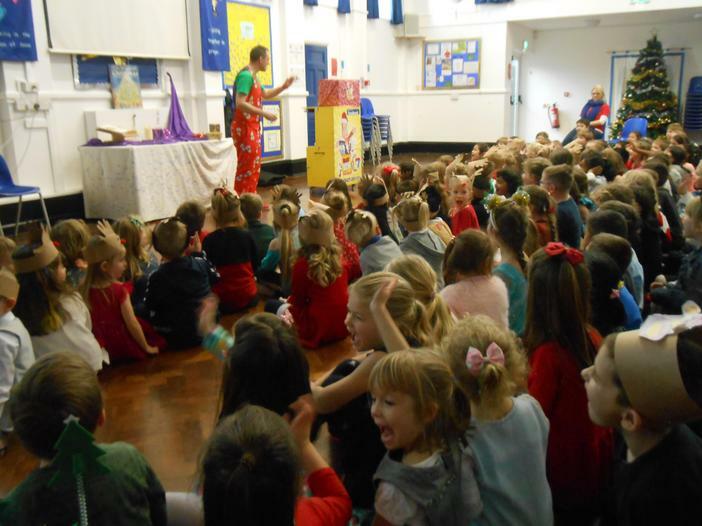 They told the story of a Midwife who was going to the birth of a king in Bethlehem, she searched for the palace but she didn't know that the baby Jesus was no ordinary King! 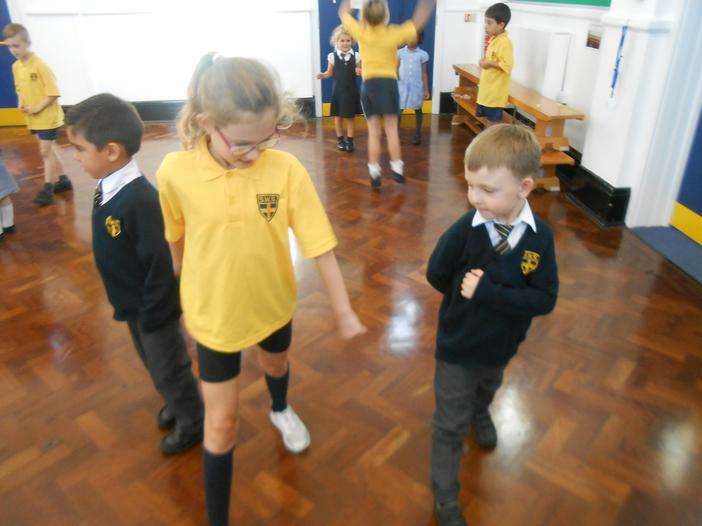 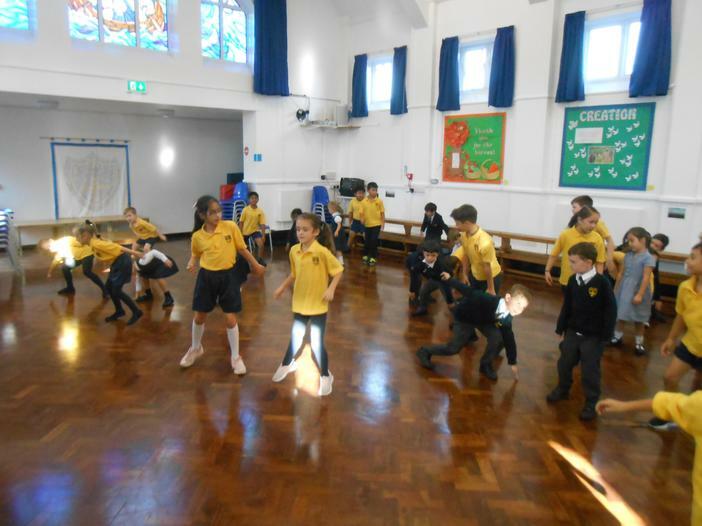 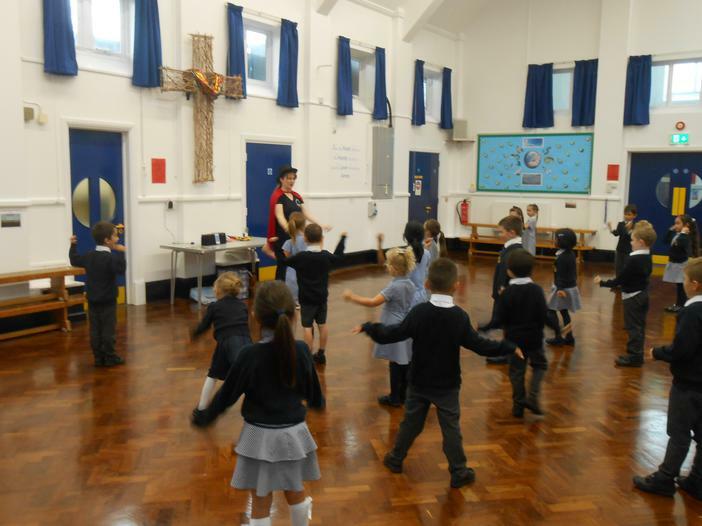 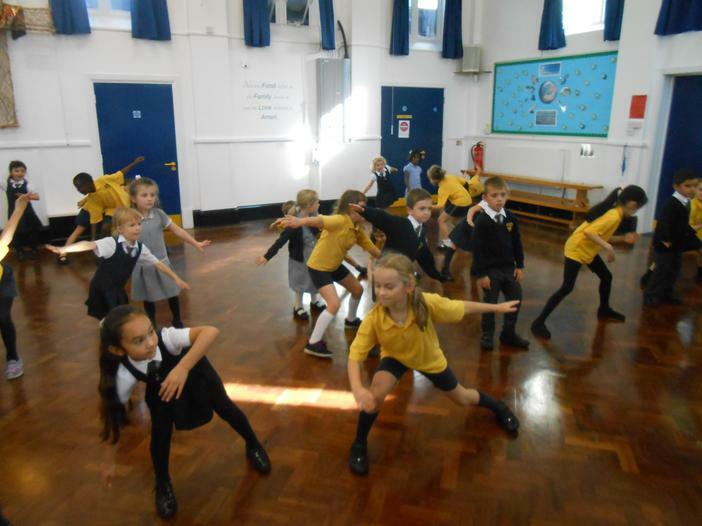 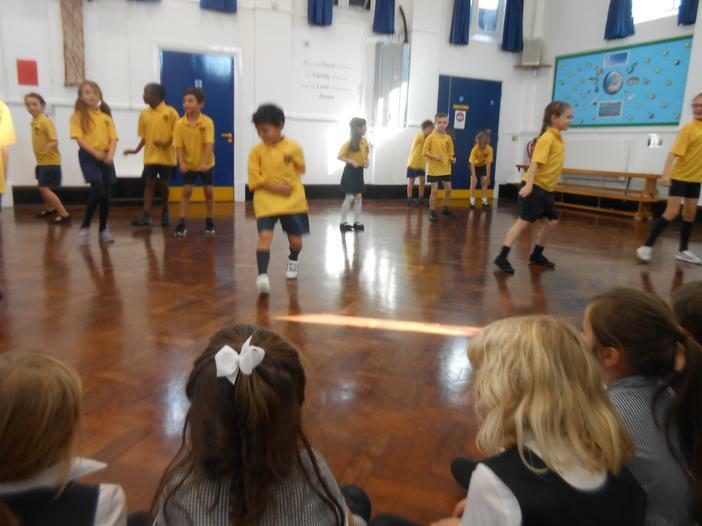 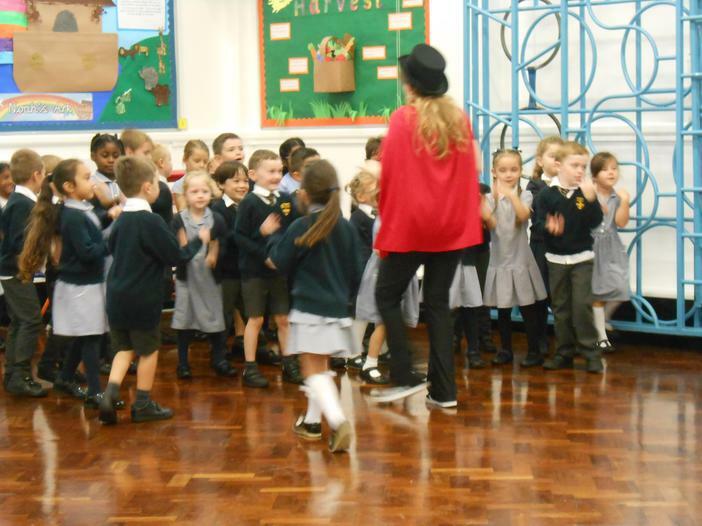 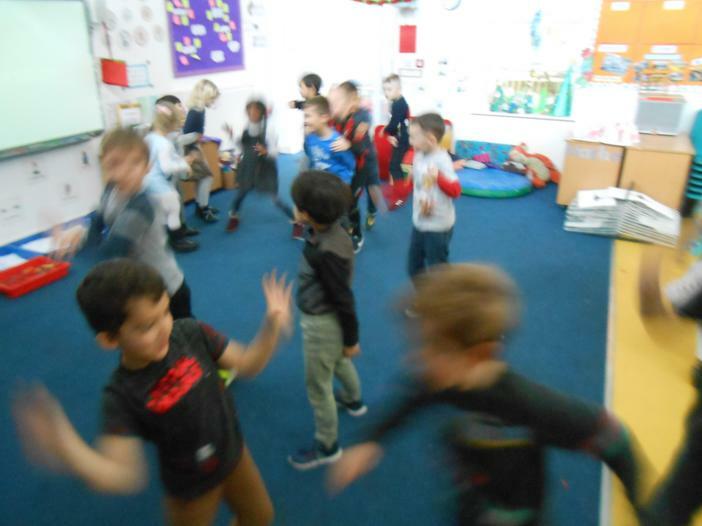 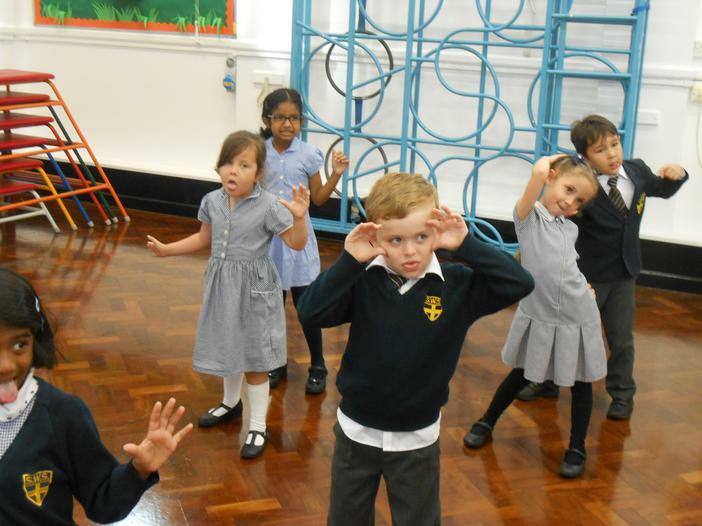 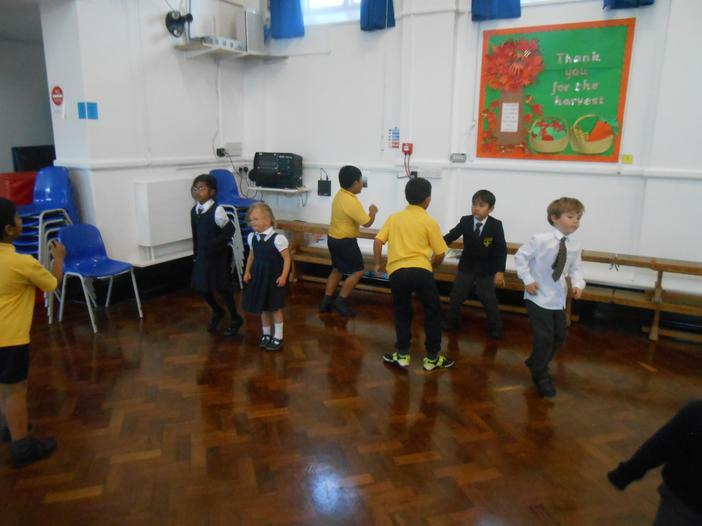 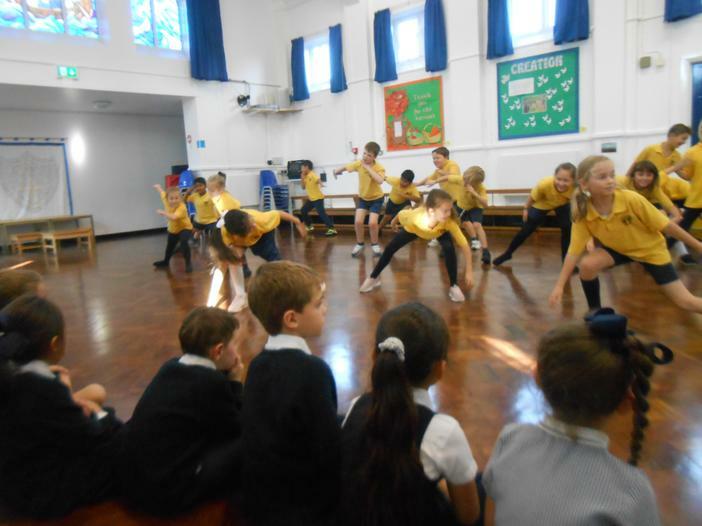 3RS invited us to watch them perform their zumba routines that they have been working on this half term. 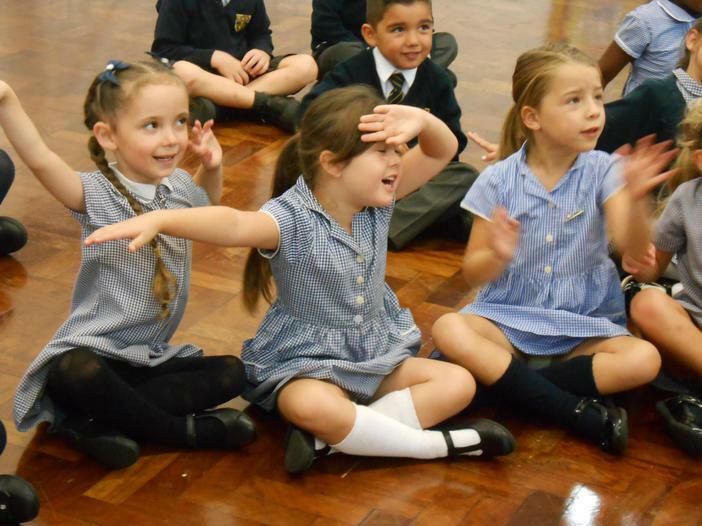 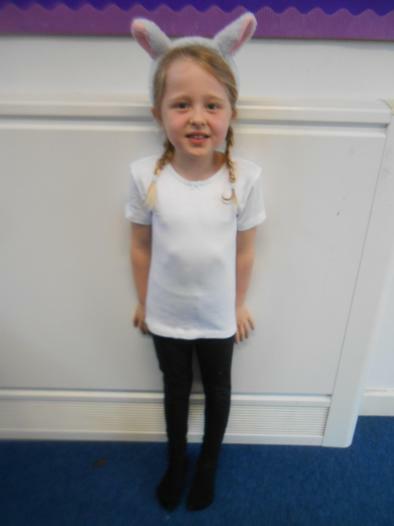 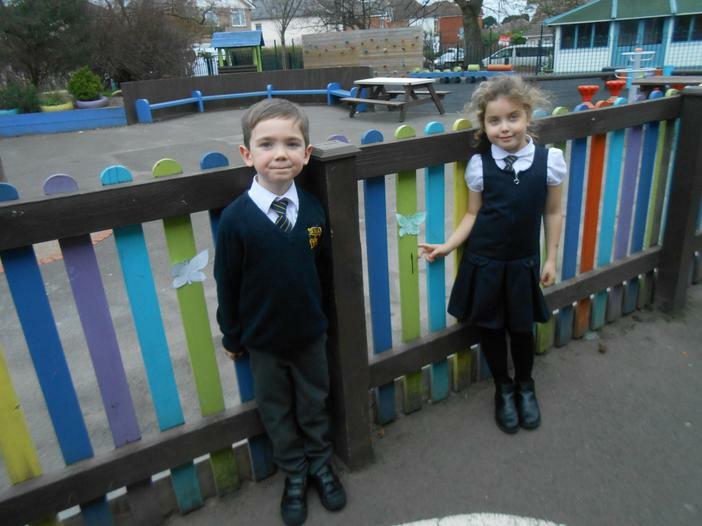 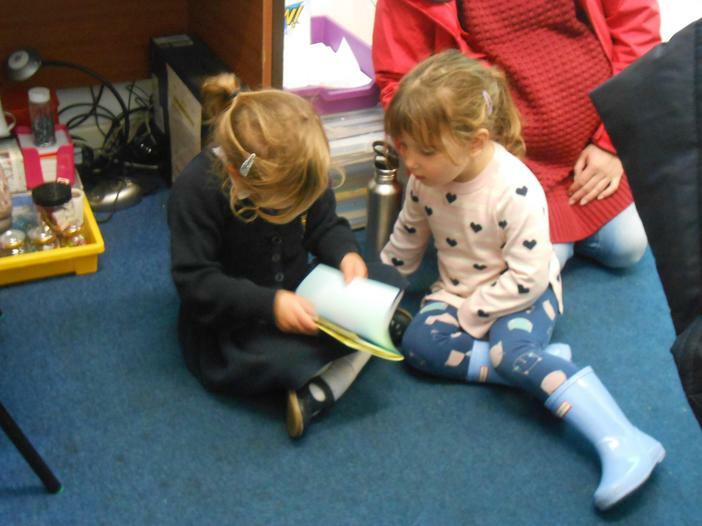 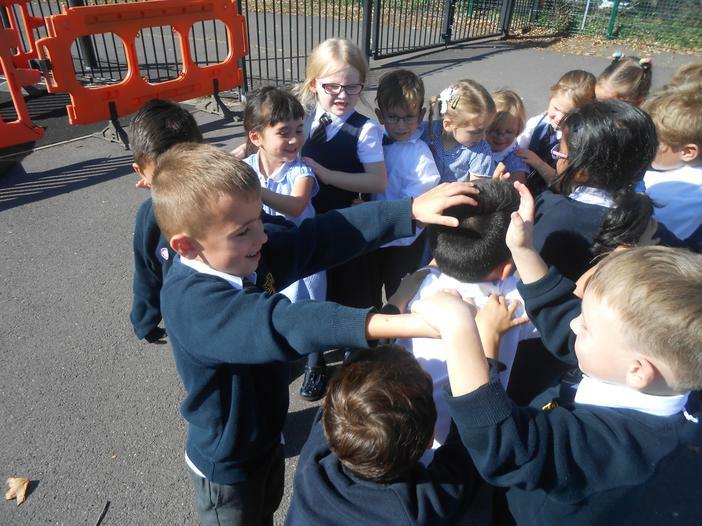 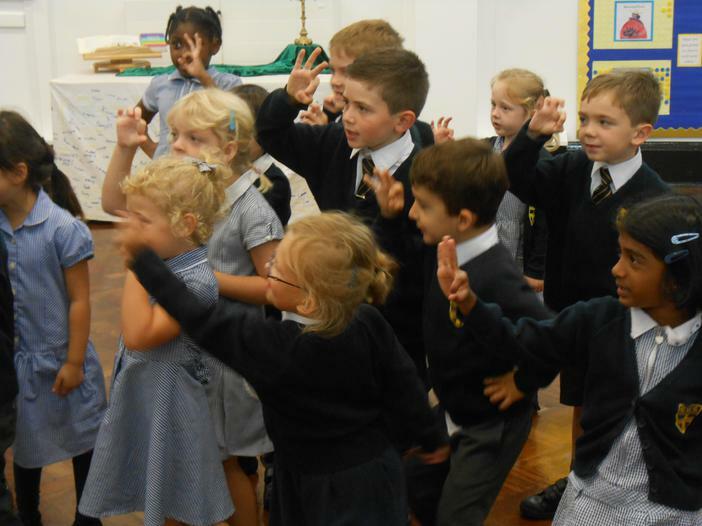 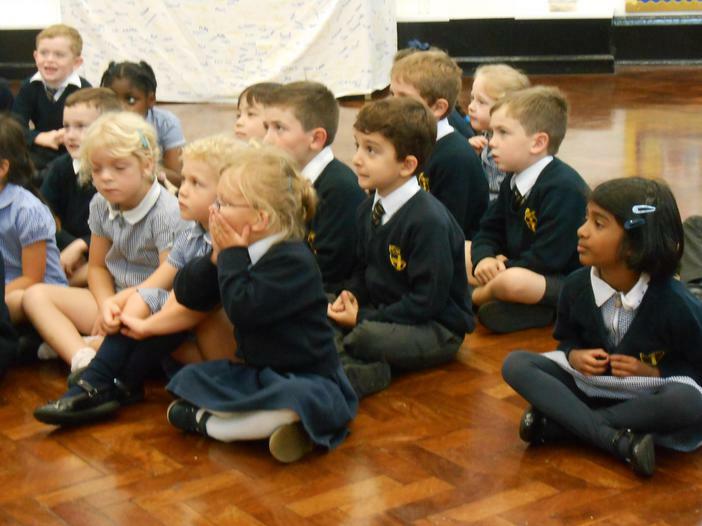 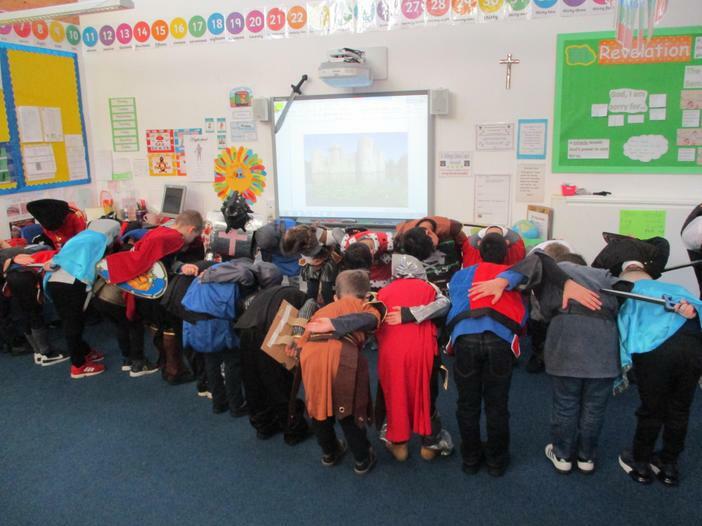 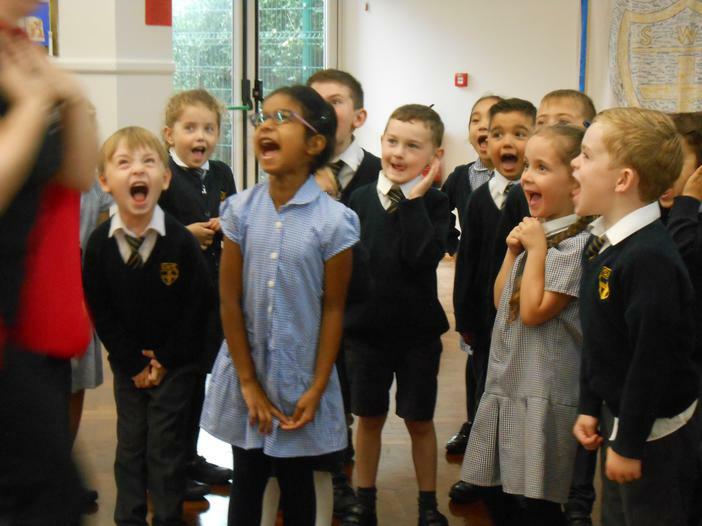 We can not believe that we have come to the end of our first half term in Year 1! 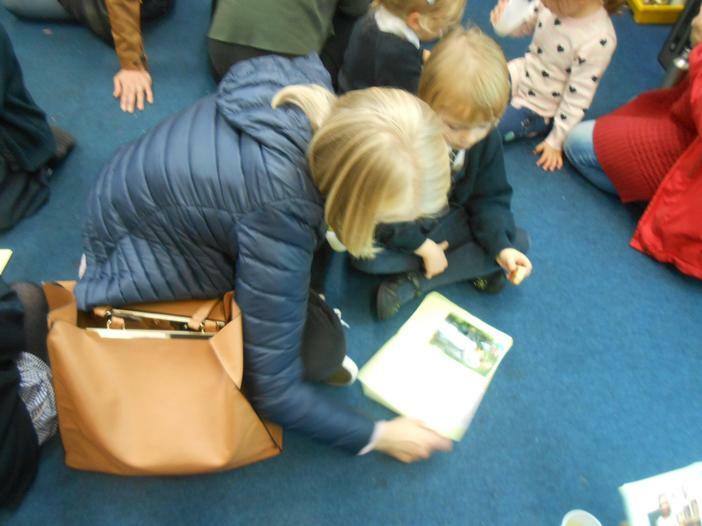 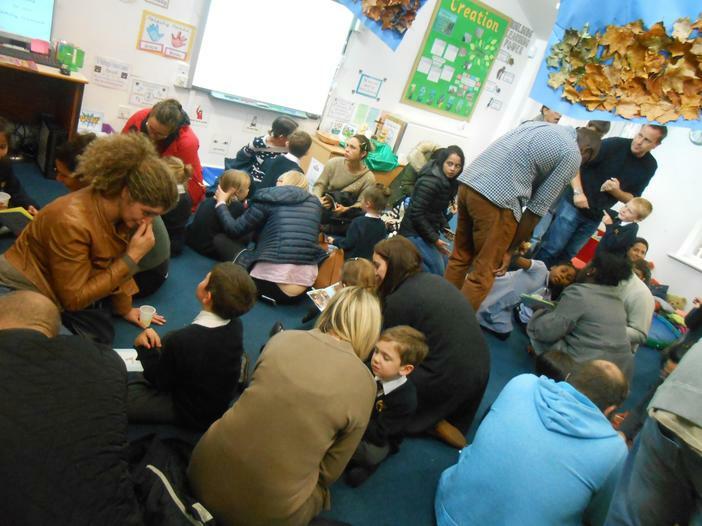 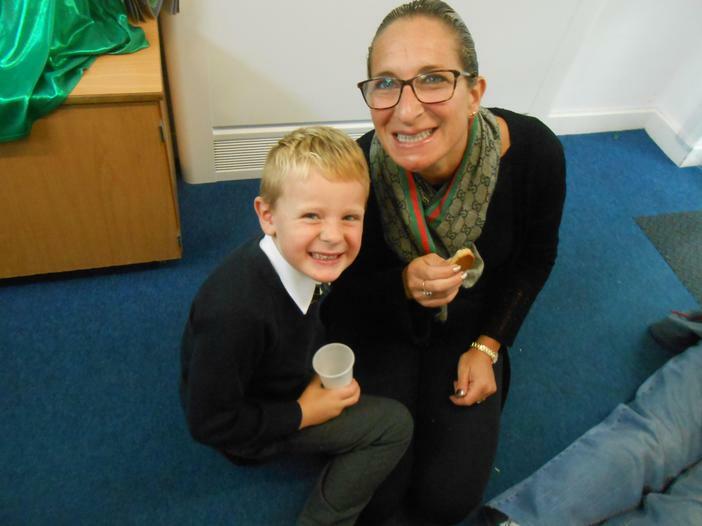 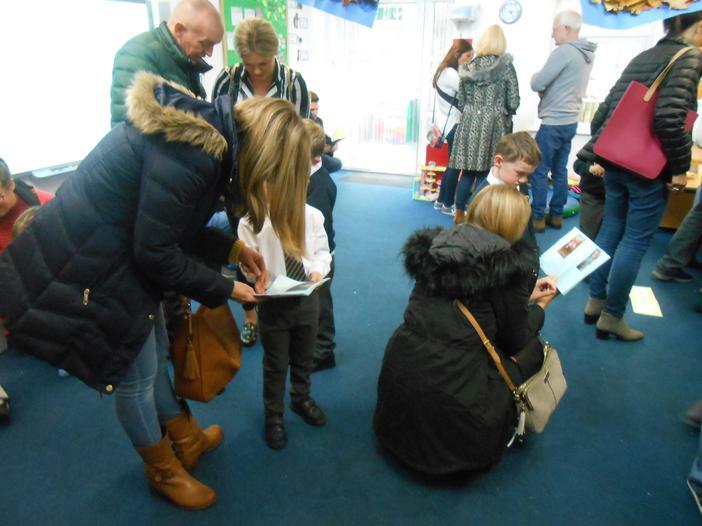 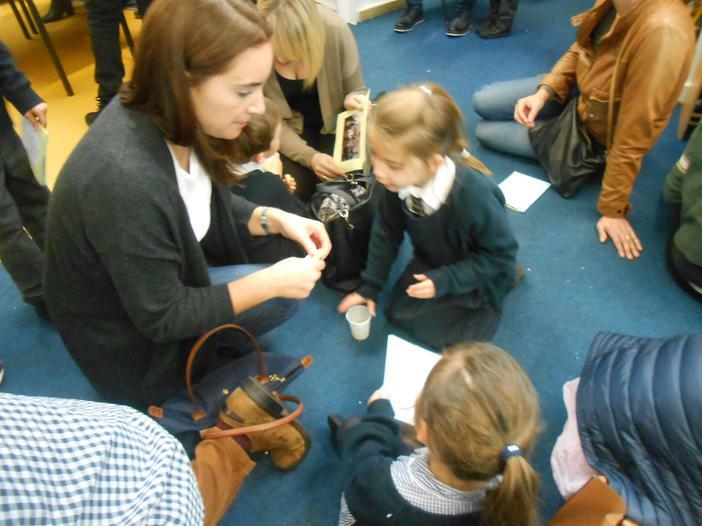 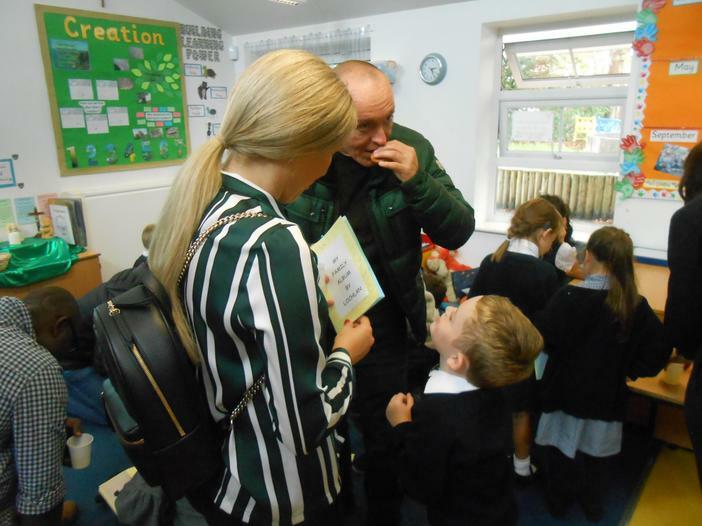 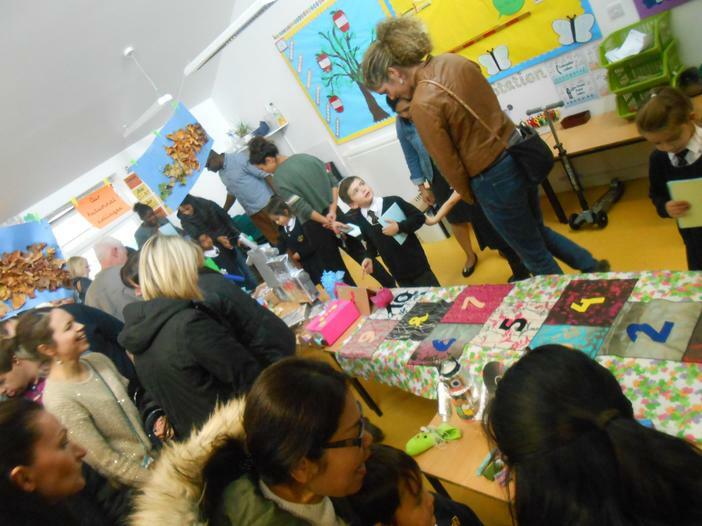 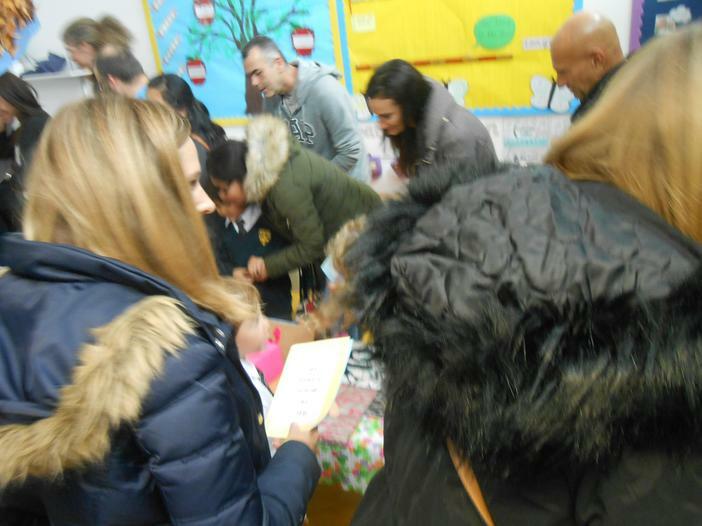 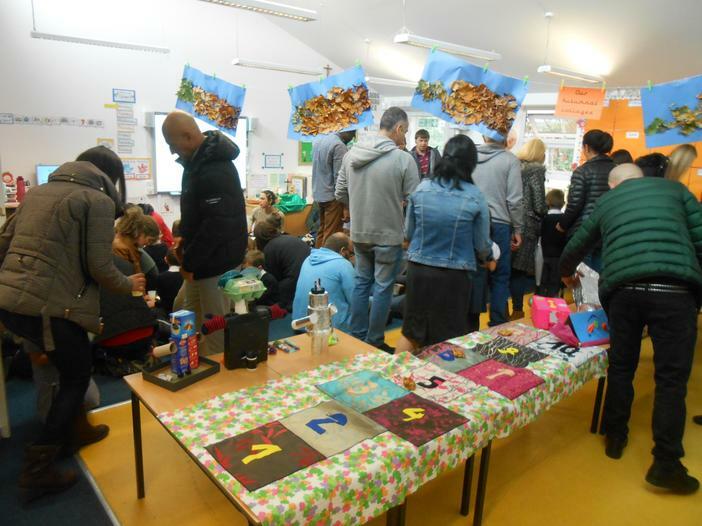 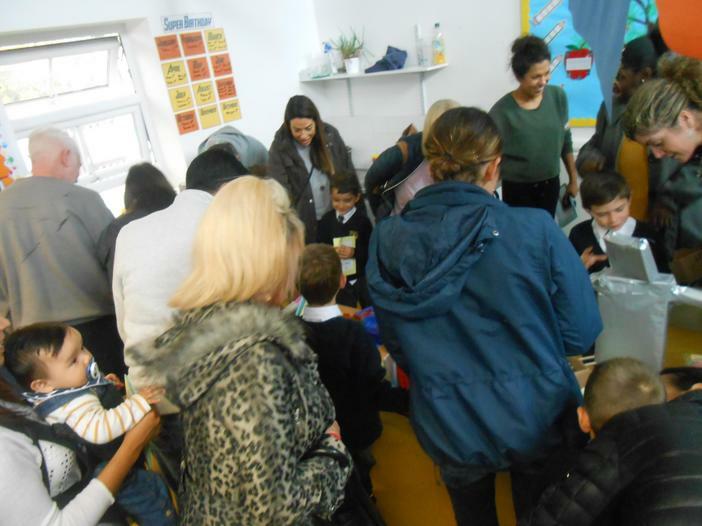 We celebrated by inviting our parents in to see our family museum. 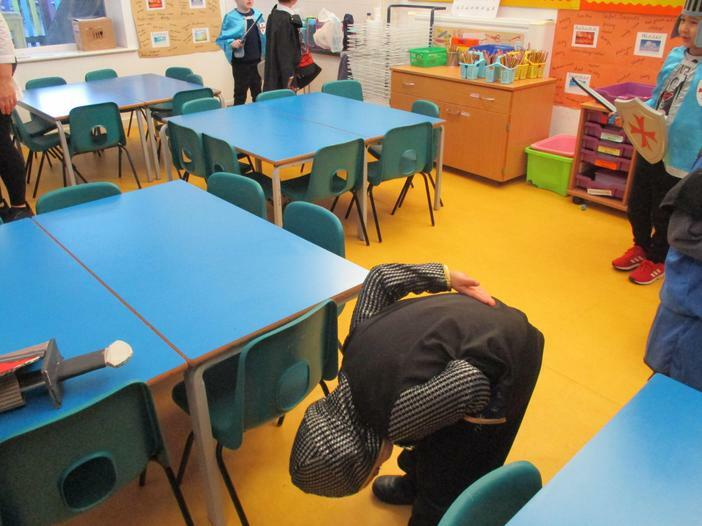 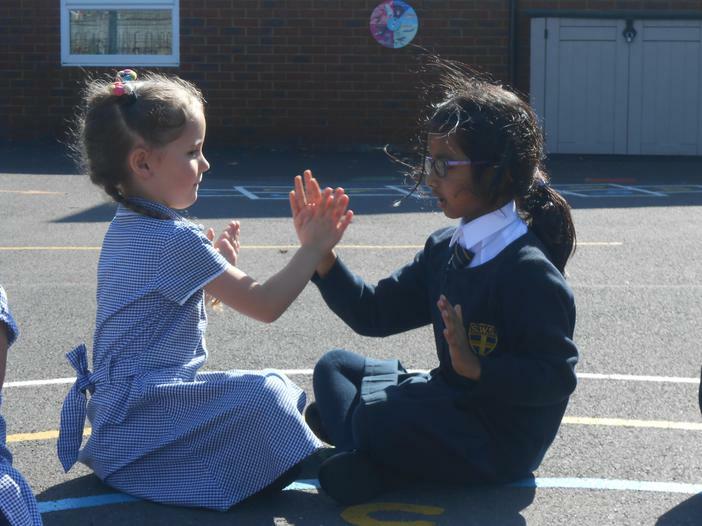 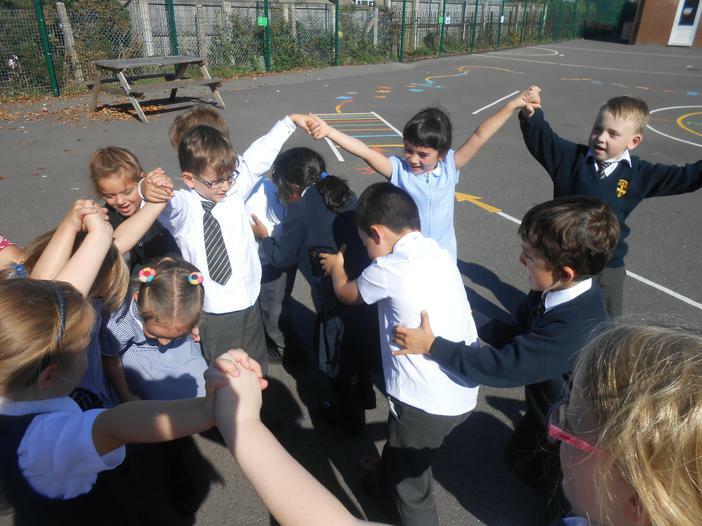 We started off by performing one of the playground chants we learnt during this half term, some of us already knew it...we found it amazing that playground games from 100 years ago are still used today! 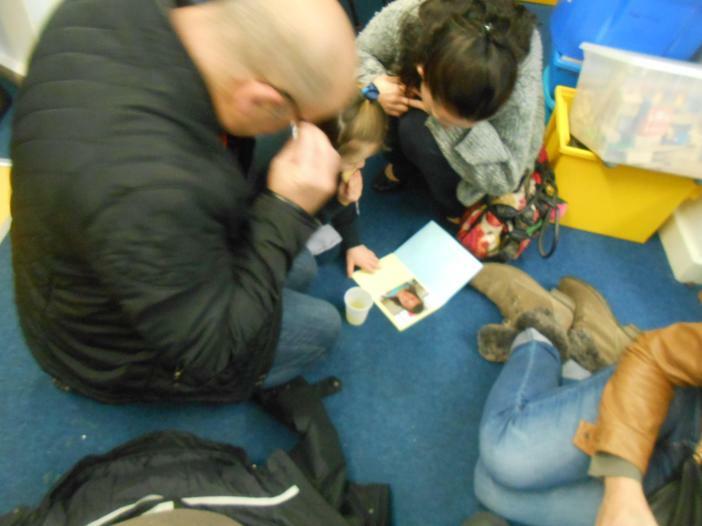 Family photo albums where we had stuck photographs of our family members and then wrote captions for them. 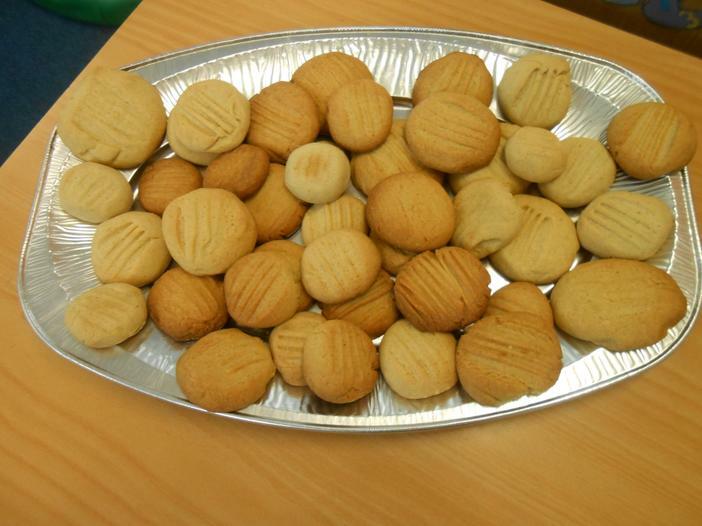 Ginger biscuits we had made from a recipe aged over 100 years, they were yummy! 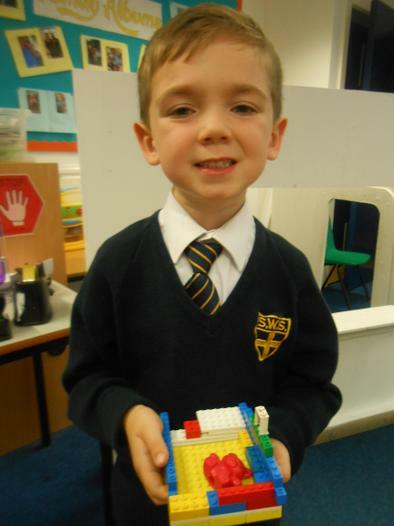 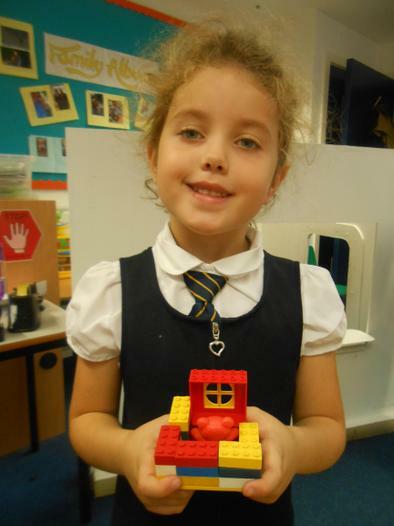 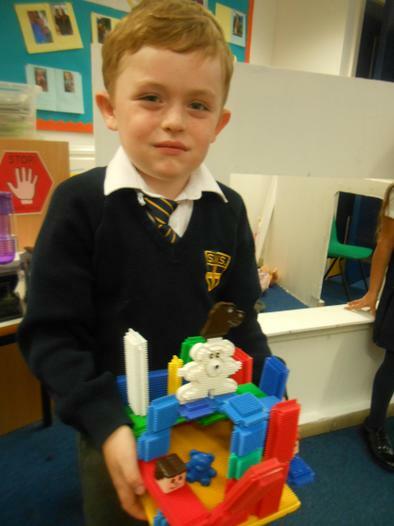 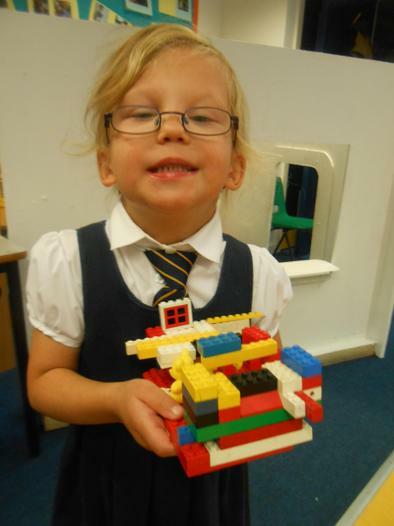 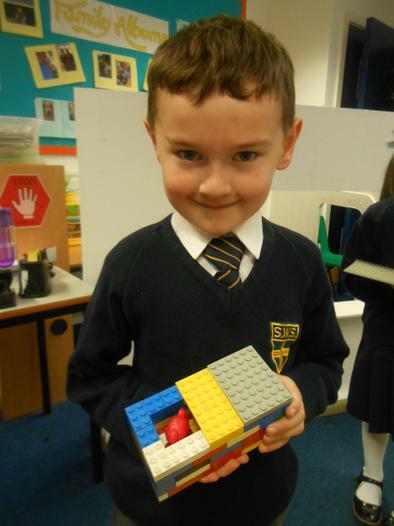 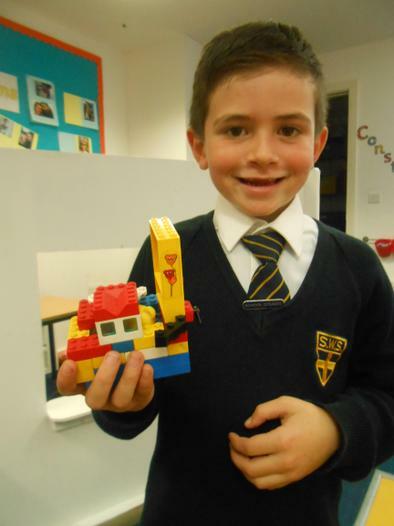 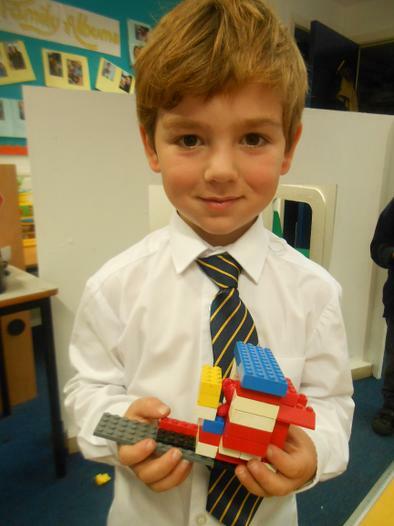 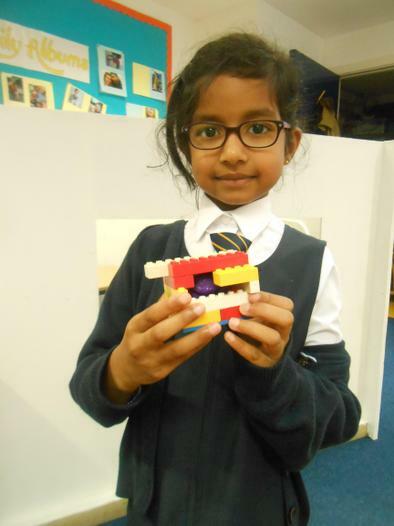 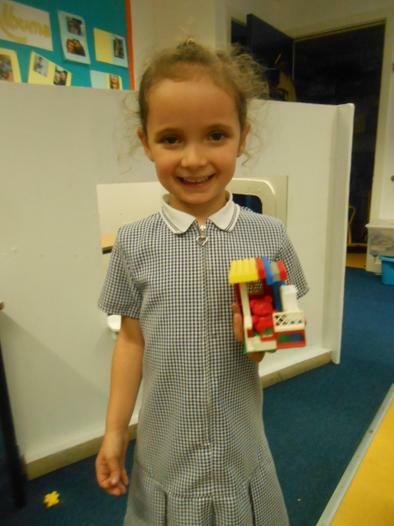 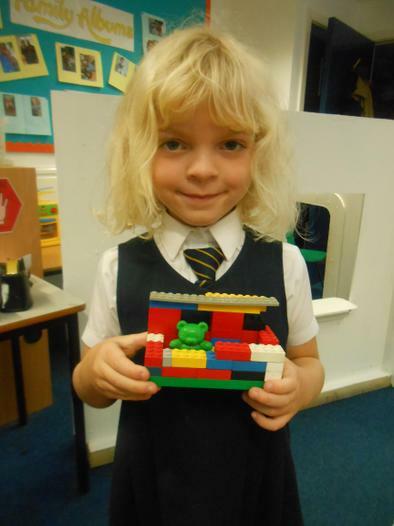 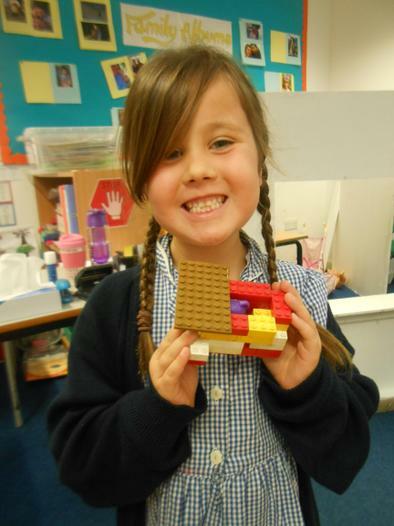 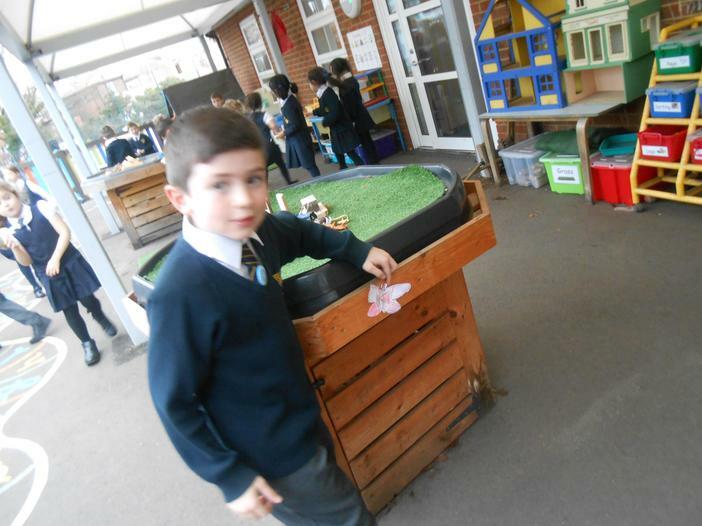 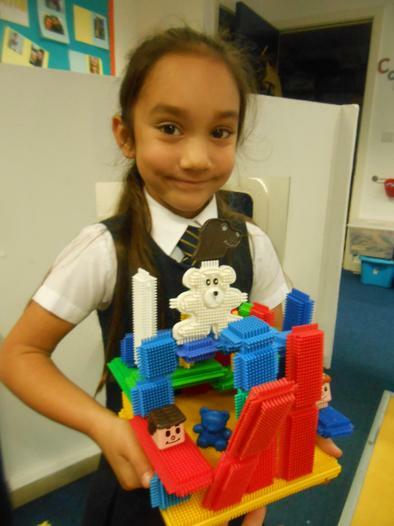 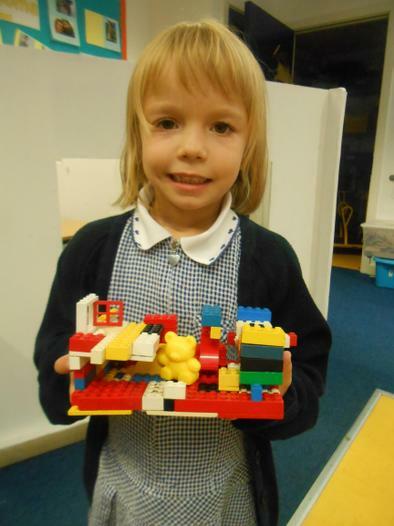 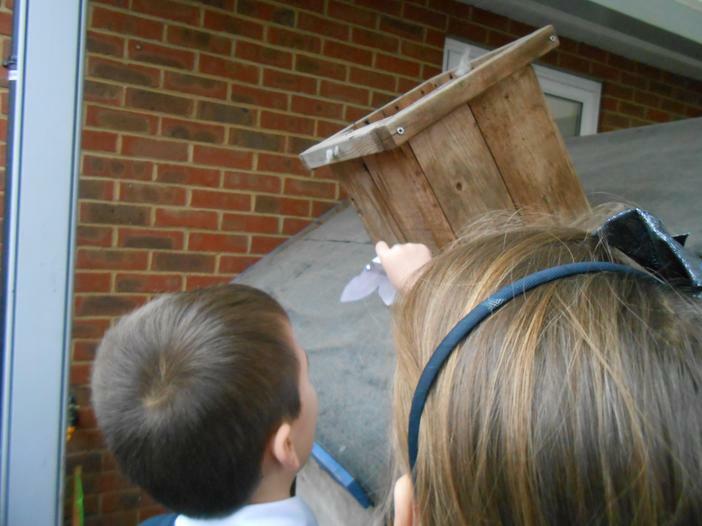 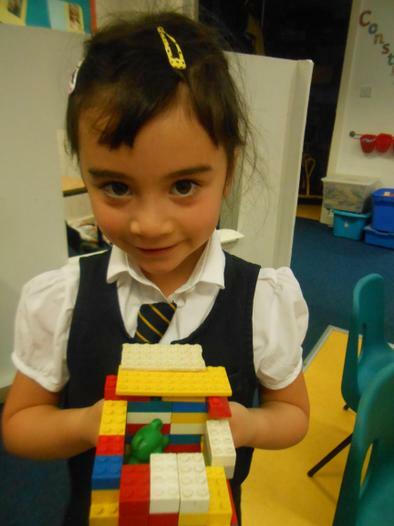 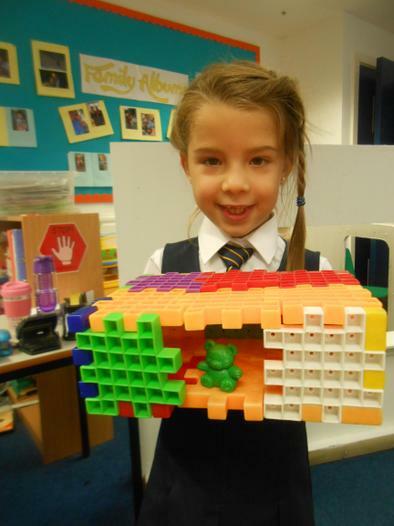 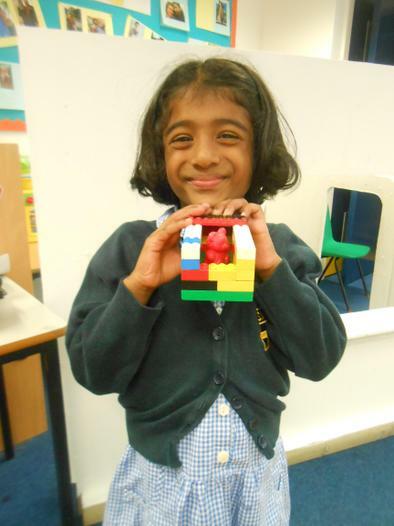 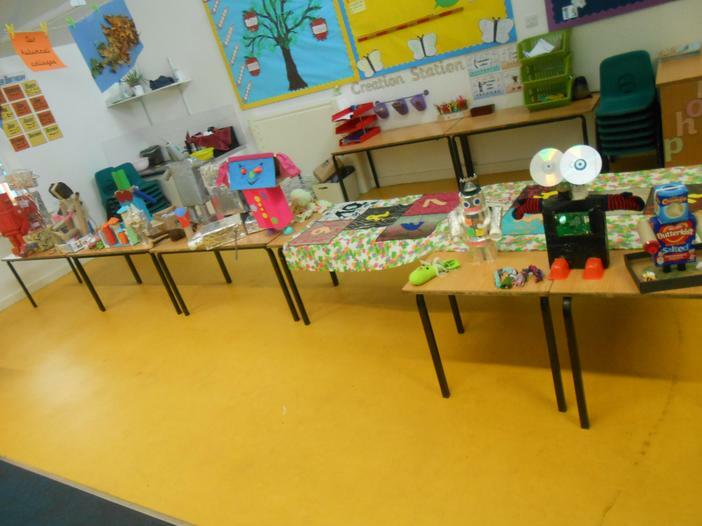 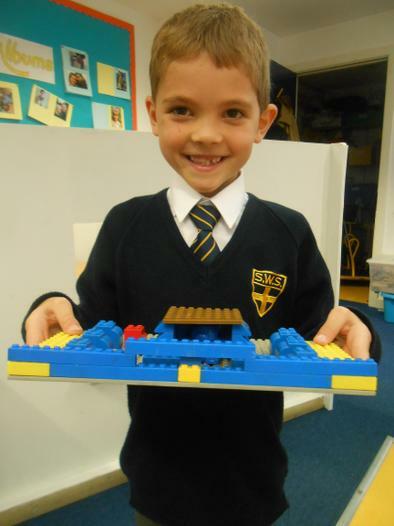 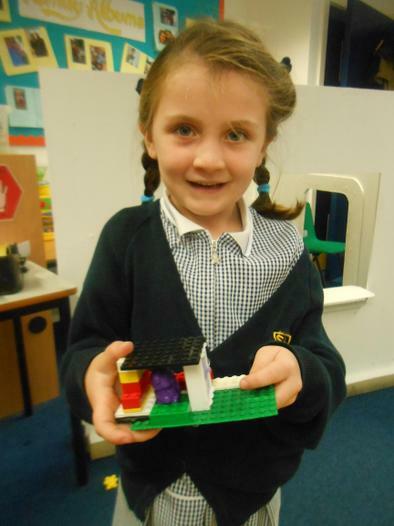 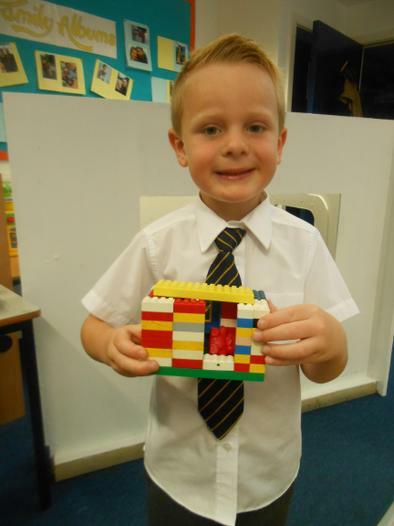 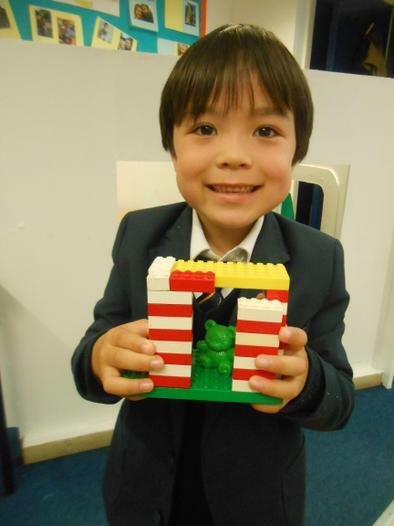 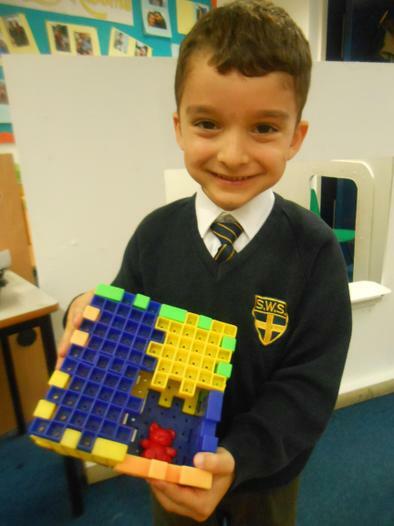 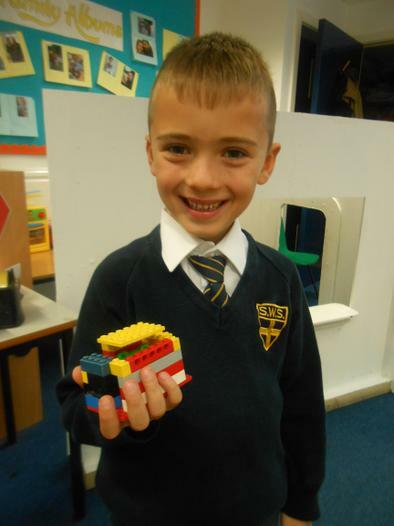 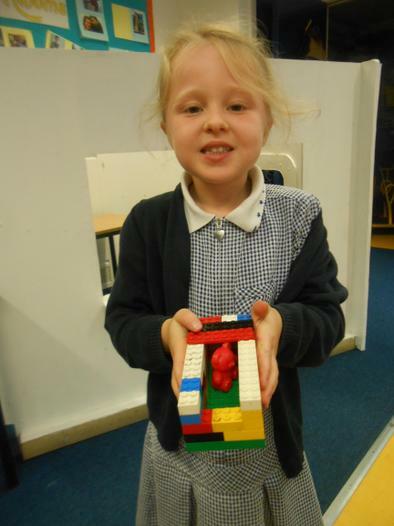 We also looked around all of our old style toys that we made as part of our D&T home learning project. 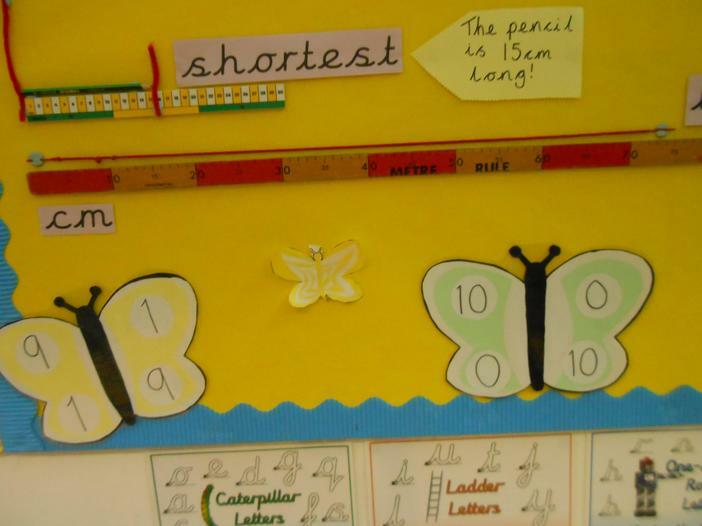 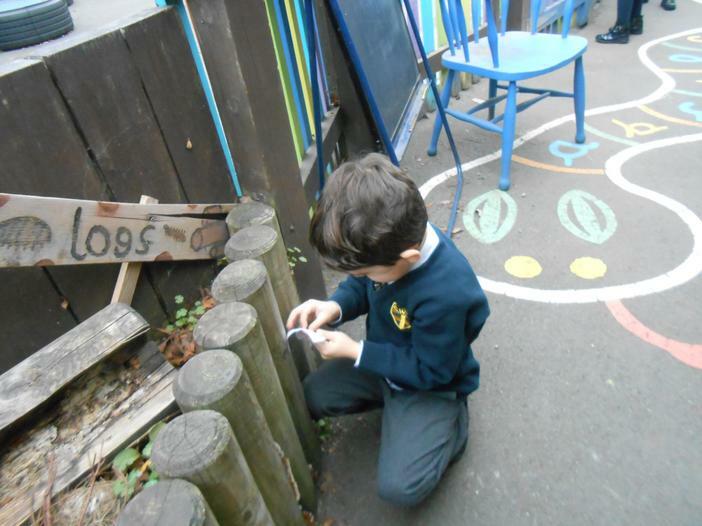 This week we have learnt that we can measure length in cm and we have begun to measure things using a ruler and recording the measurements in cm. 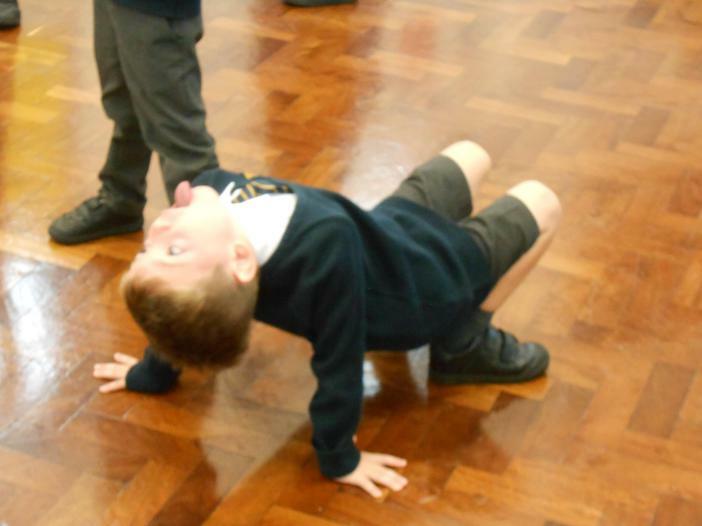 Mrs Belsham set us a challenge today. 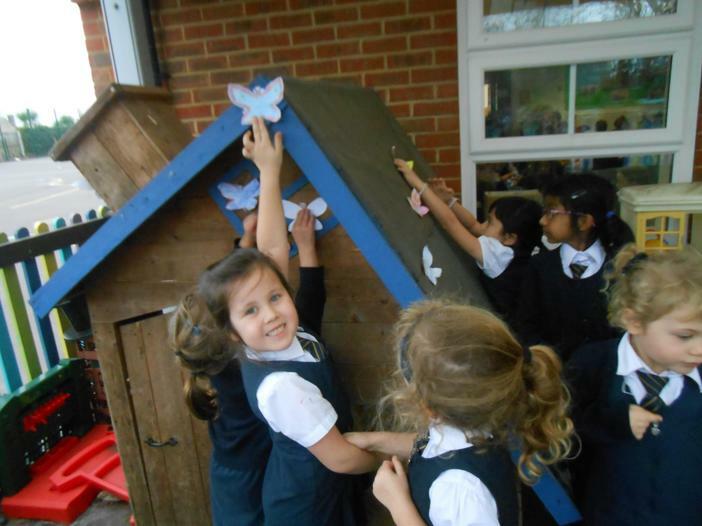 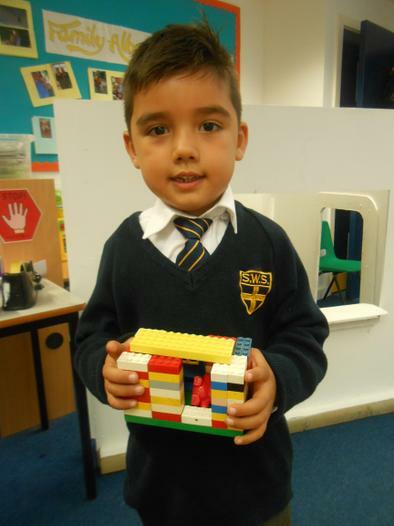 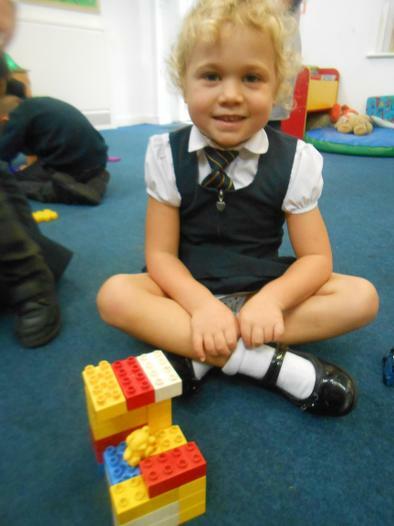 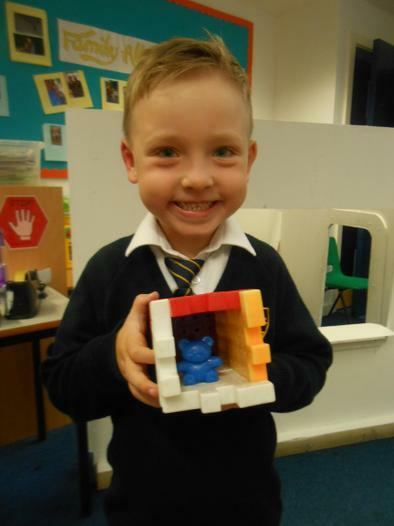 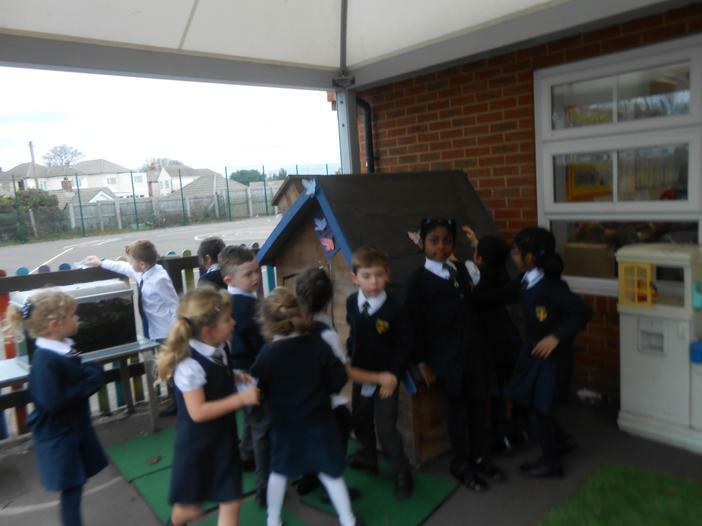 We had to build a house tall enough for a little toy bear, but to do this we had to keep checking our measurements with a ruler. 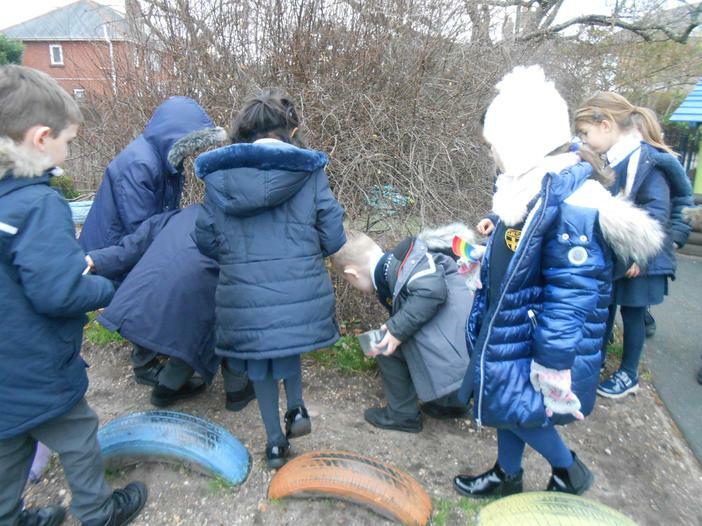 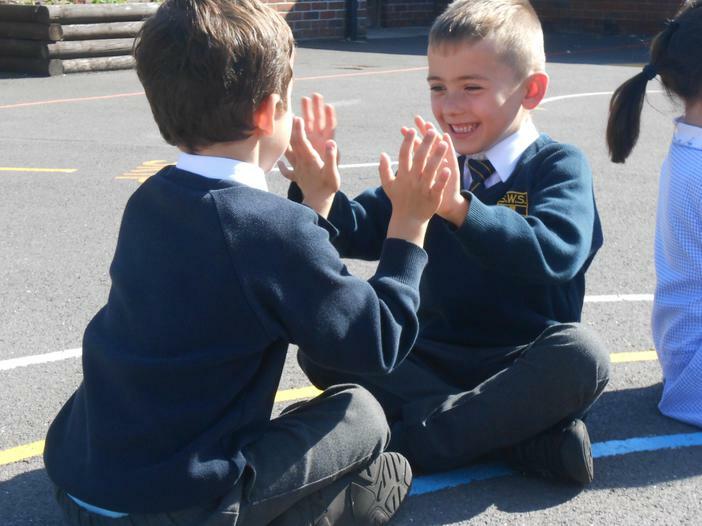 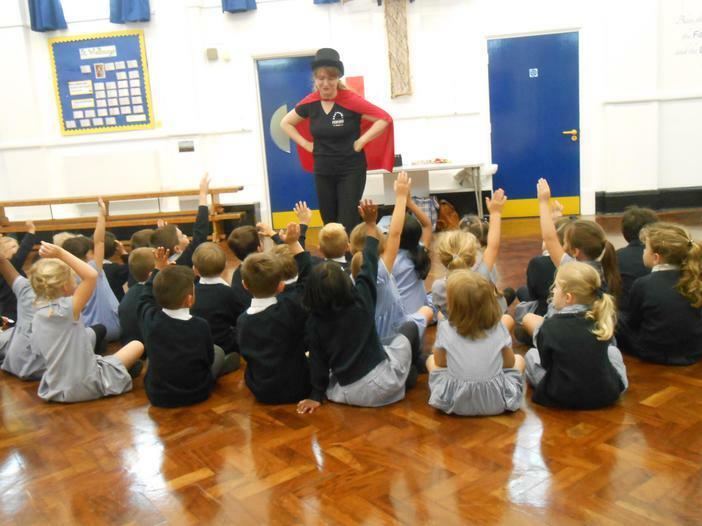 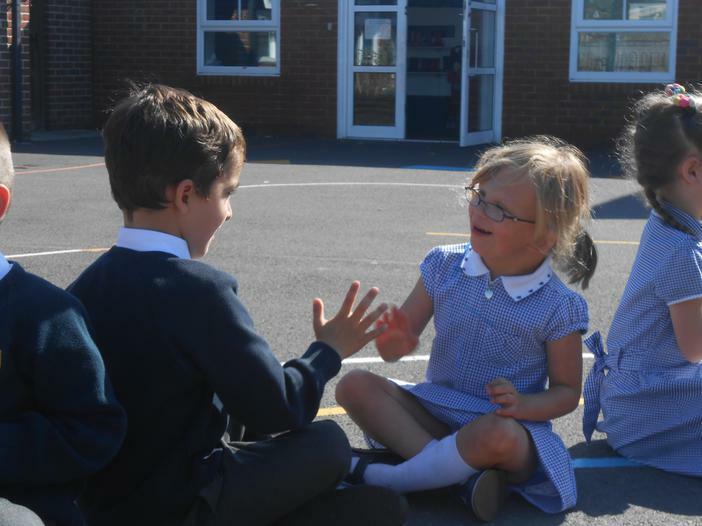 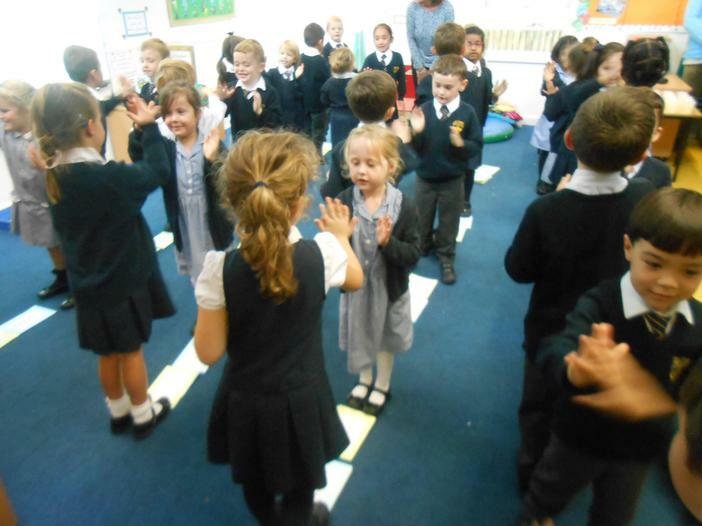 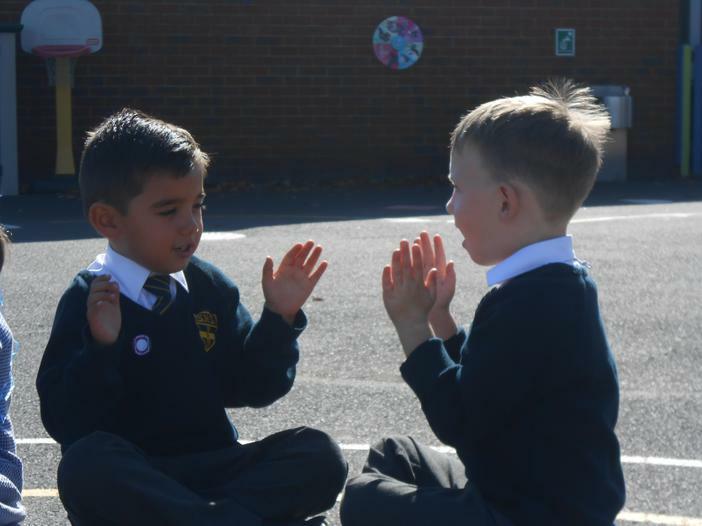 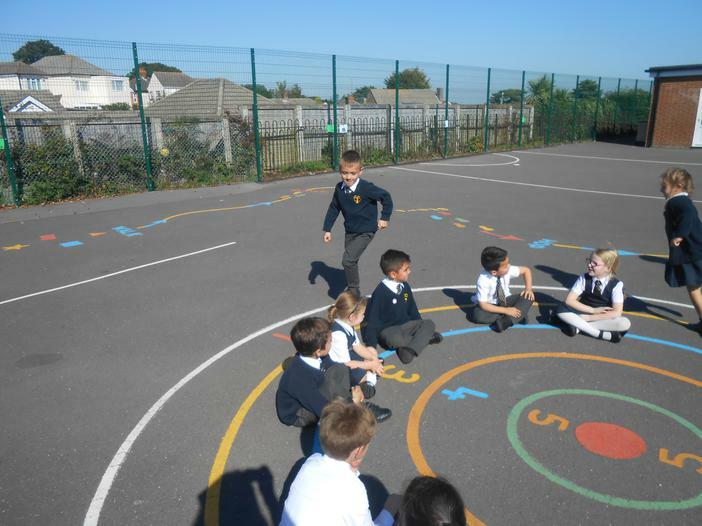 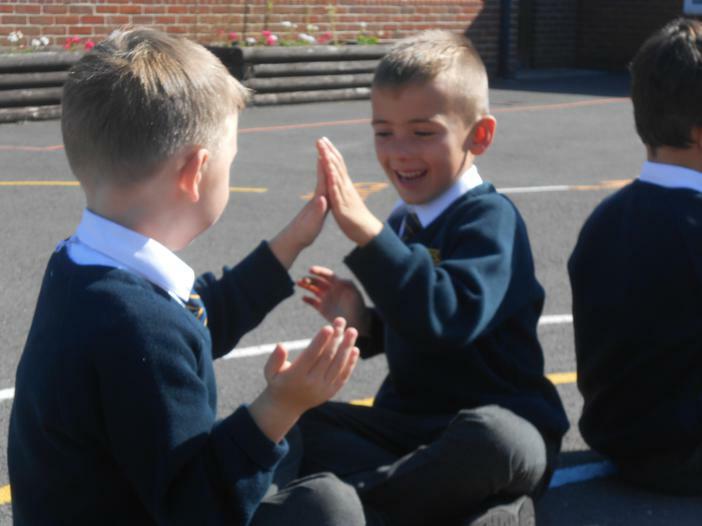 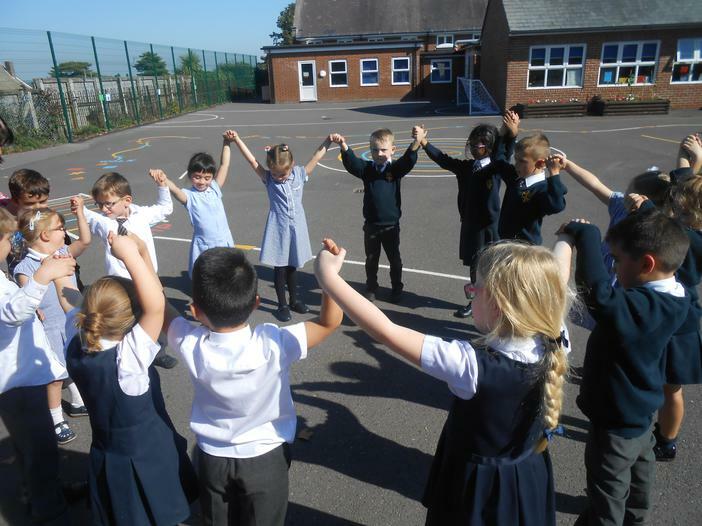 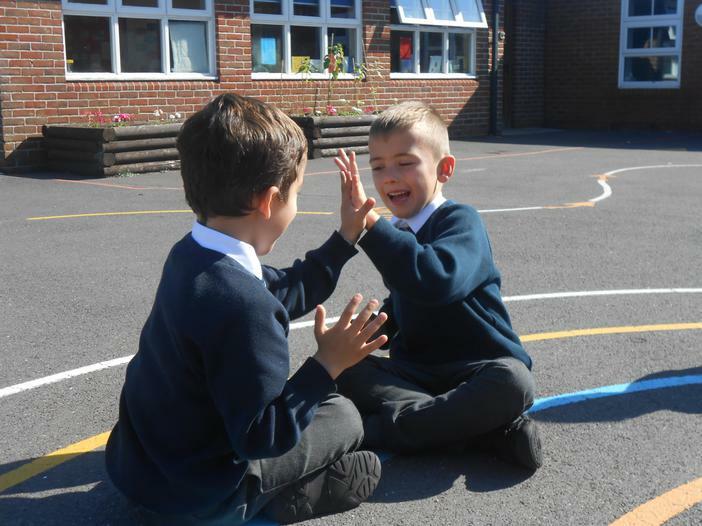 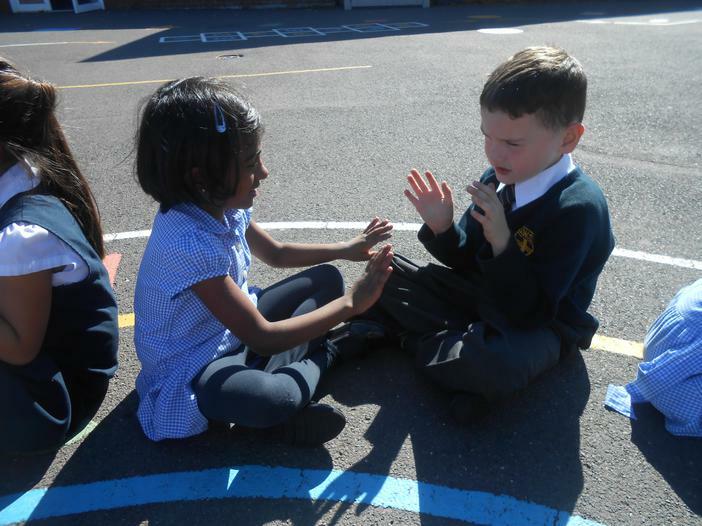 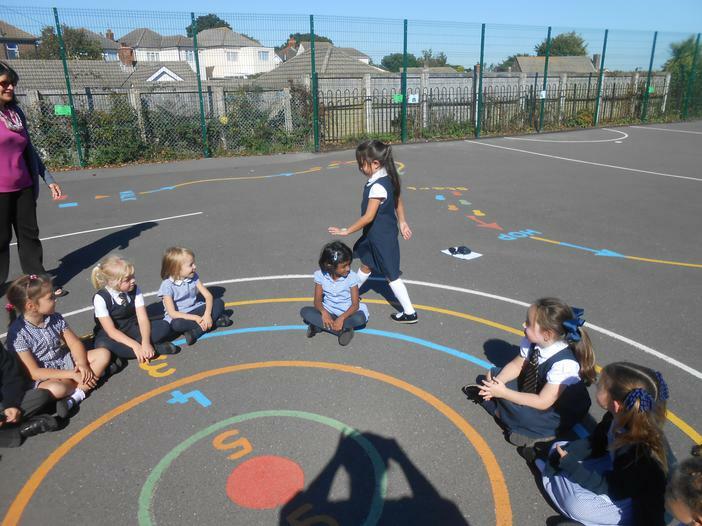 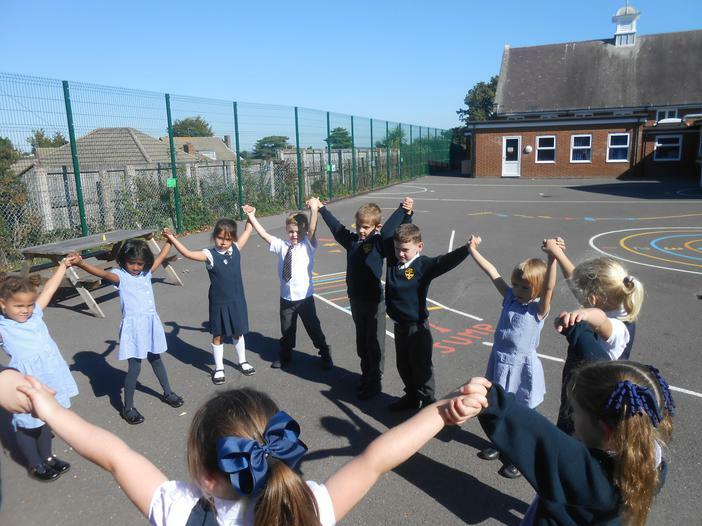 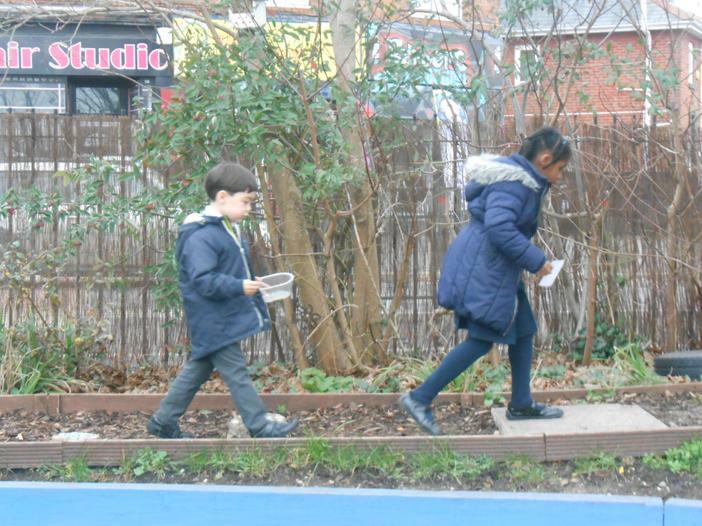 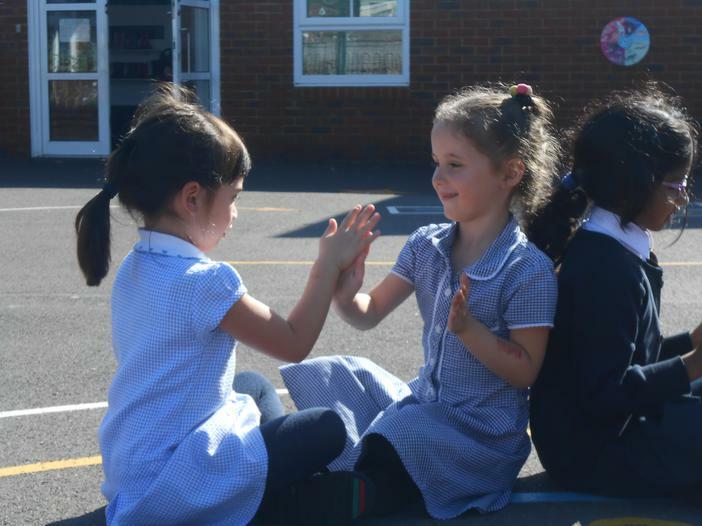 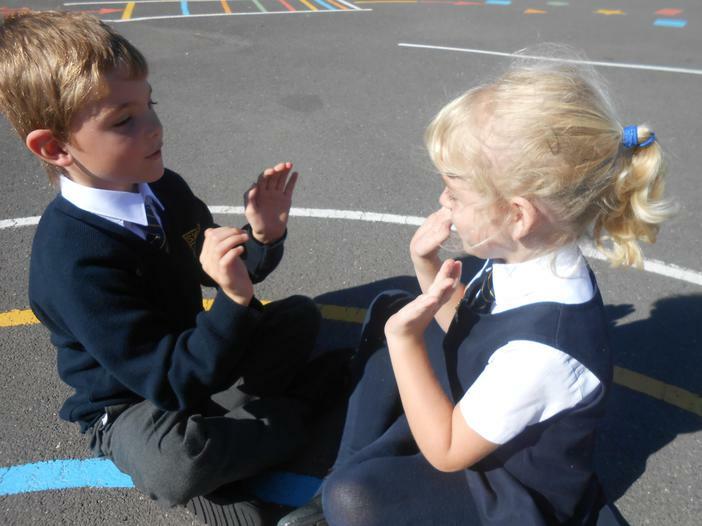 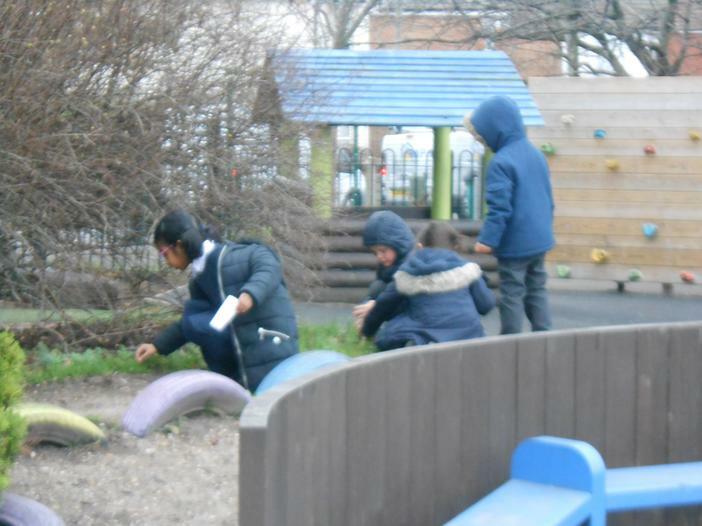 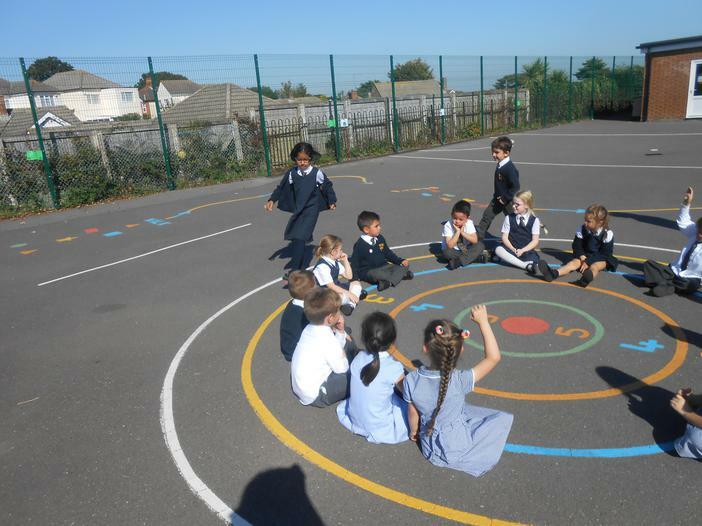 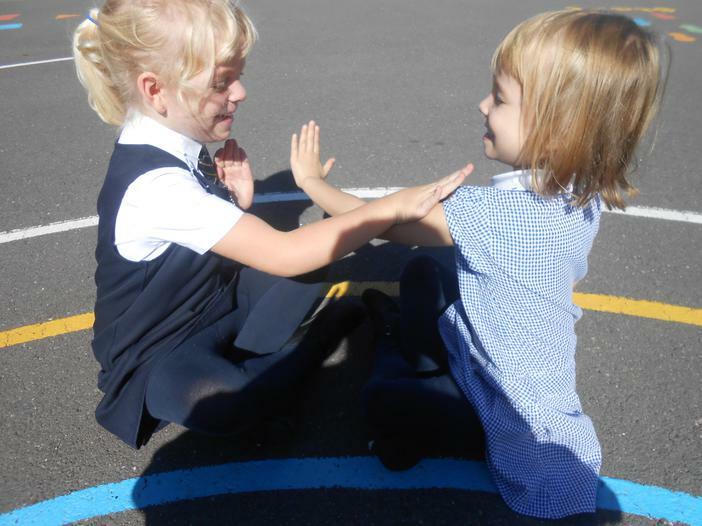 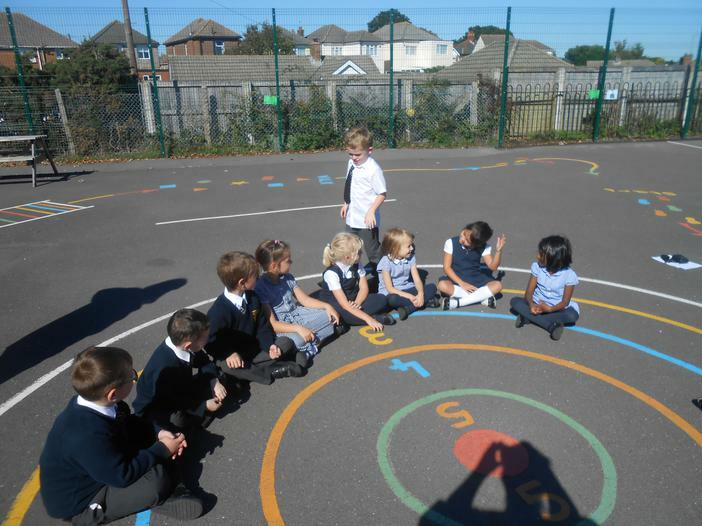 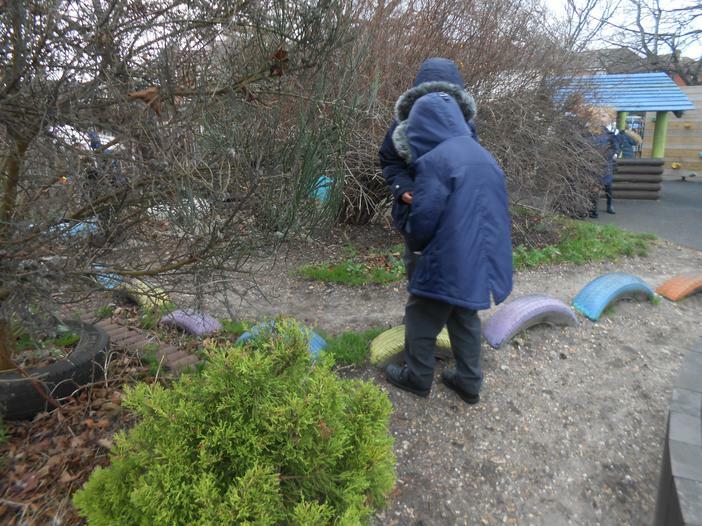 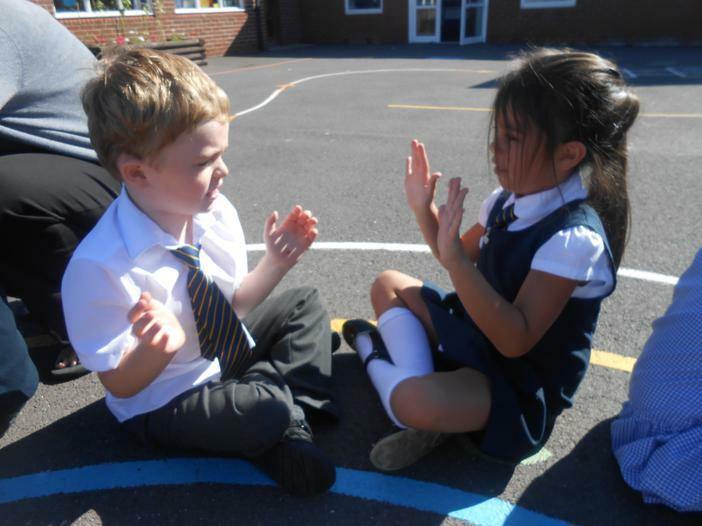 This week we've been spending time in the playground having a go at clapping chants and circle games from the past. 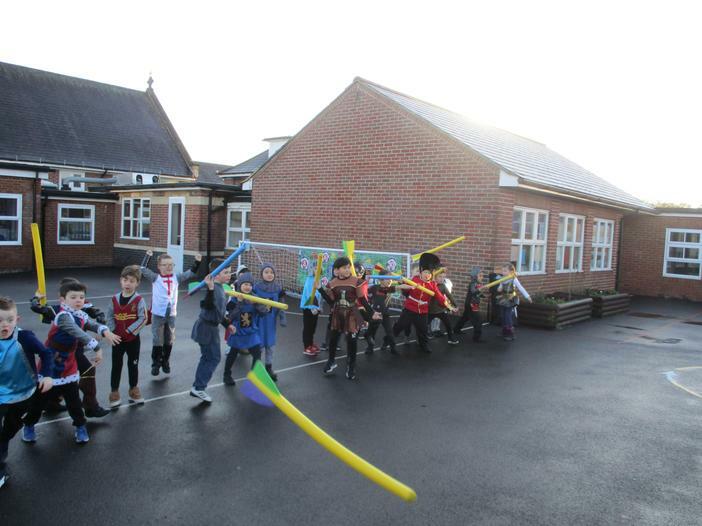 We were all amazed that these were from over 100 years ago and some of us still play them today!